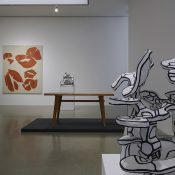 April 3 – 7 2019. 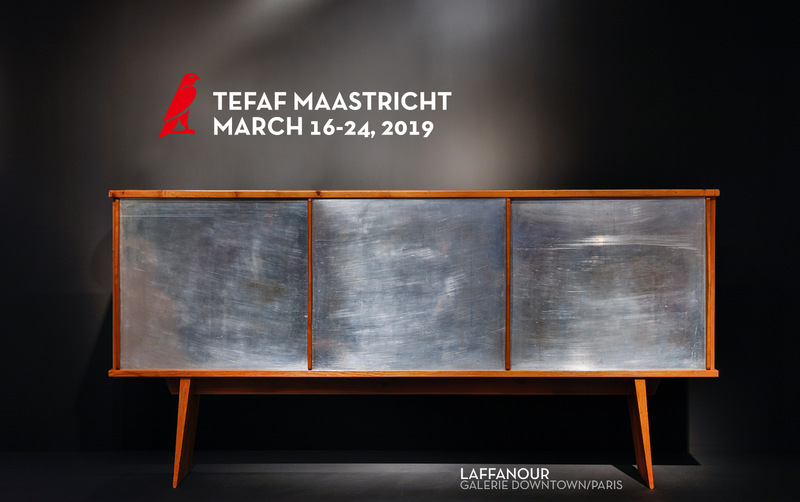 March 16 – 24 2019. 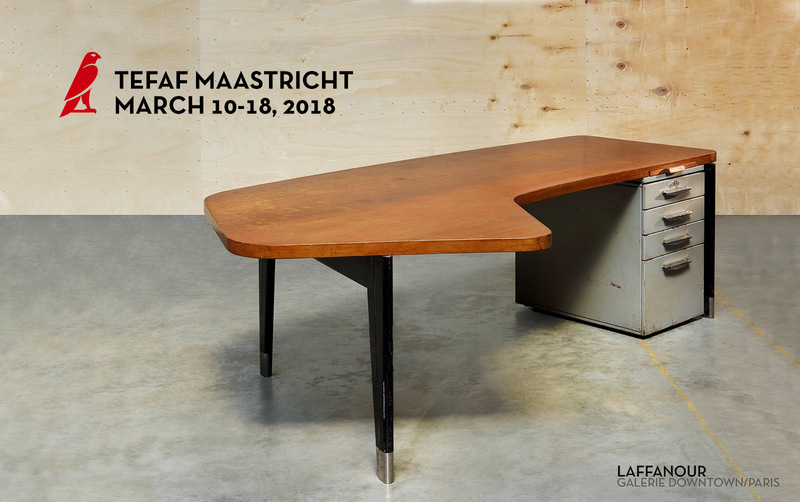 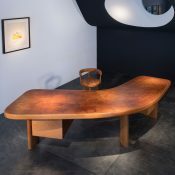 For Design Miami / Basel 2018, which gathers the biggest international design galleries in Basel, François Laffanour will present a selection of furniture. 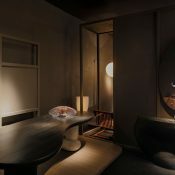 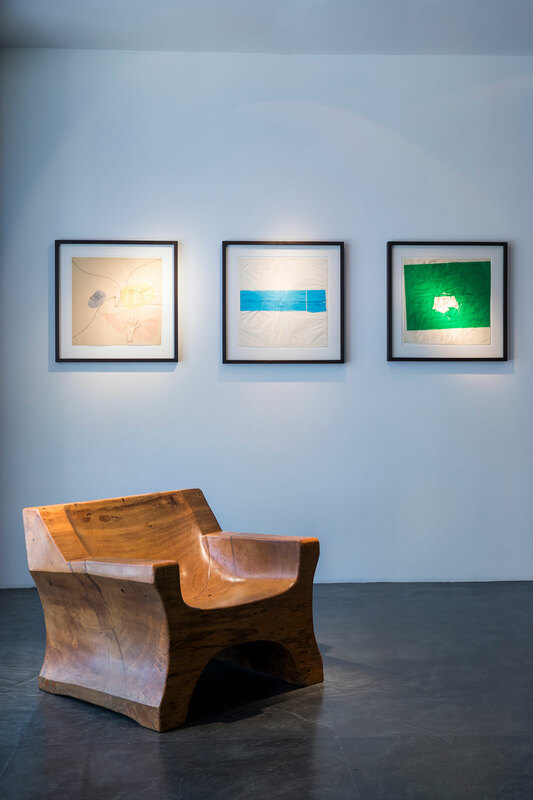 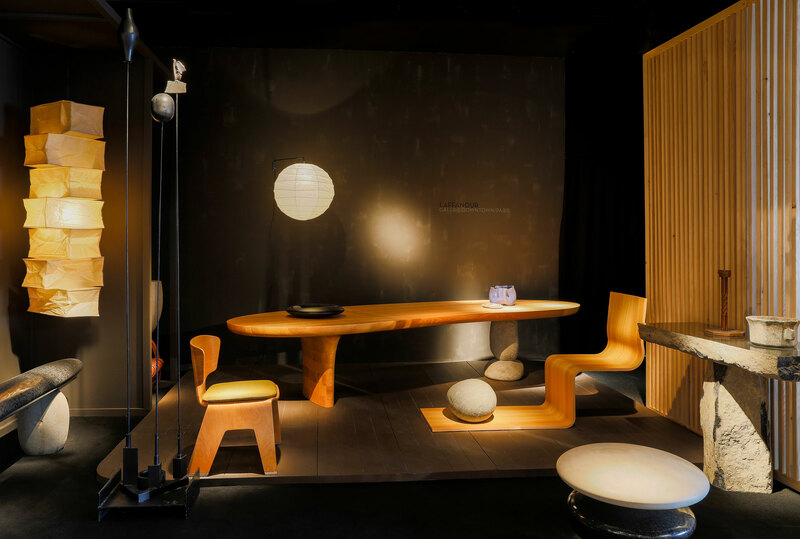 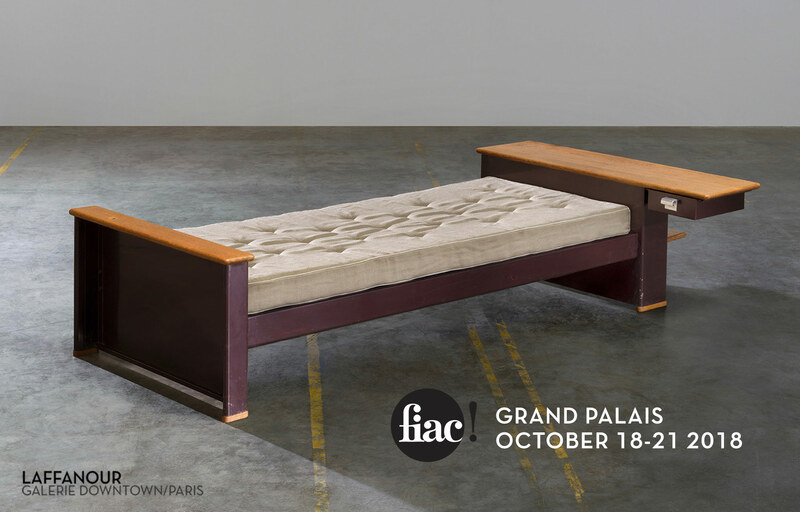 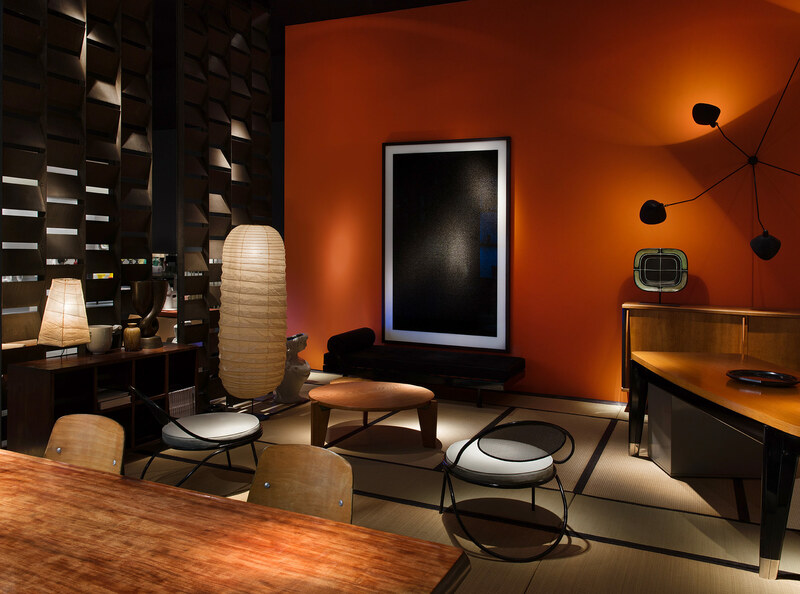 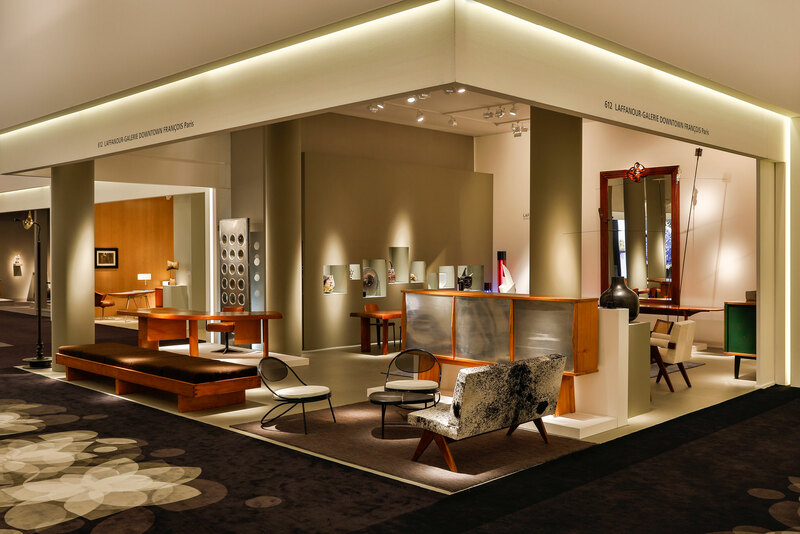 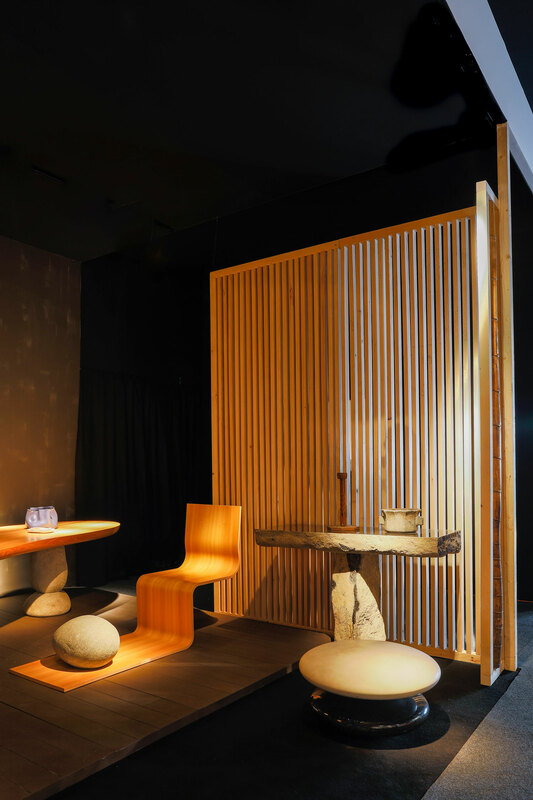 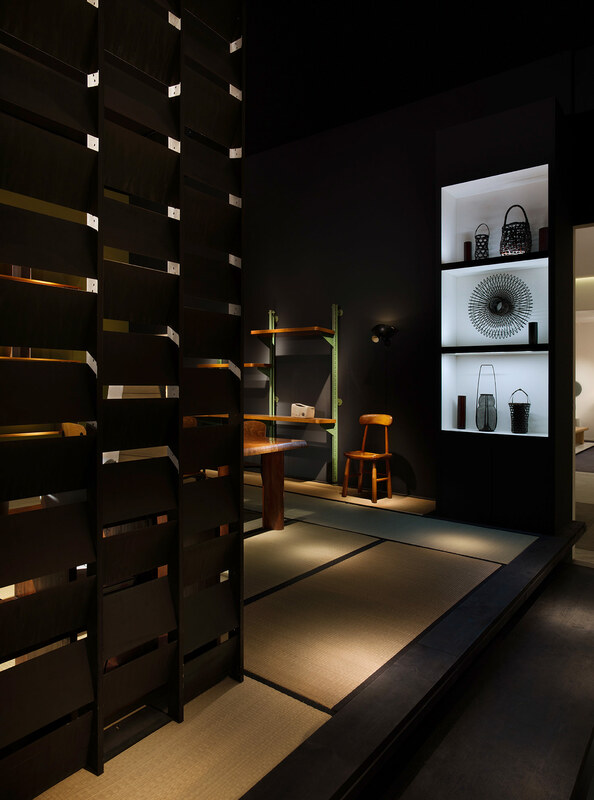 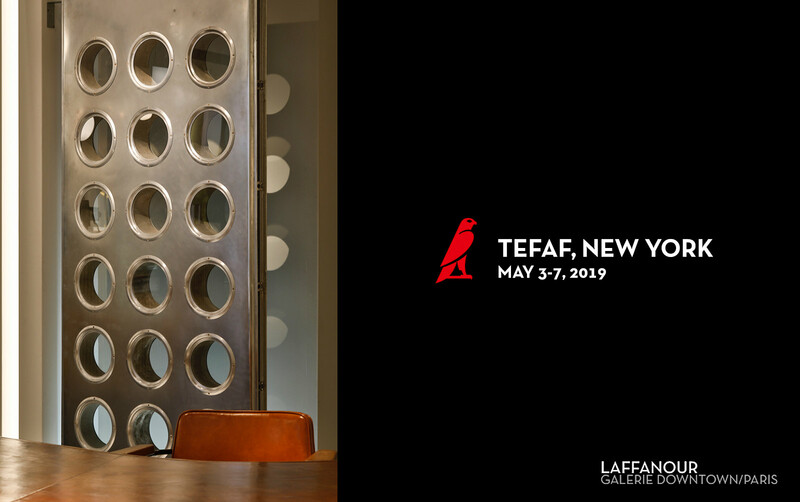 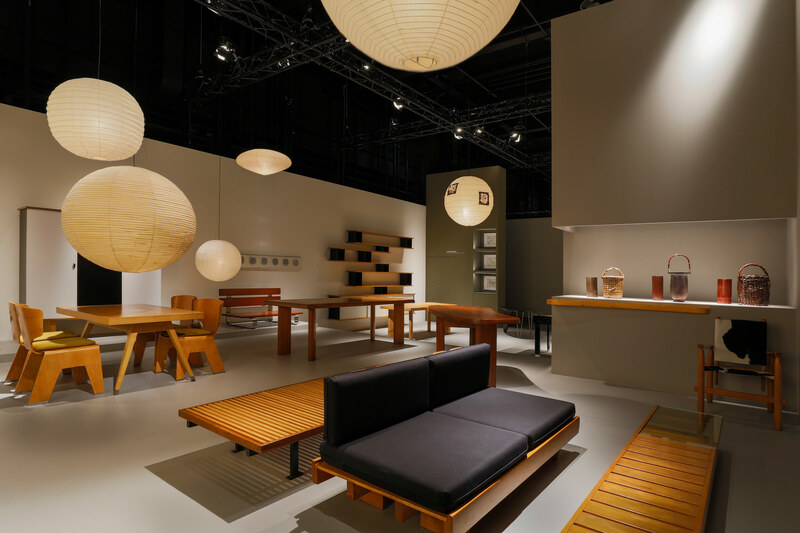 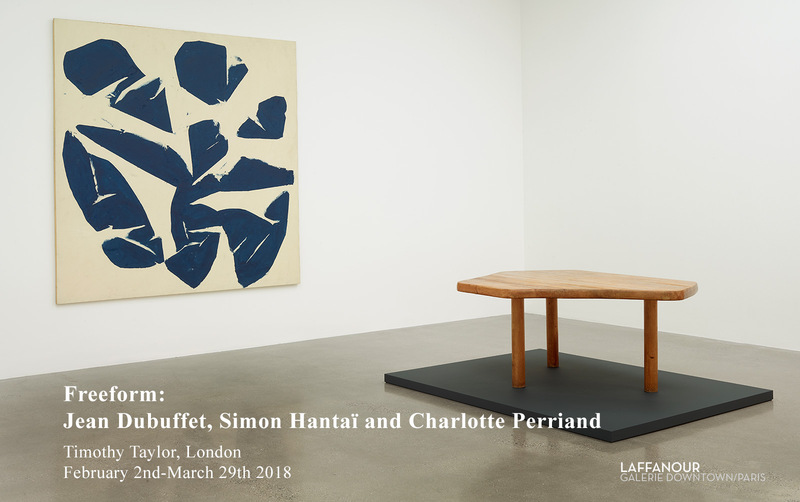 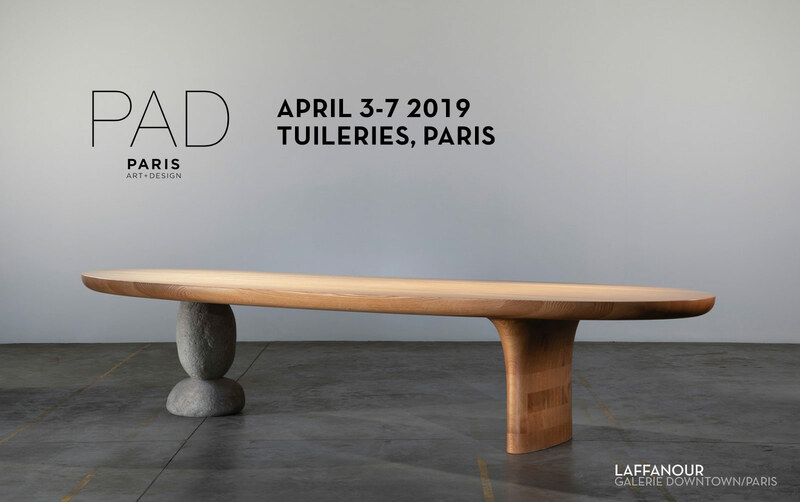 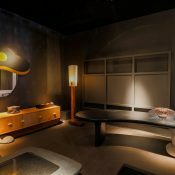 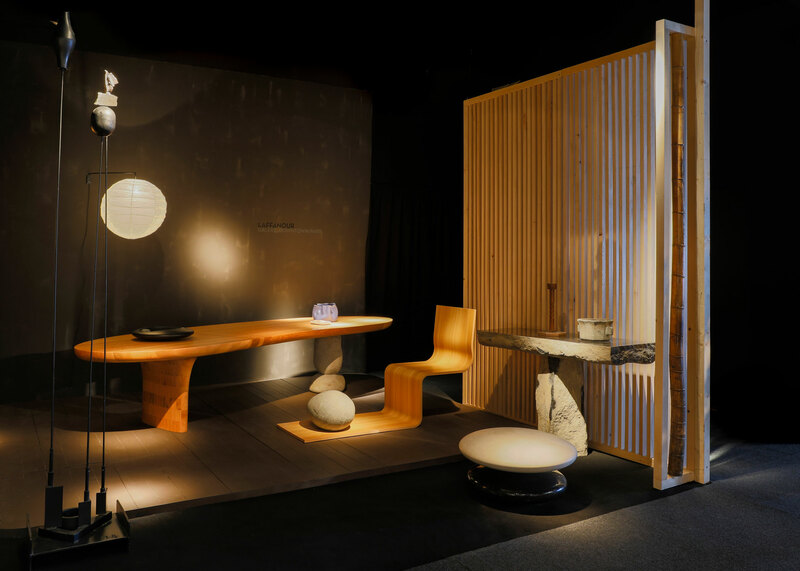 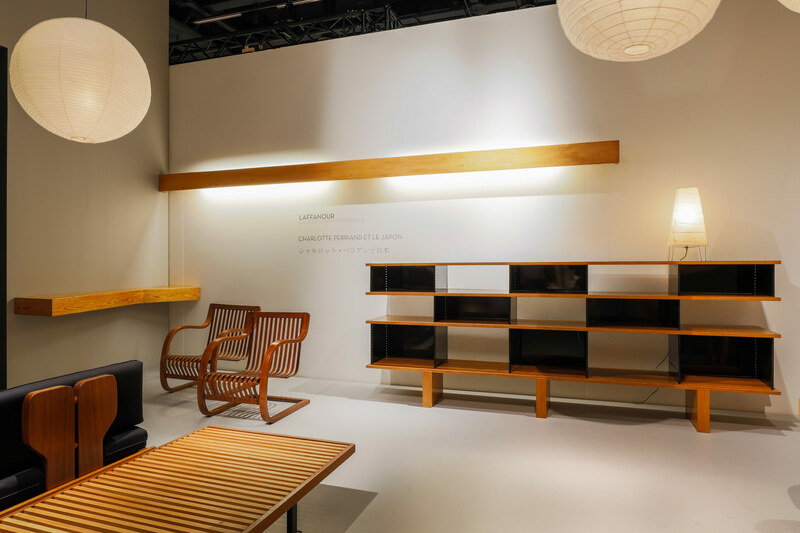 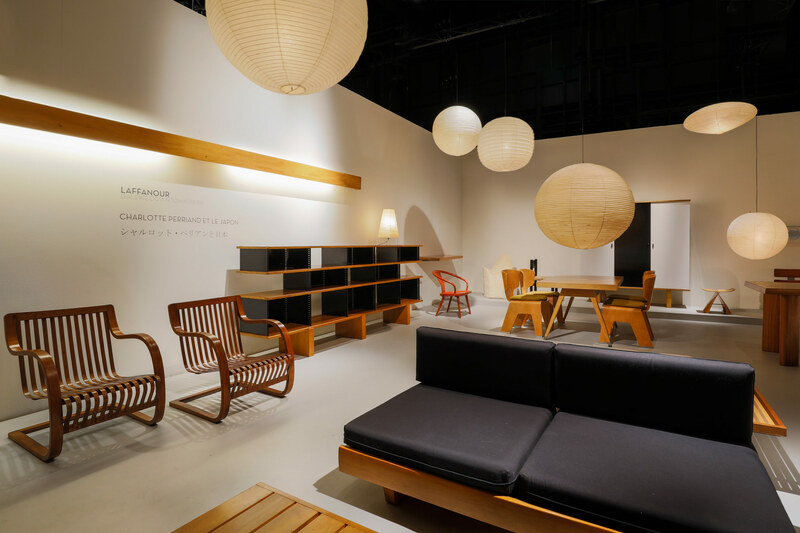 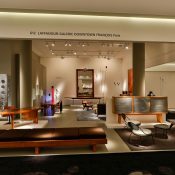 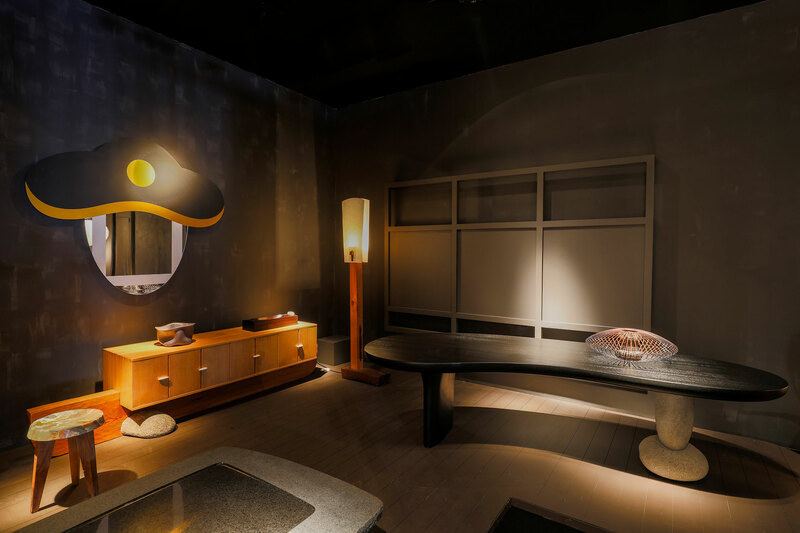 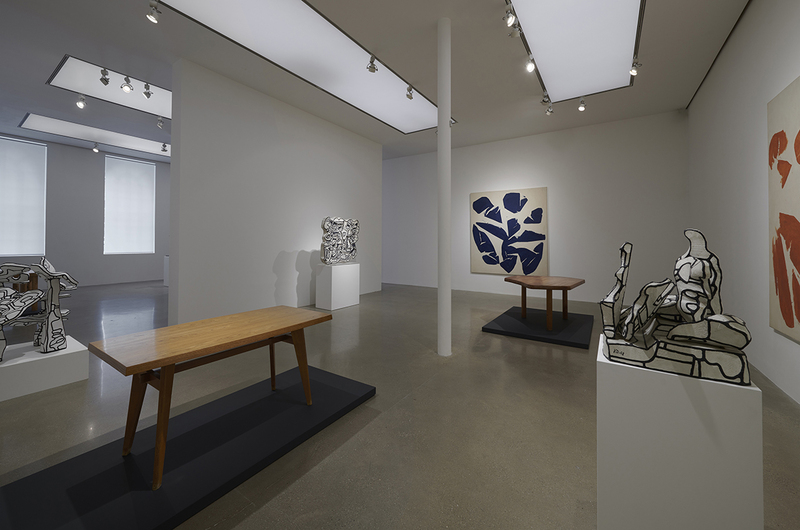 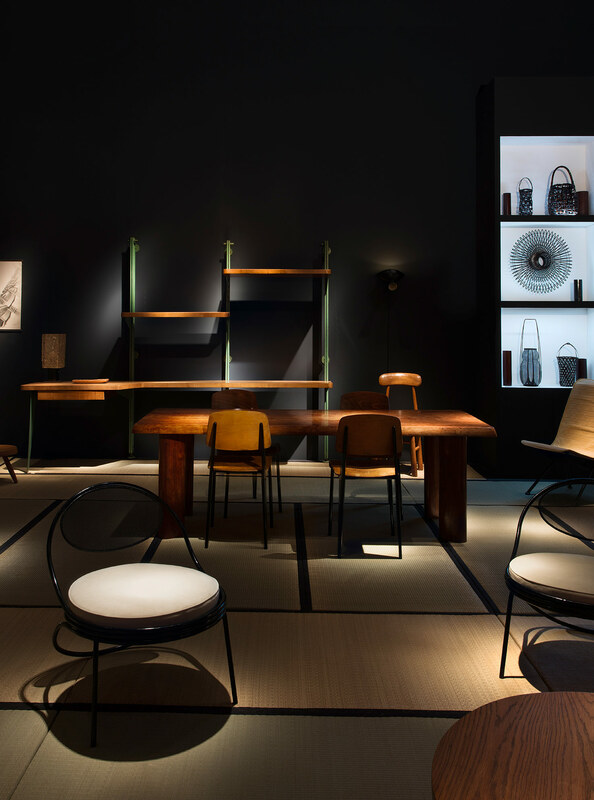 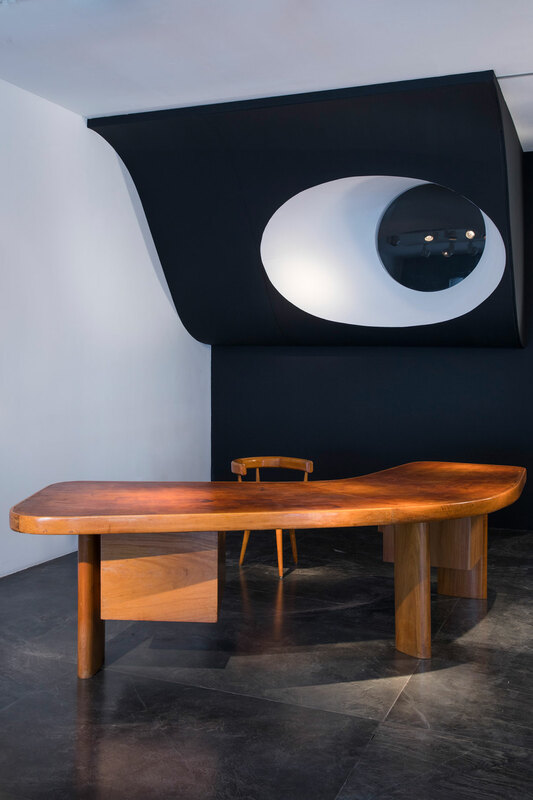 Among the exceptional masterpieces will be presented a rare bench with a steel structure, designed in 1966 for the private residence of the ambassador of Japan in France (circa 1966), a Kenzo Tange’s chair (1957), Akari the lighting fixtures (1960) desiged by Isamu Noguchi and Hanakago d’IIzuka Rokansi (1930). 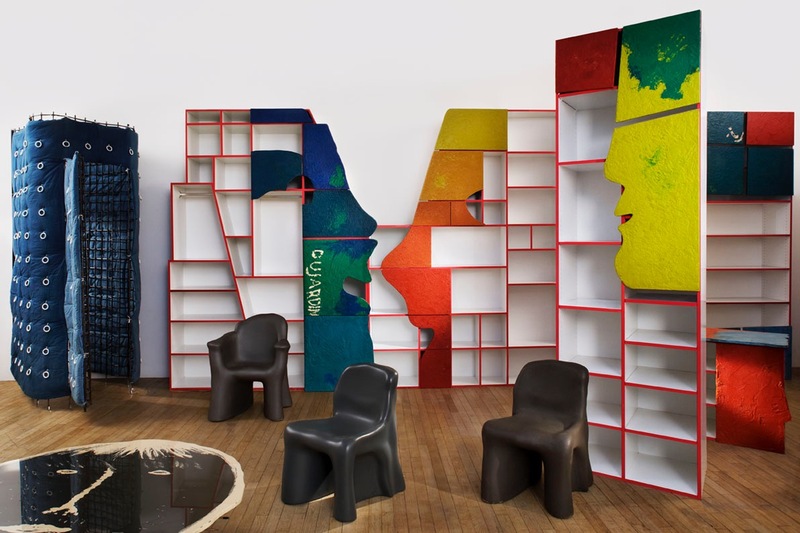 In 1994, the talented italian designer Gaetano Pesce is commissioned to create the architecture and the interior for Dujardin children store on the Belgian coastline Knokke-Le-Zout. 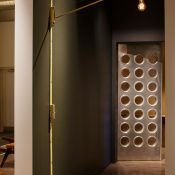 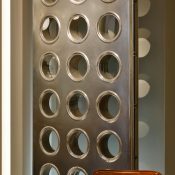 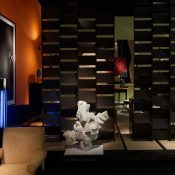 This opportunity allowed Pesce once again to combine utility with joyness, Art and Design, aesthetics with functionality. 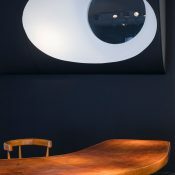 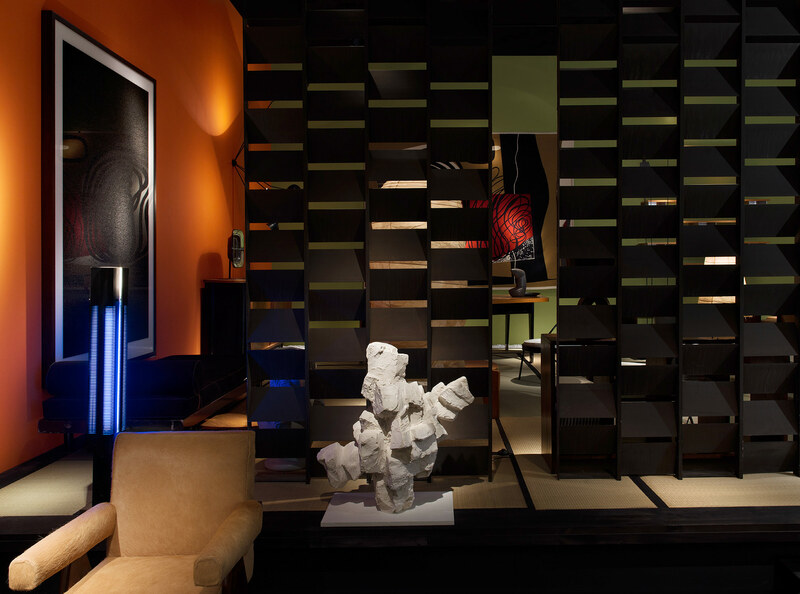 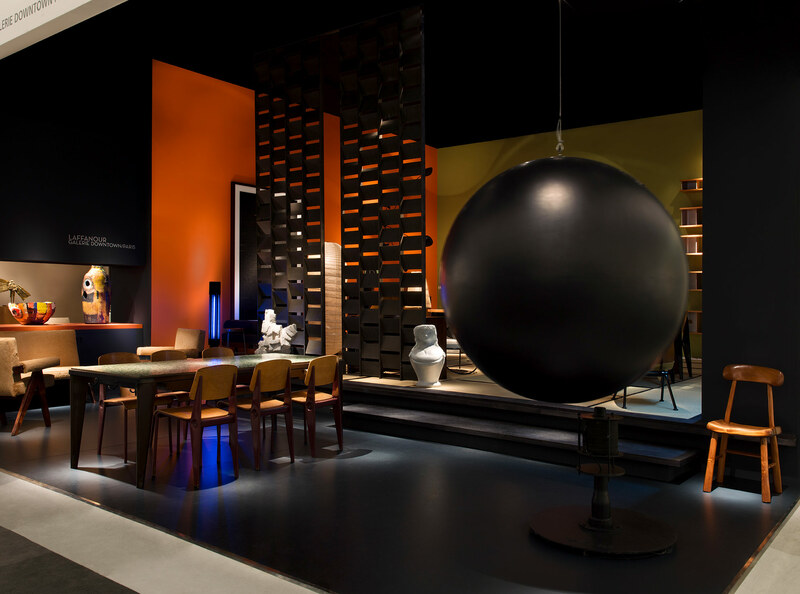 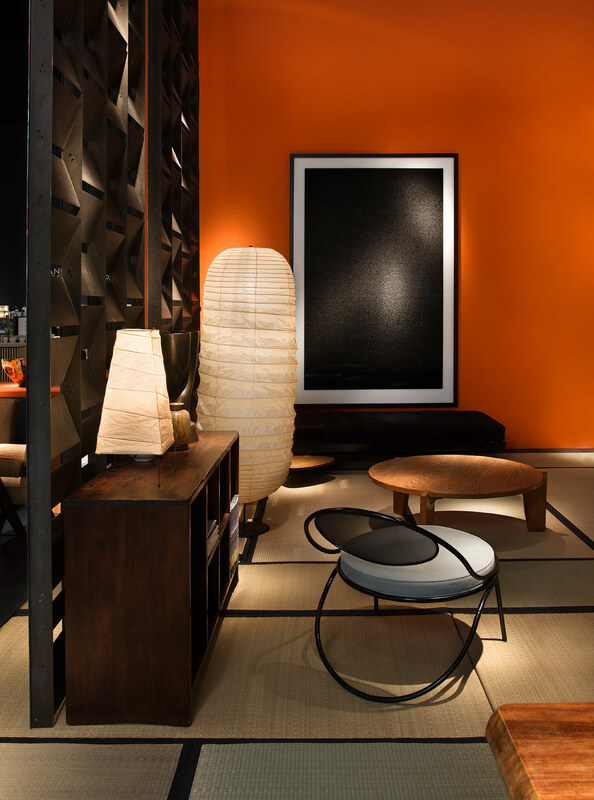 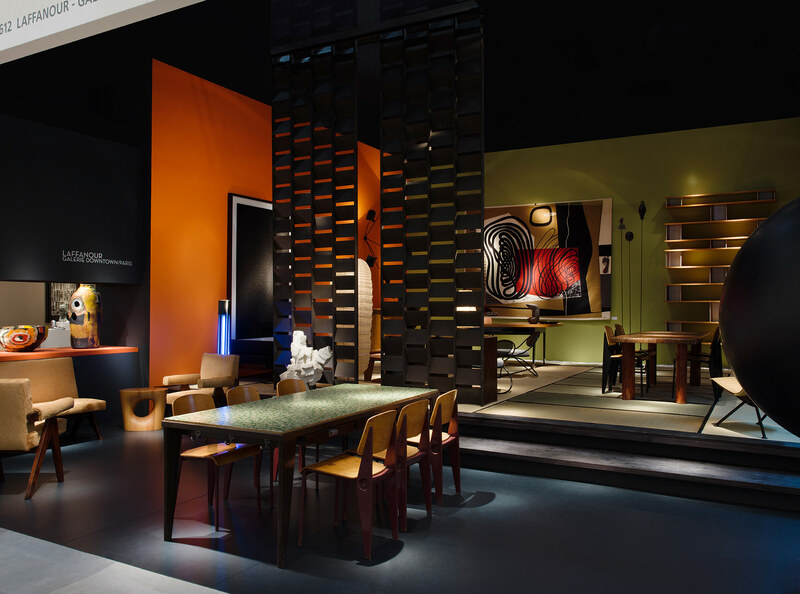 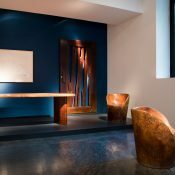 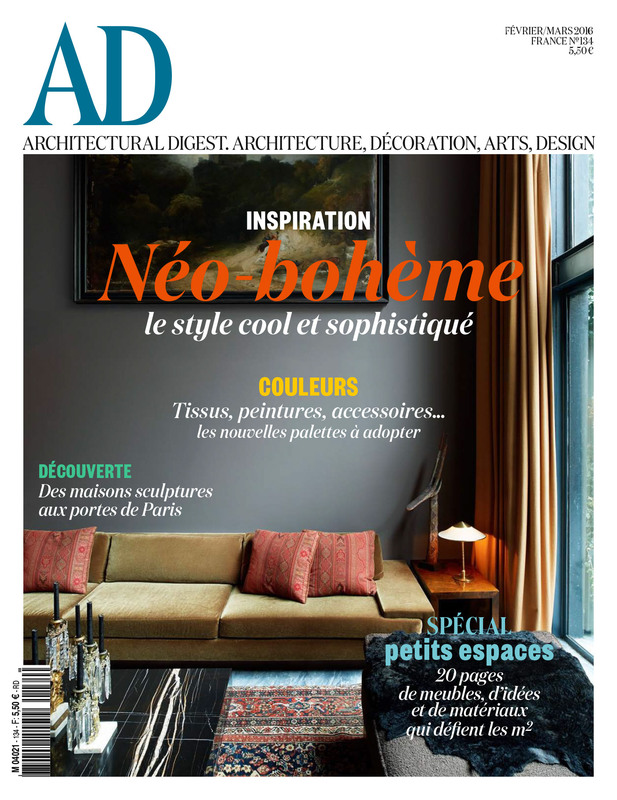 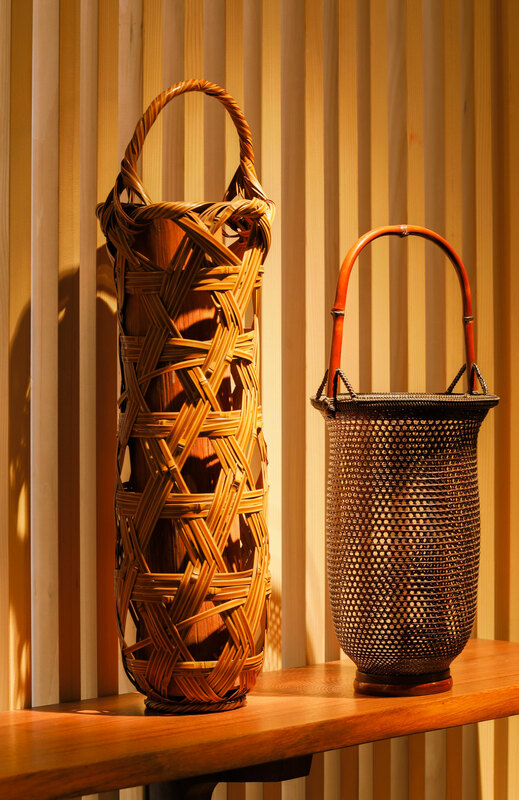 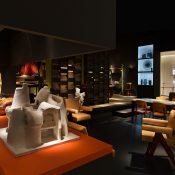 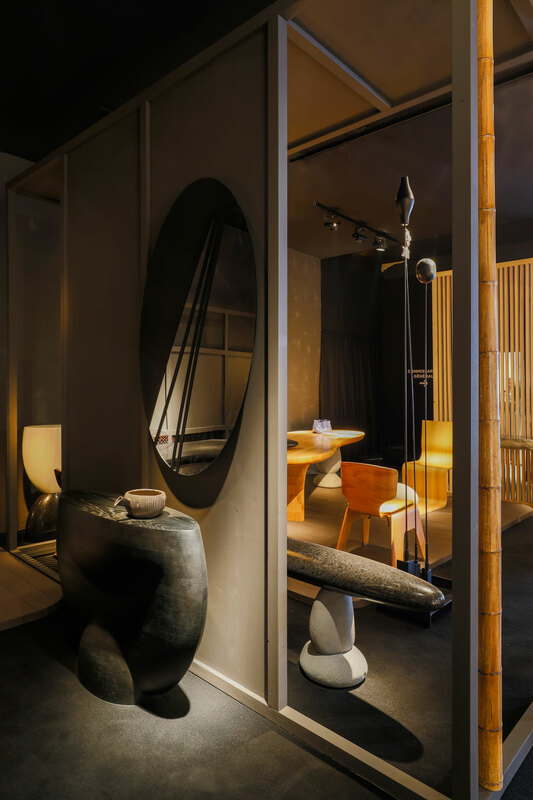 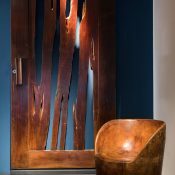 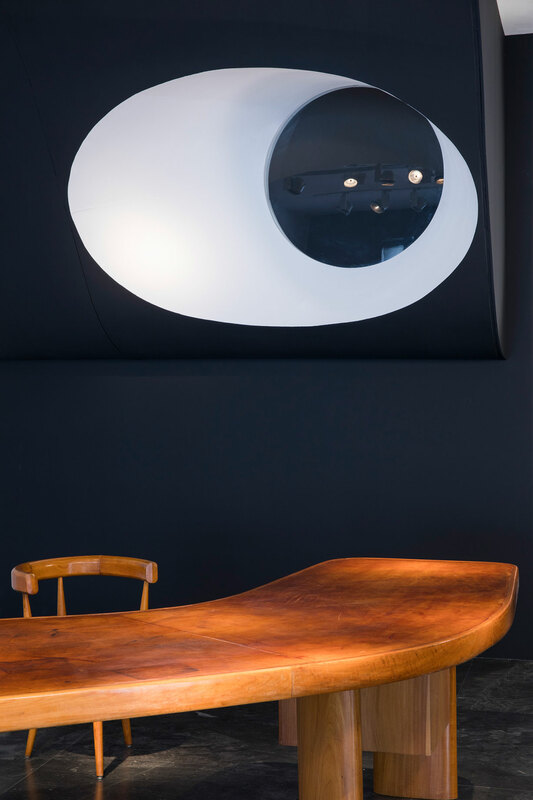 In the heart of Deauville of the North, the architect offers us the essence of his artistic research with a succession of colors, lines, shapes and materials perfectly representative of his work, his sense of humor, his style and innovative ideas. 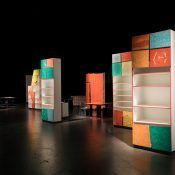 This playful, rich and colorful architecture retains its usefulness, but is armed with a new function. 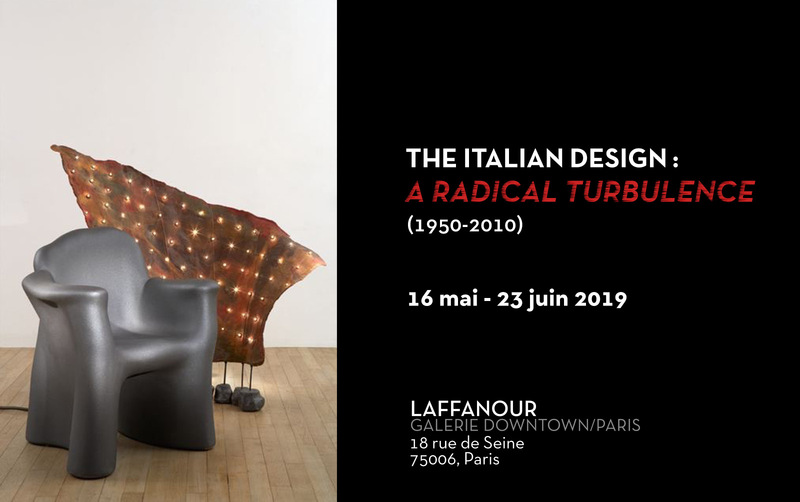 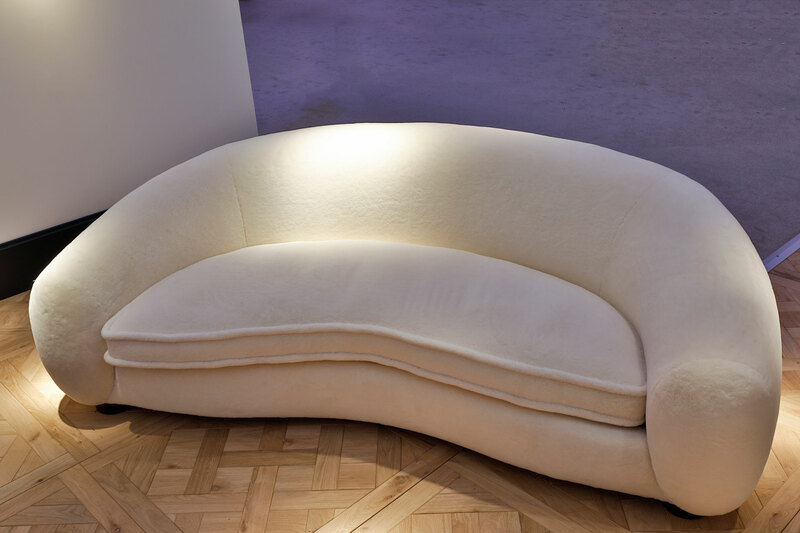 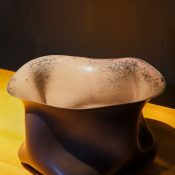 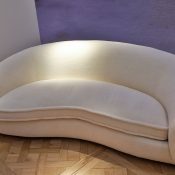 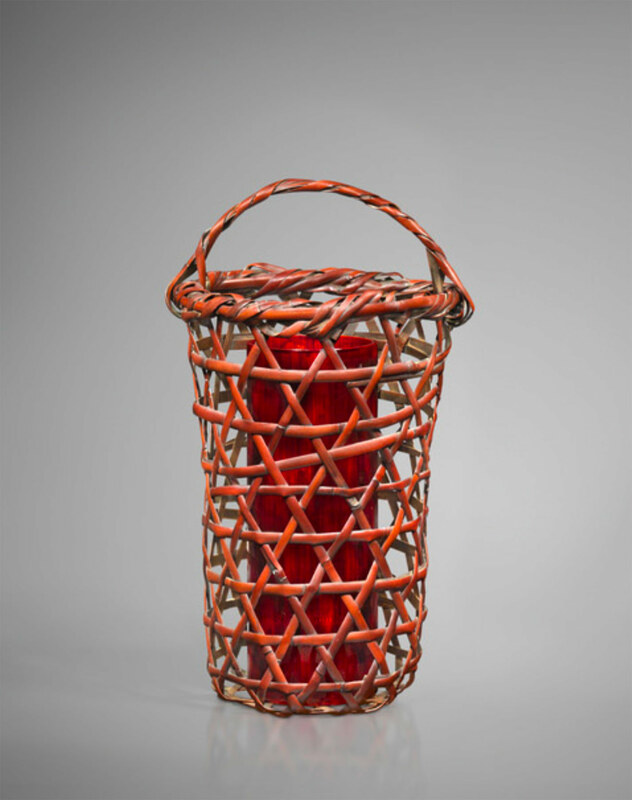 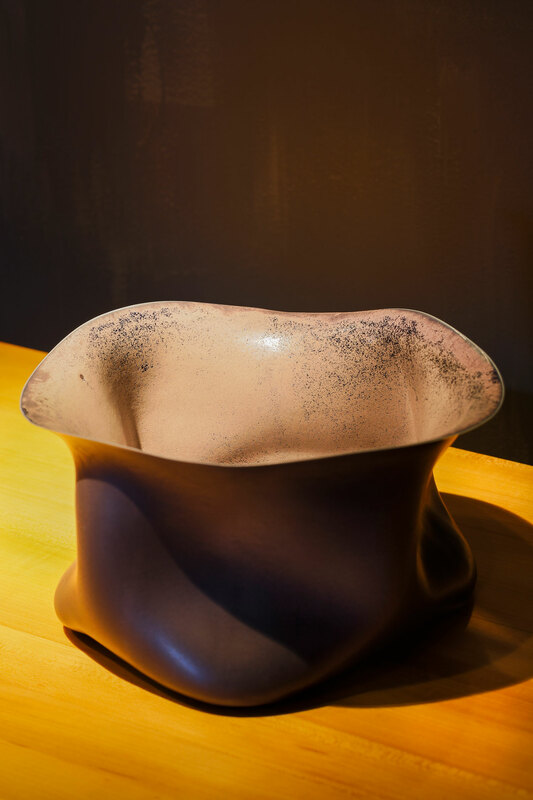 It is no longer just about designing industrialized forms, for Gaetano Pesce design becomes the real support for an artistic, political or social discourse. 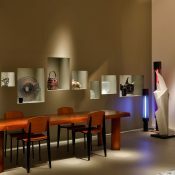 Always eager to shake up the codes and common ideas, Pesce continues to surprise us almost 24 years after the creation of Dujardin store. 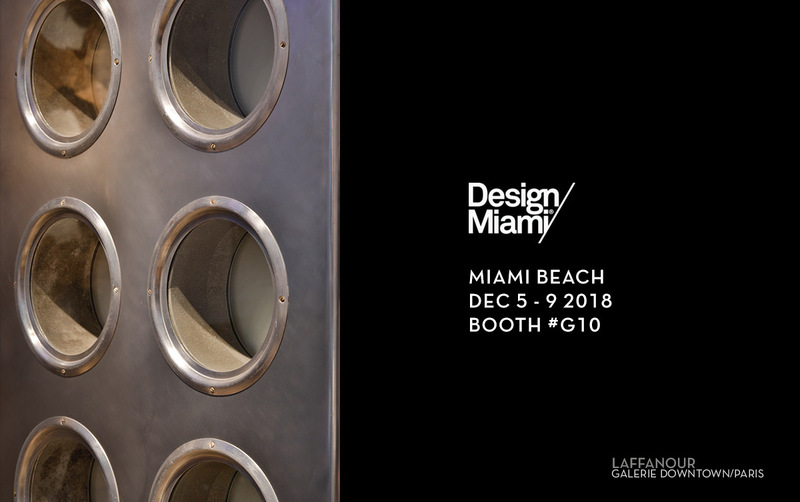 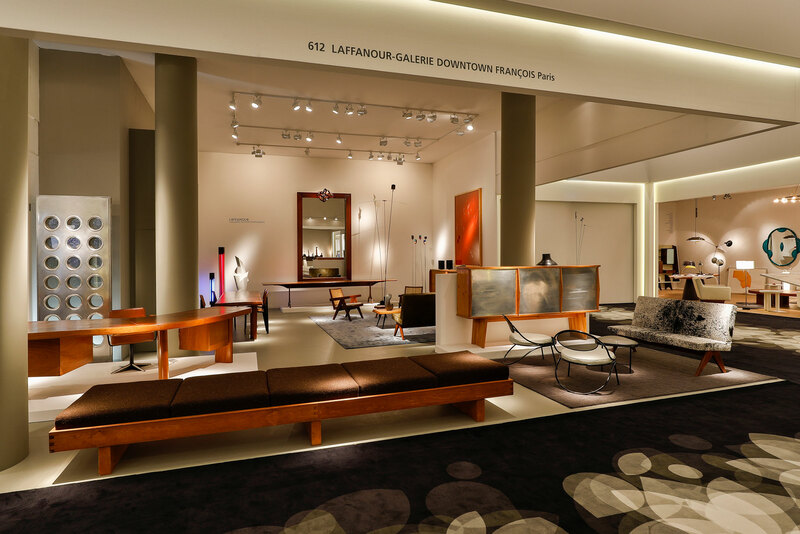 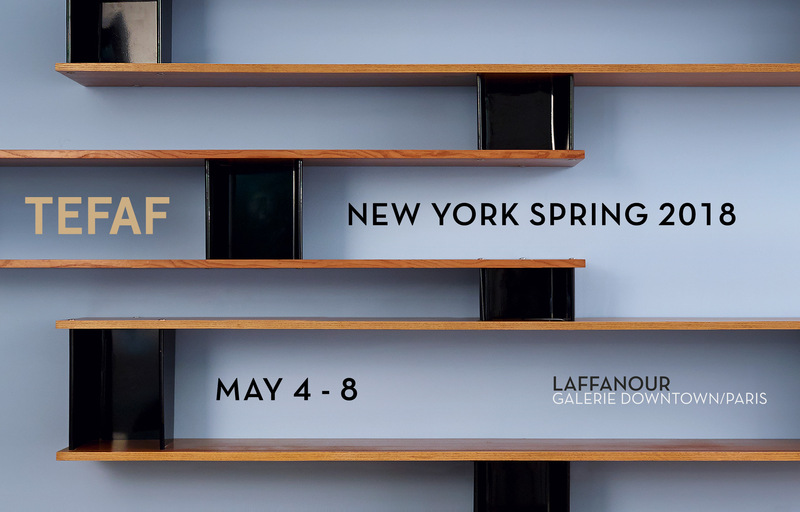 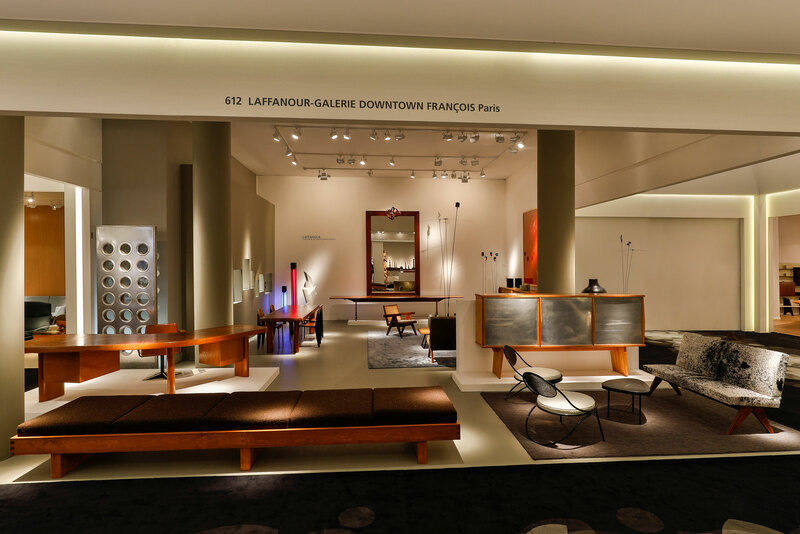 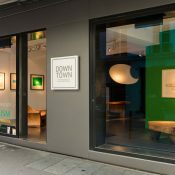 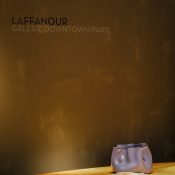 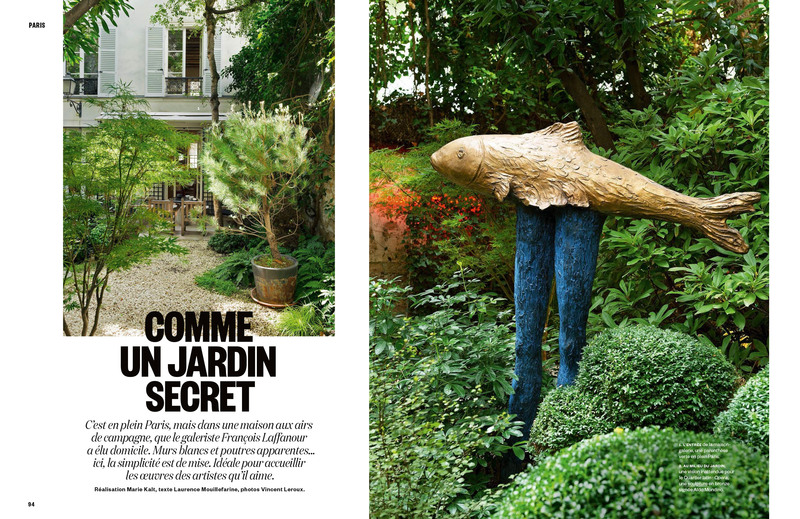 Galerie Downtown-François Laffanour is delighted to make you discover for the first time his interior architecture for Dujardin Store during Design/Miami, Basel. 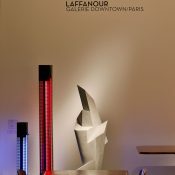 The dinner was held in the presence of Kris Van Assche, Laure Hériard Dubreuil and François Laffanour. 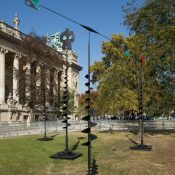 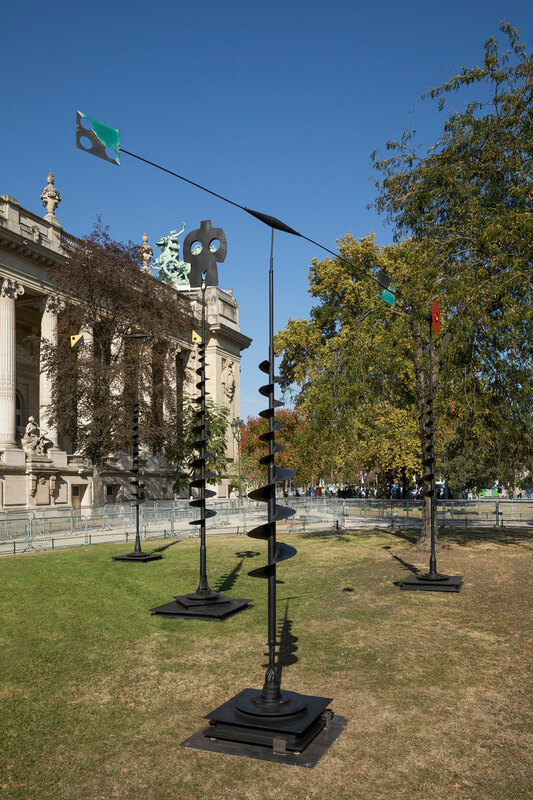 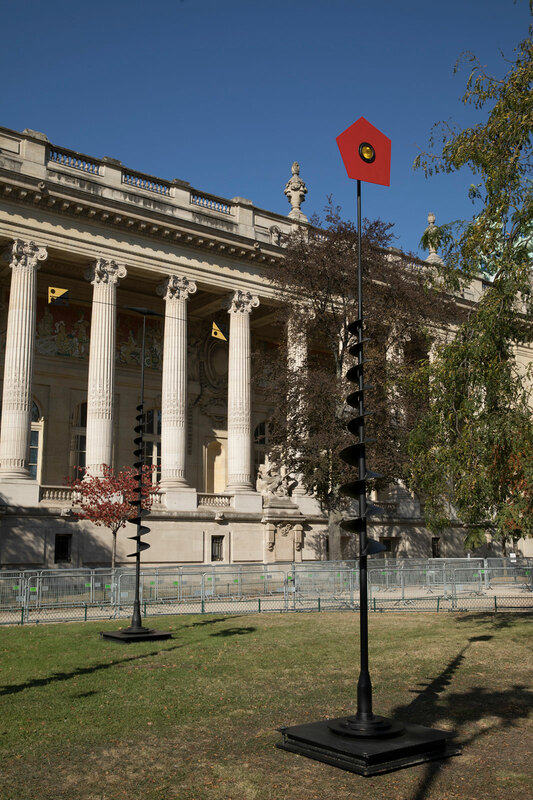 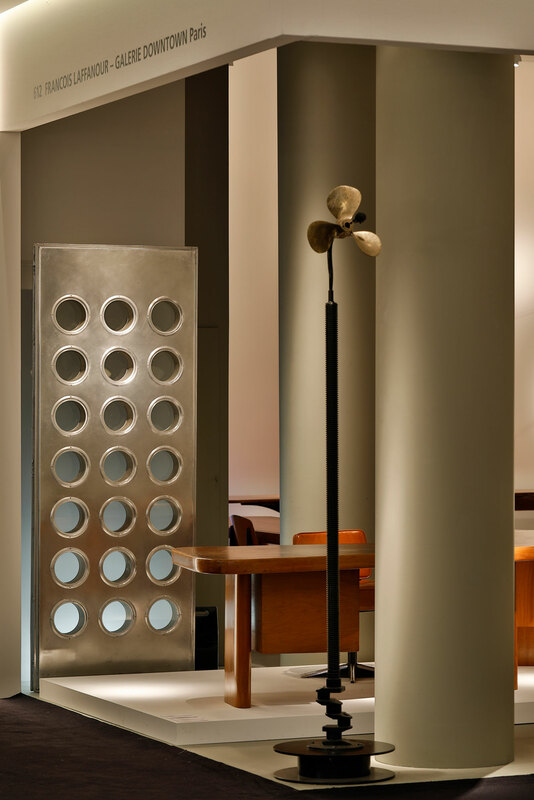 To mark the event, the Webster had welcomed an installation of the original Akari Light sculptures by American-Japanese artist Isamu Noguchi. 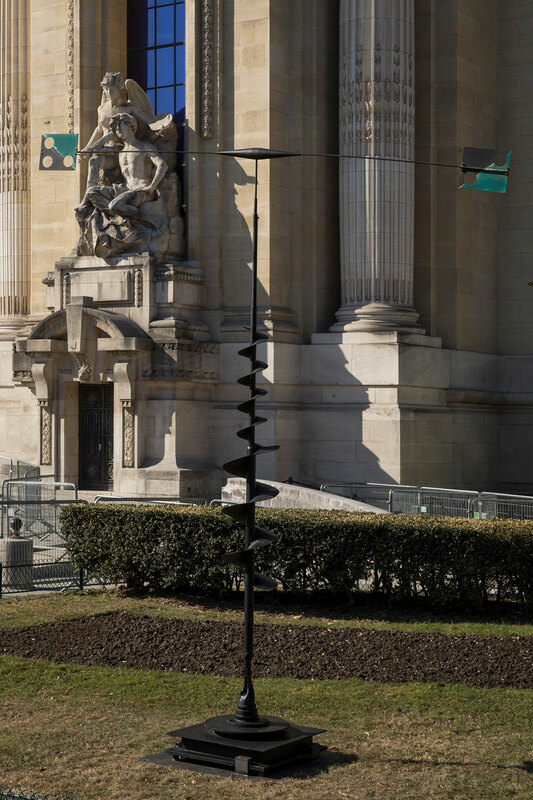 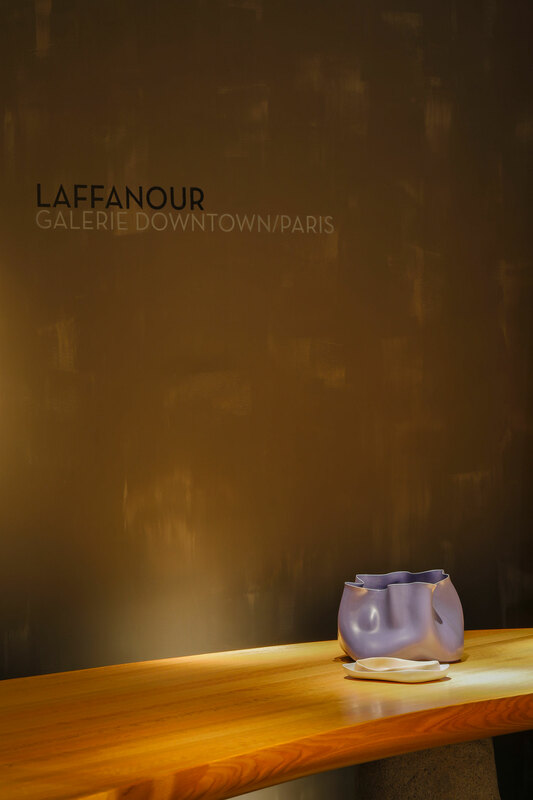 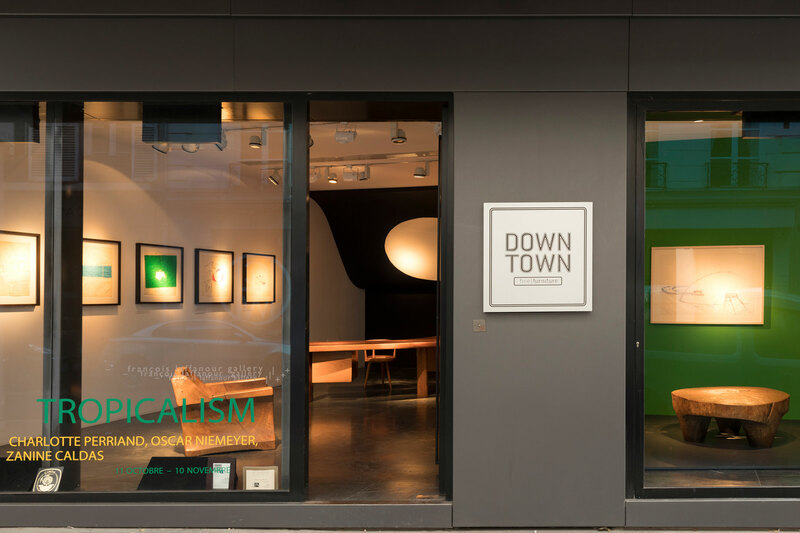 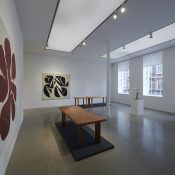 Belonging to Galerie Downtown, six of the lamps have been customized using photographs of flowers taken by Kris Van Assche, applied on the lamps in the style of an urban street collage. 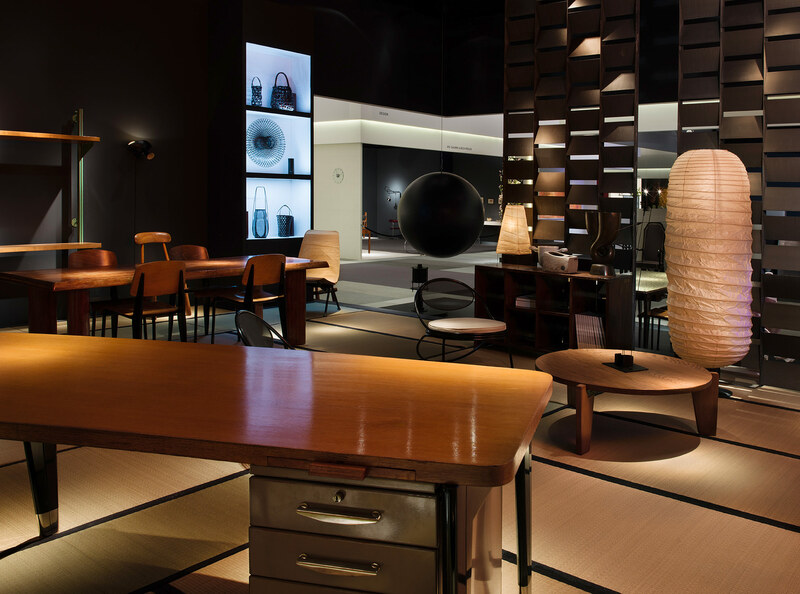 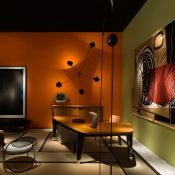 The lamps are now displayed in the Dior Homme boutique in Miami’s Design District for the duration of Art Basel Miami Beach. 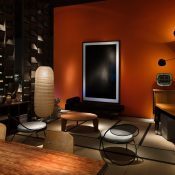 The guests of the dinner included Asap Rocky, Woodkid, Ricky Martin, Jwan Yosef, Cordell Broadus, Mia Moretti, Olivier Dwek, Hubert Bonnet, Rodman Primack, Adam Lindemann, Alexandra Roos, Stefano Tonchi and Amy Astley. 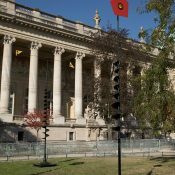 From September 11th to September 17th 2017. 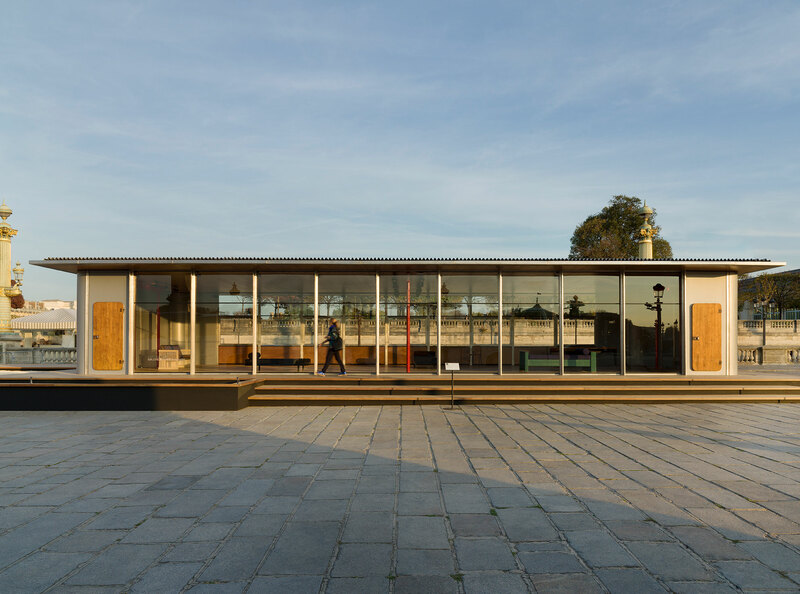 During the year 2016, the architectural work of Le Corbusier was recognized as World Heritage of UNESCO. 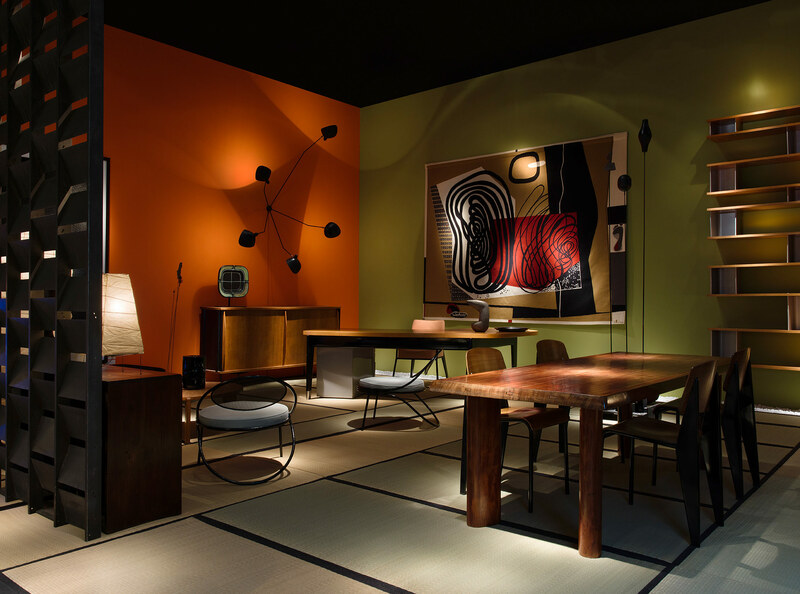 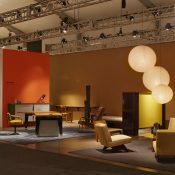 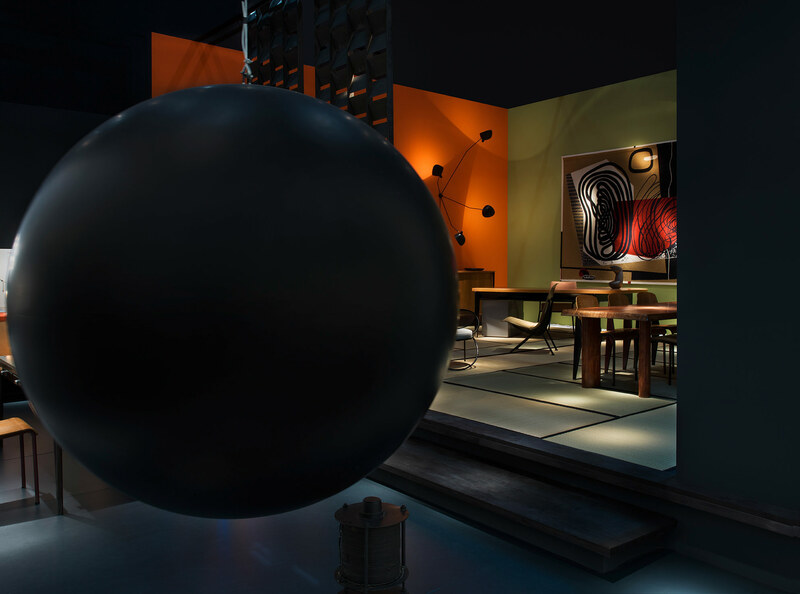 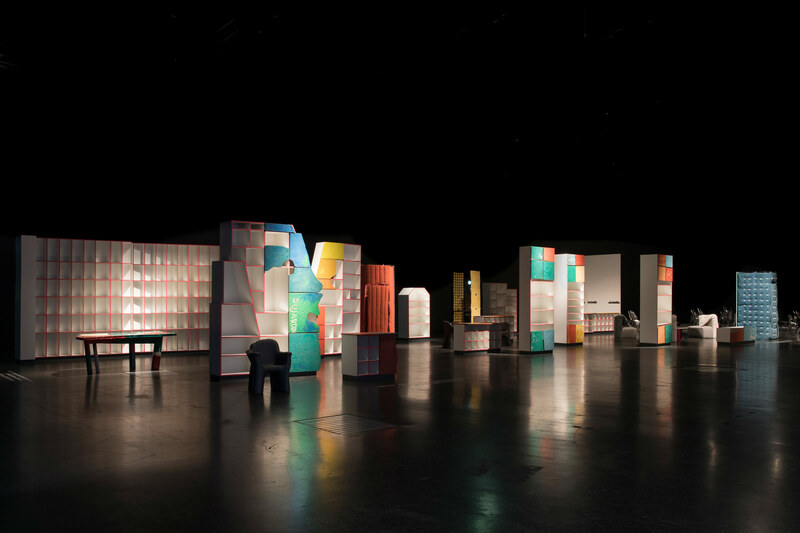 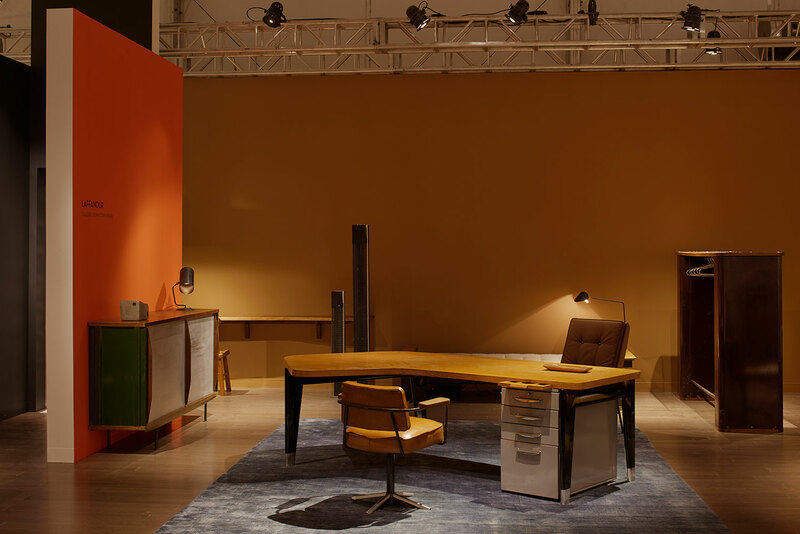 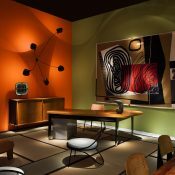 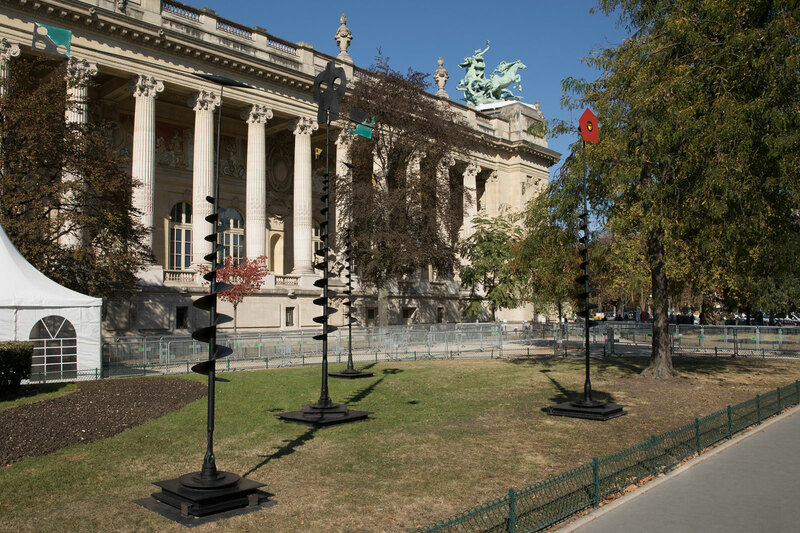 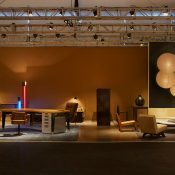 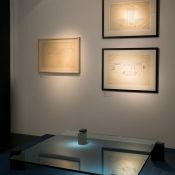 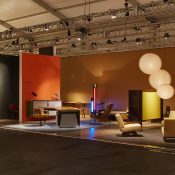 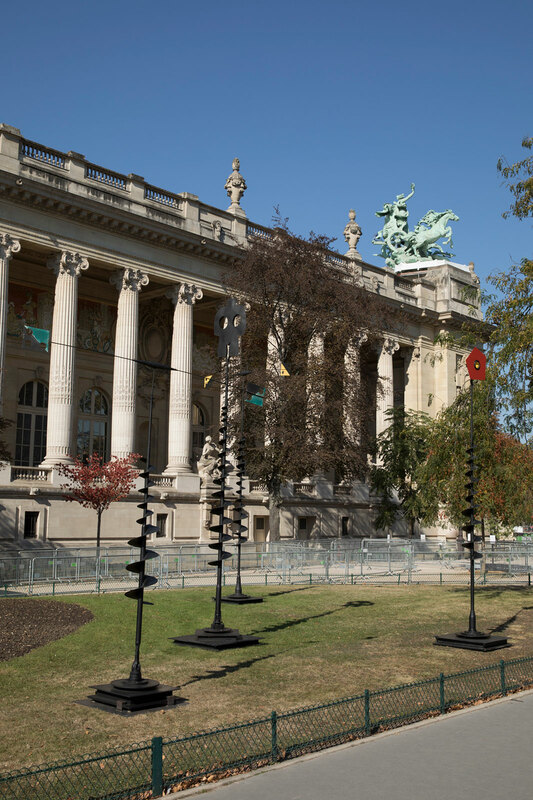 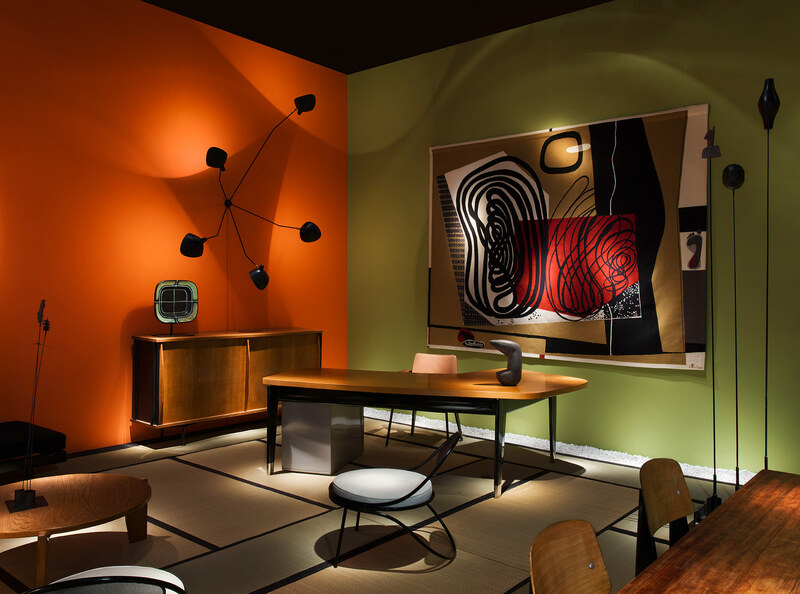 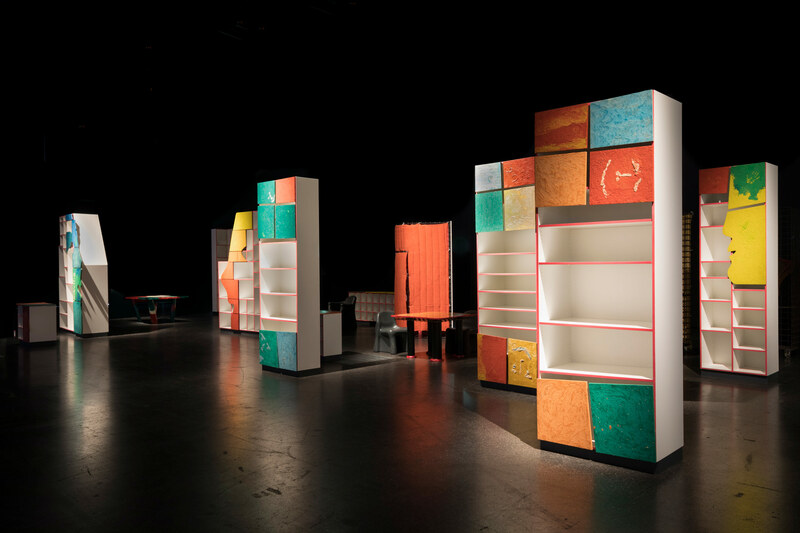 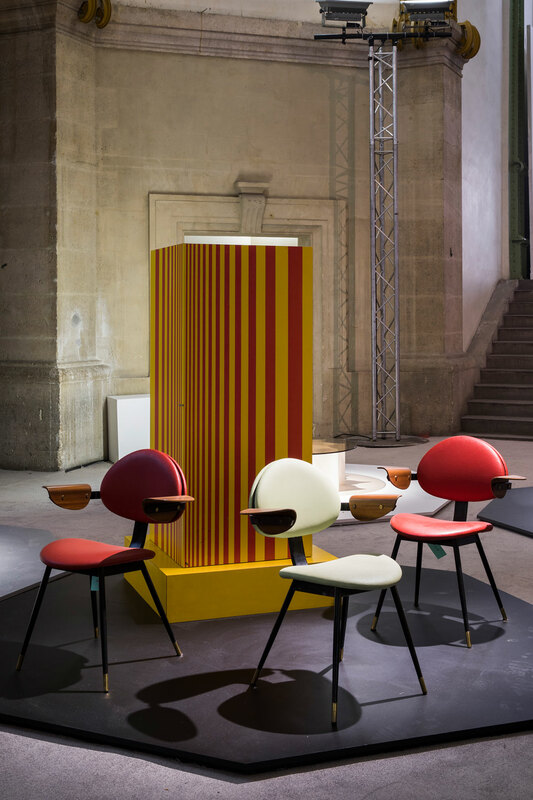 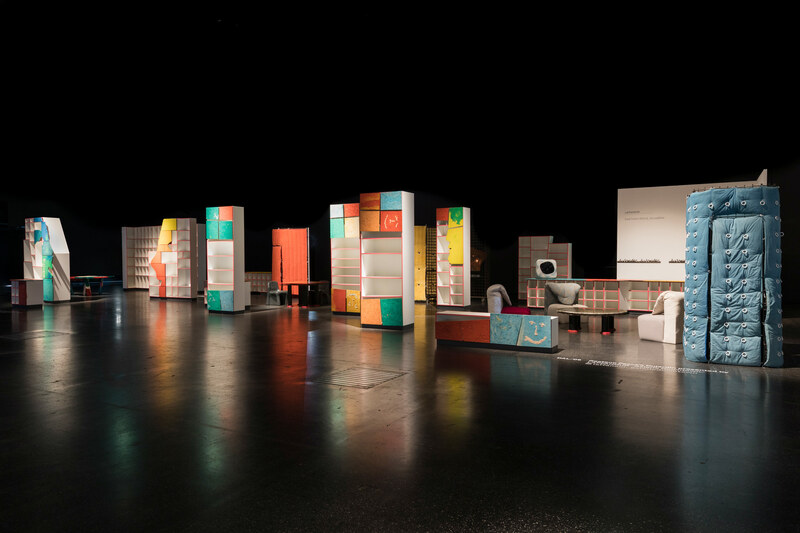 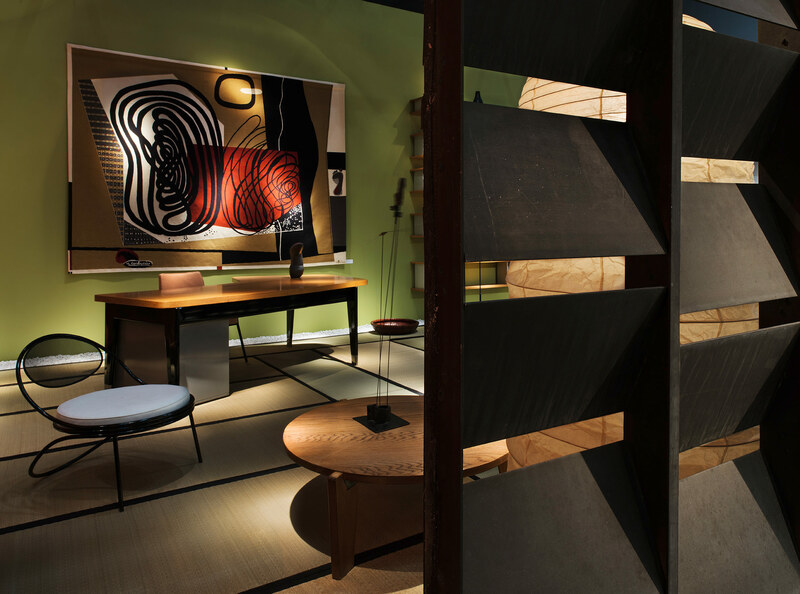 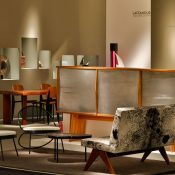 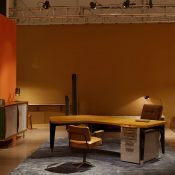 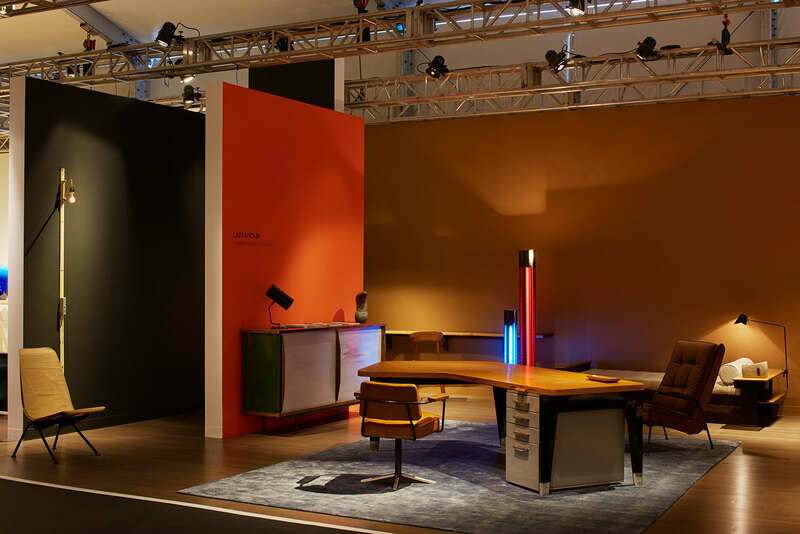 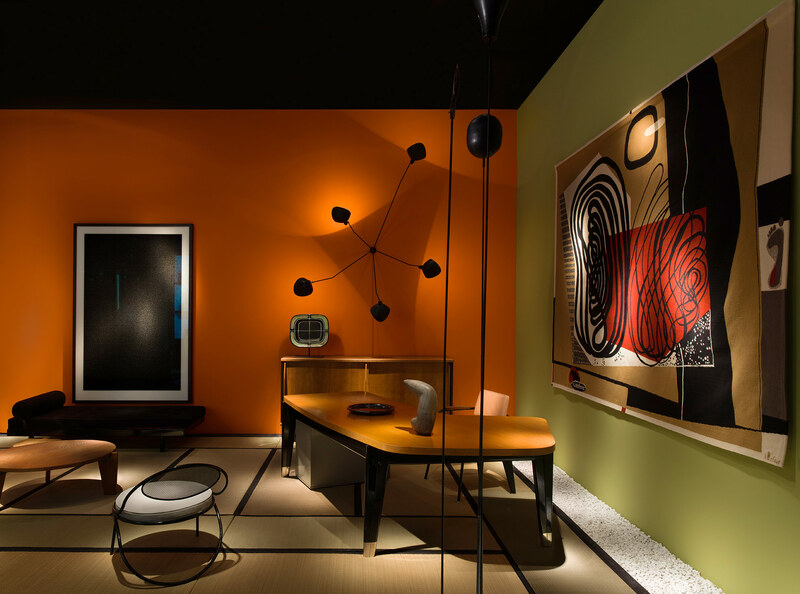 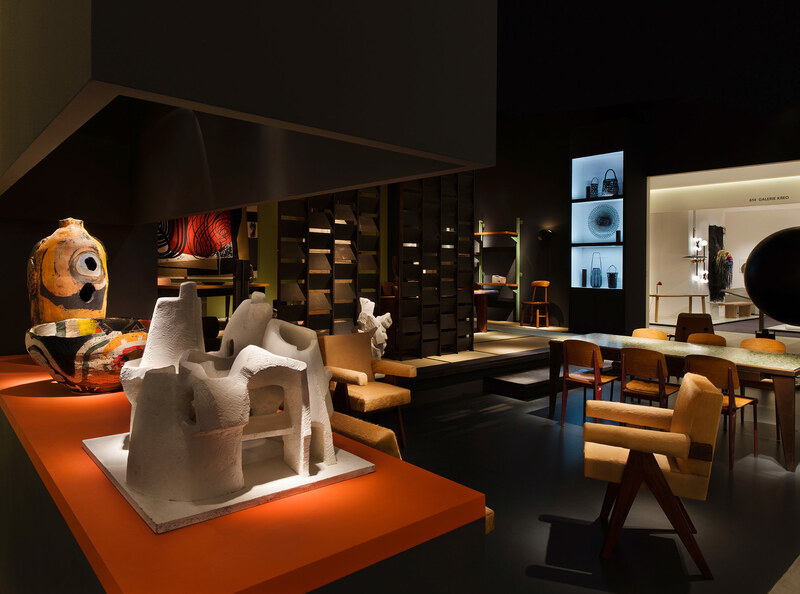 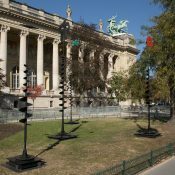 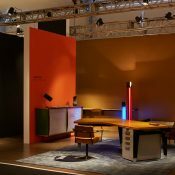 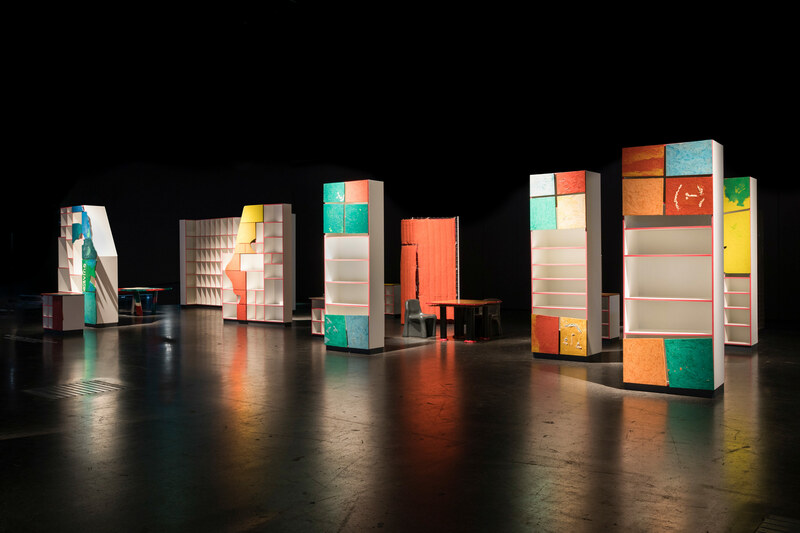 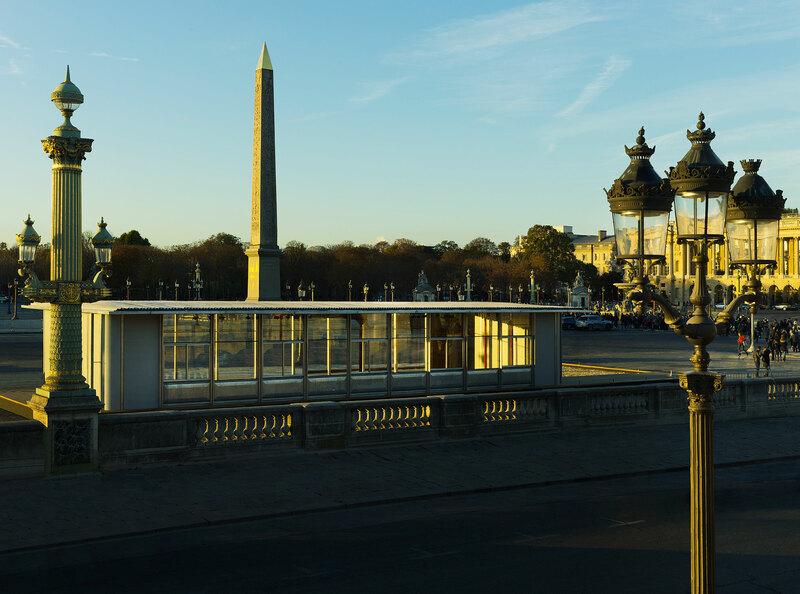 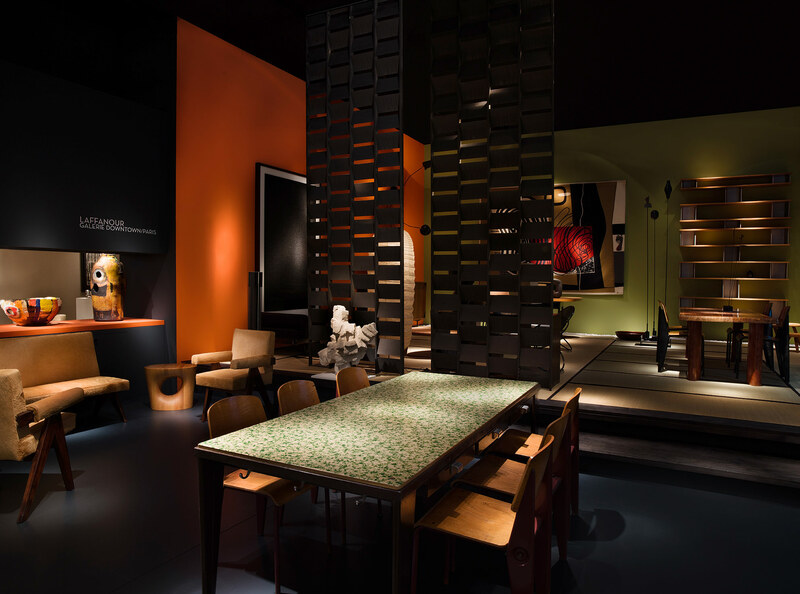 For the Biennale des Antiquaires 2017 at the Grand Palais, François La anour, presents a speci c scenography in tribute to Le Corbusier. 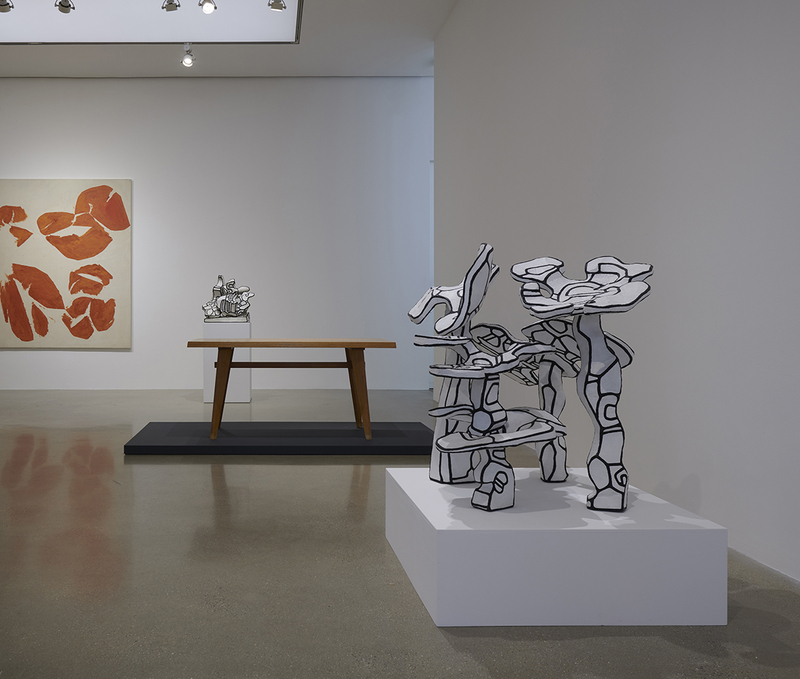 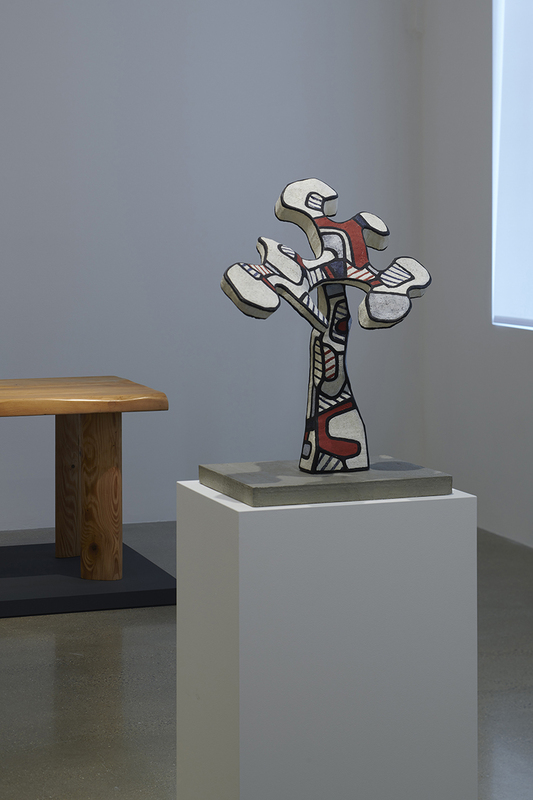 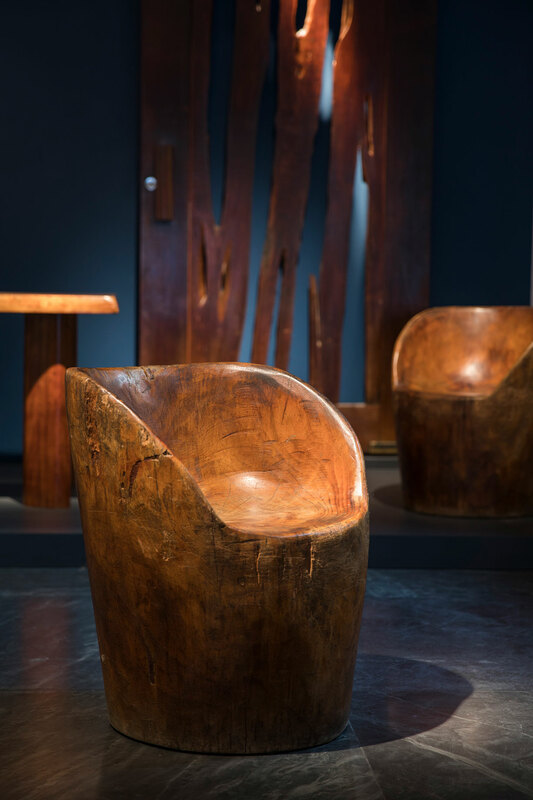 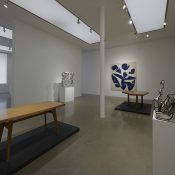 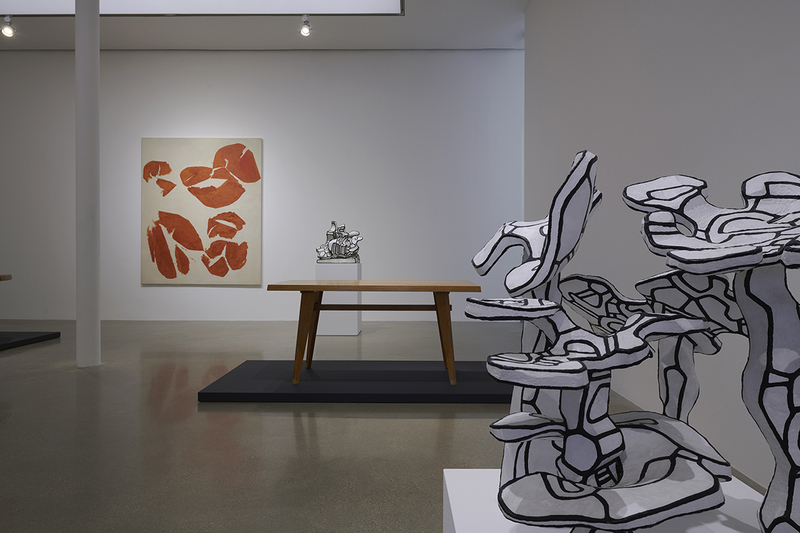 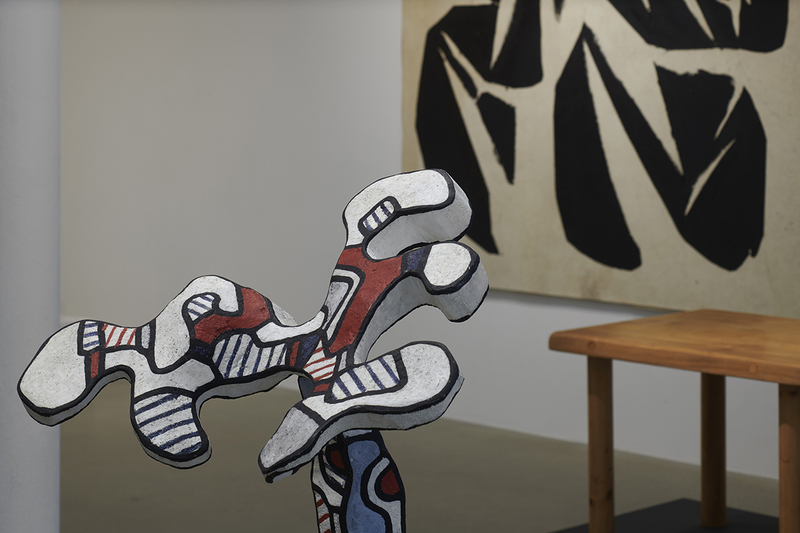 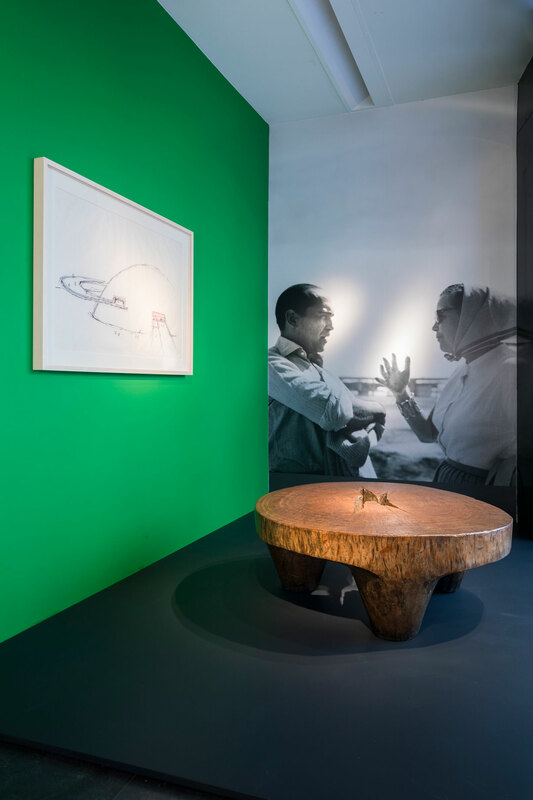 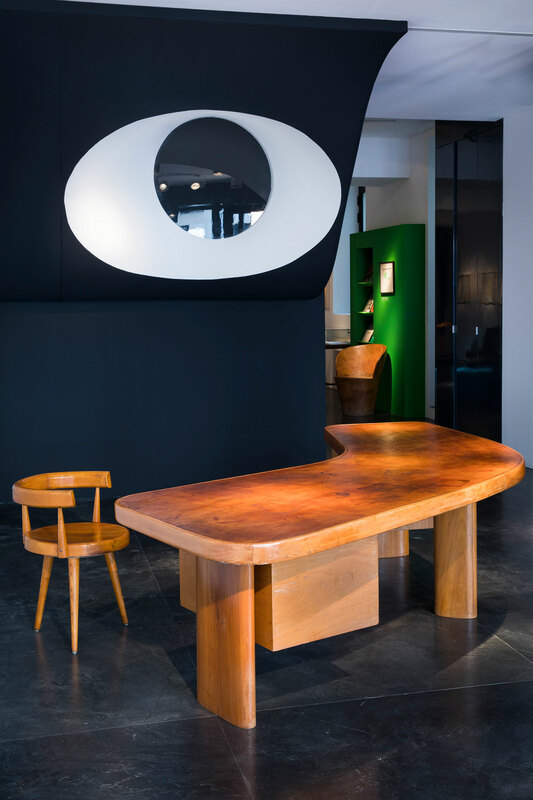 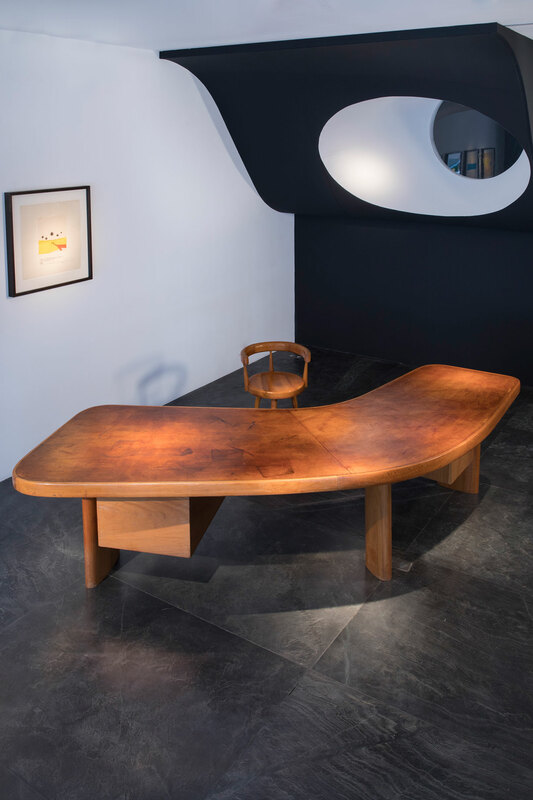 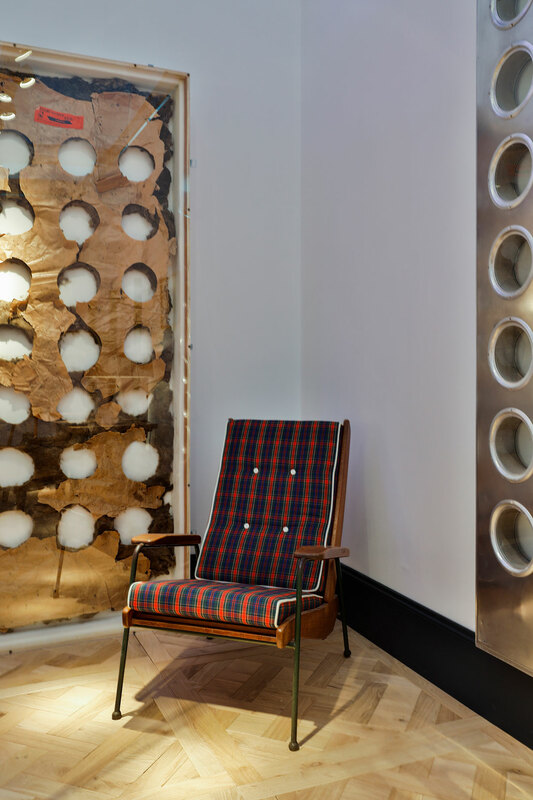 It will feature an exceptional sculpture by Le Corbusier surrounded by important pieces by Charlotte Perriand, Jean Prouvé and Pierre Jeanneret. 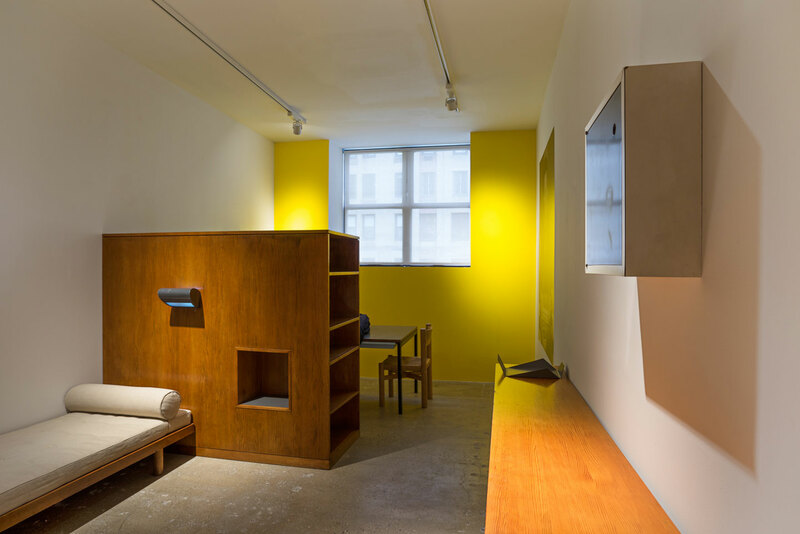 Charles-Edouard Jeanneret known as Le Corbusier (1887-1965) is identi ed above all as an architect, through all his international work that has recently been recognized as UNESCO World Heritage. 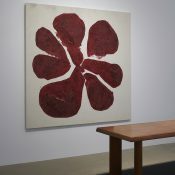 He was also a great painter who was the leader of the Purist movement. 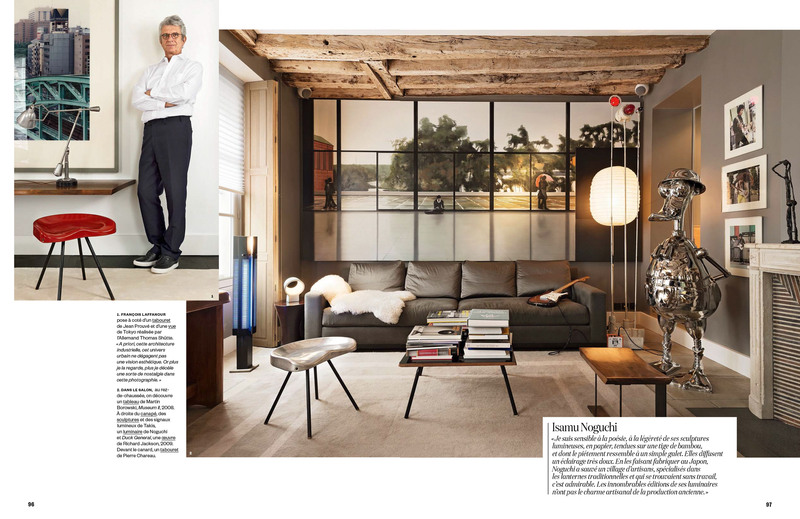 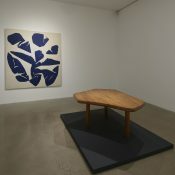 From his furniture, there are very few pieces edited. 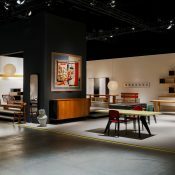 Most of them are editions made from the 1920’s to 1950’s, which are added furniture designed for special orders, often in series. 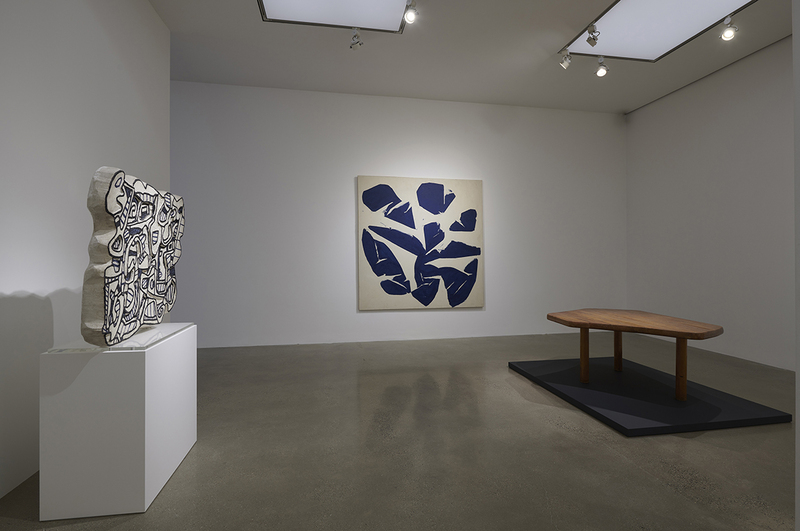 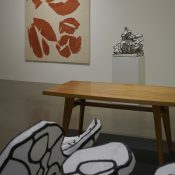 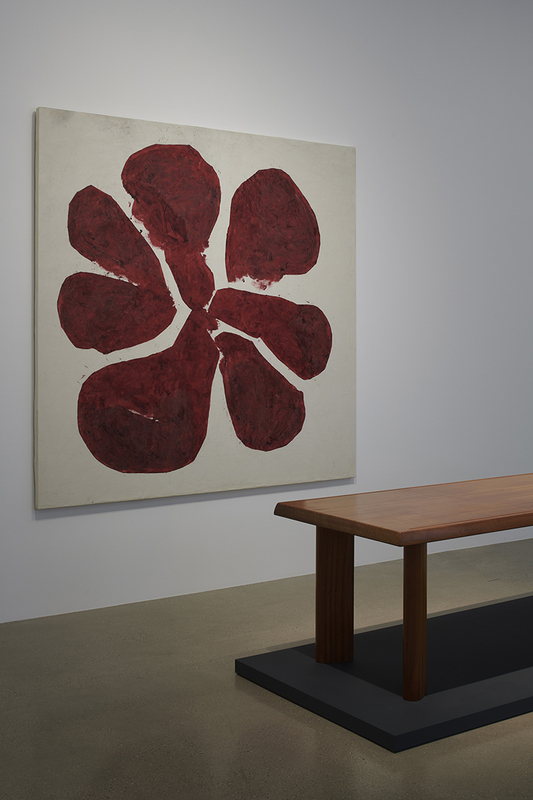 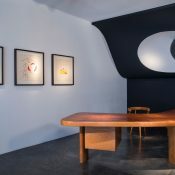 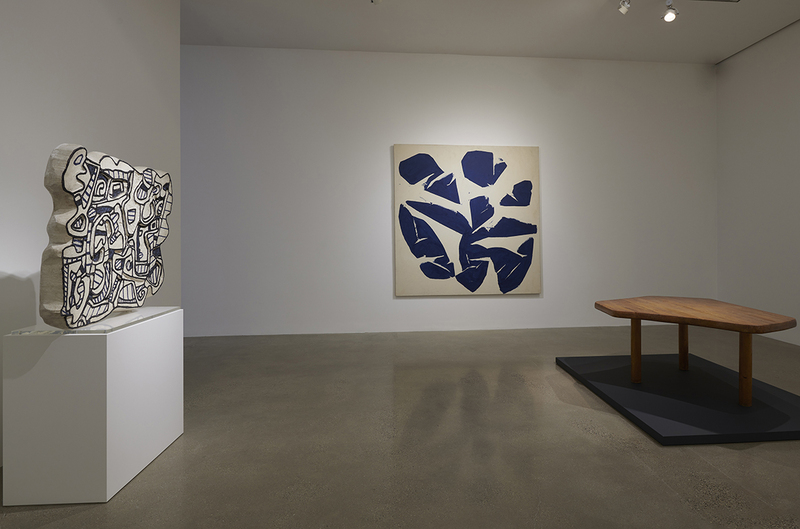 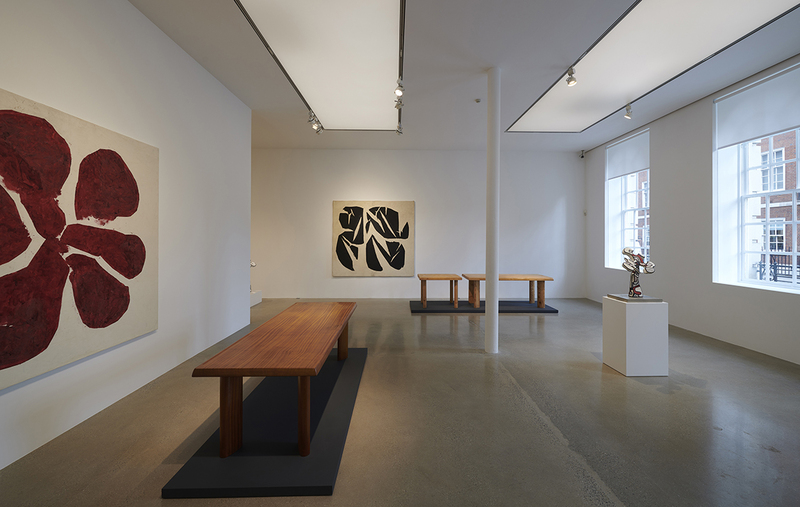 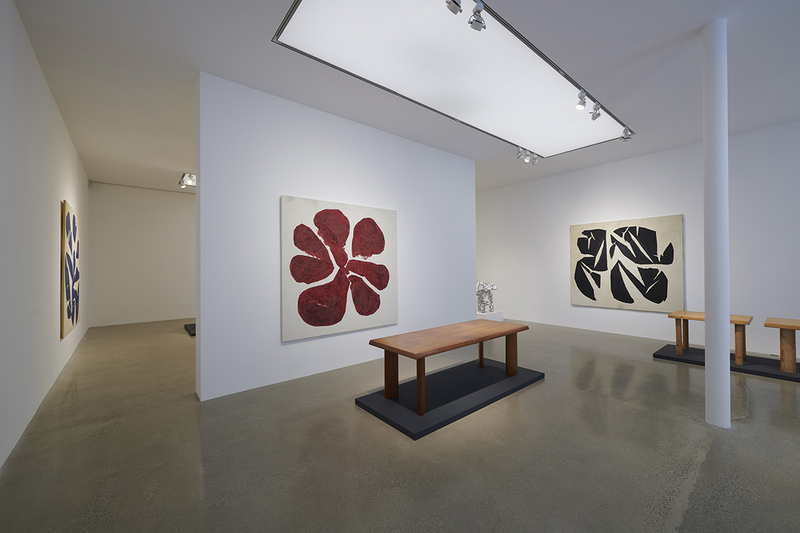 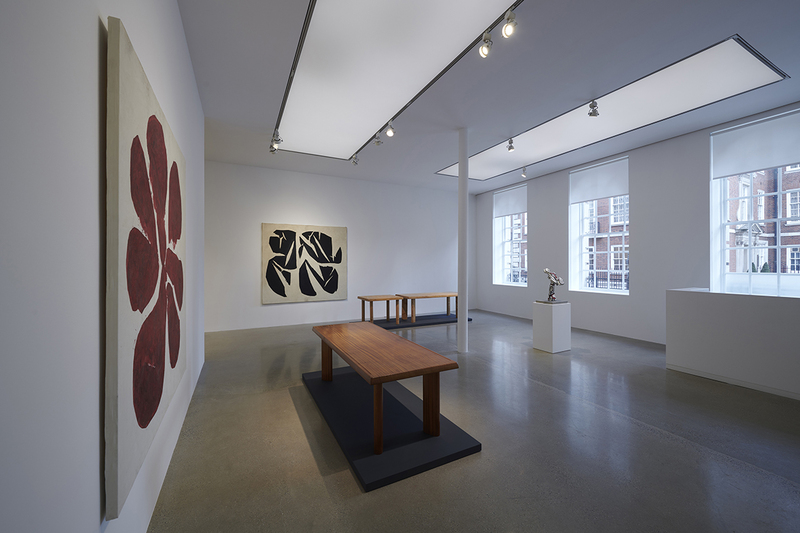 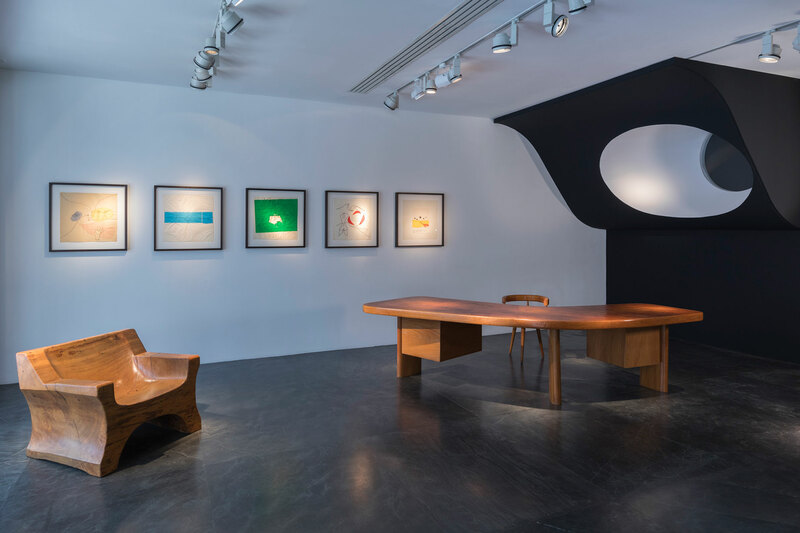 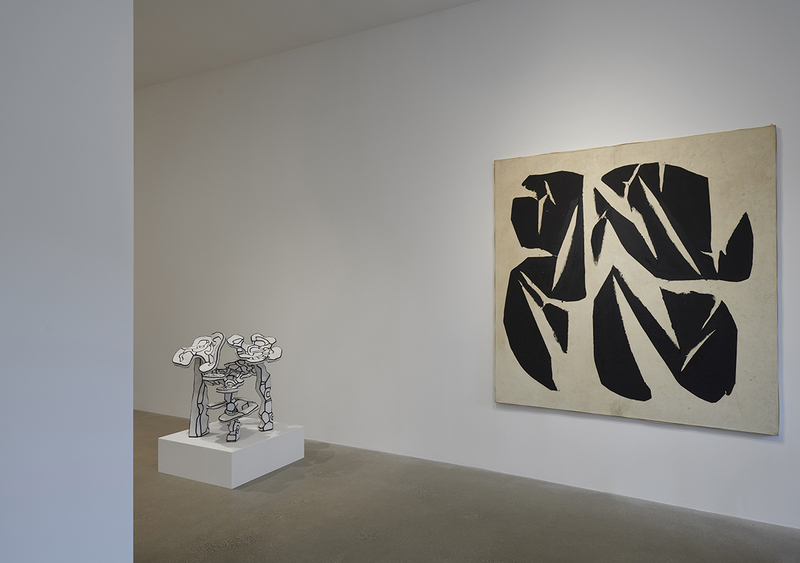 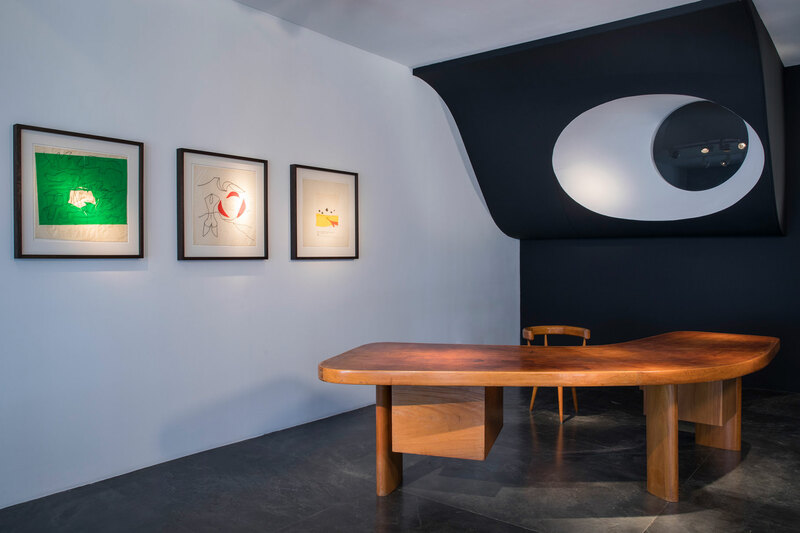 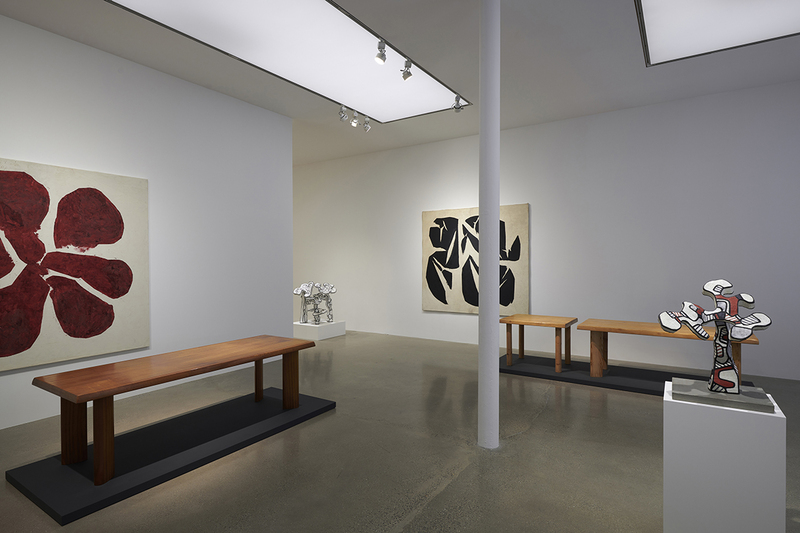 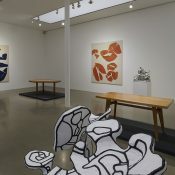 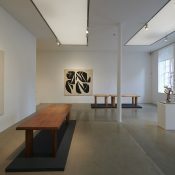 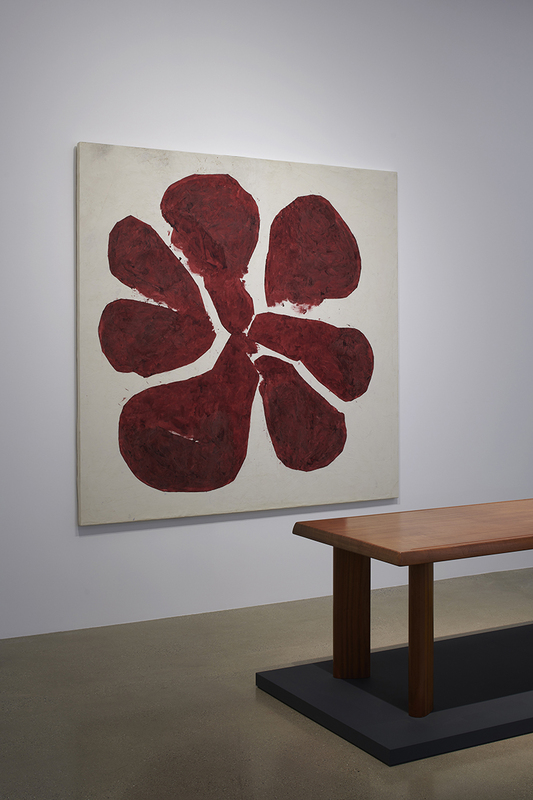 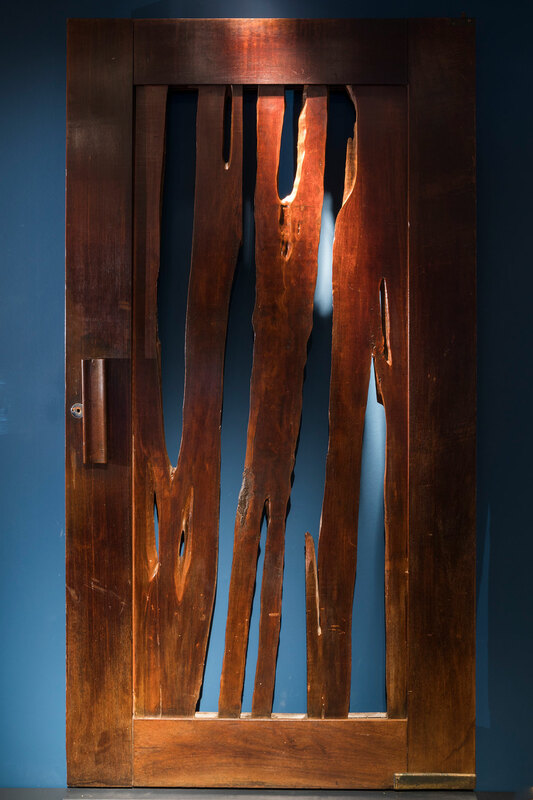 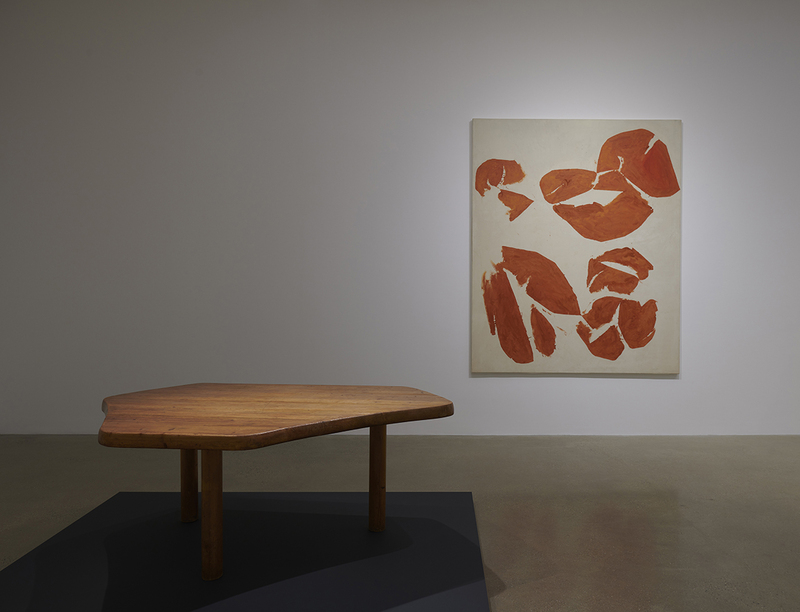 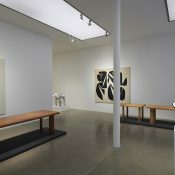 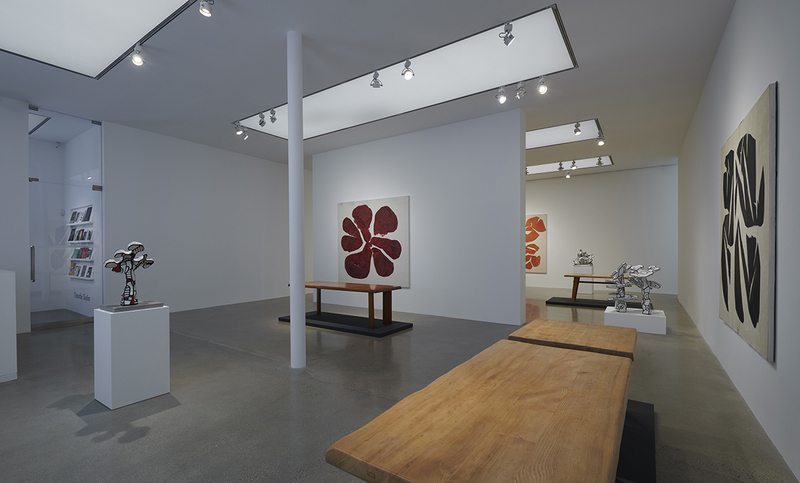 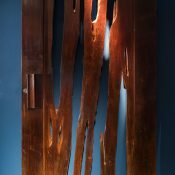 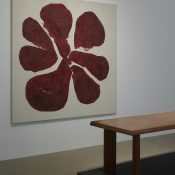 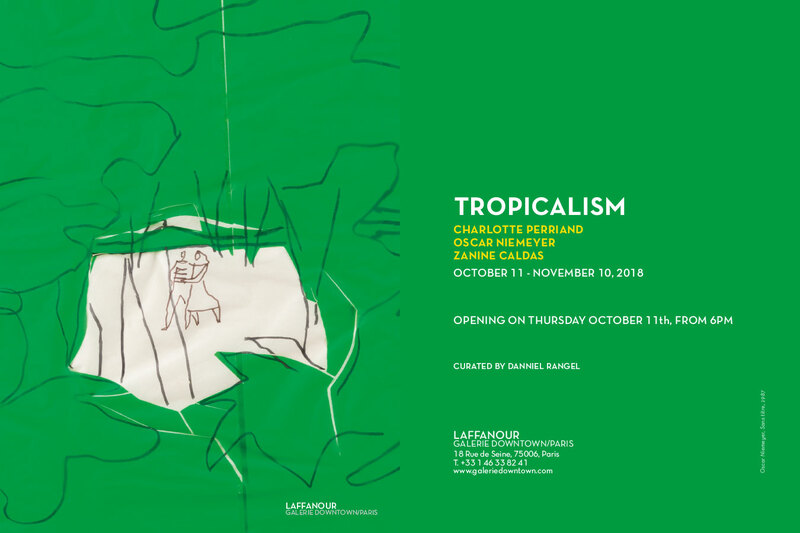 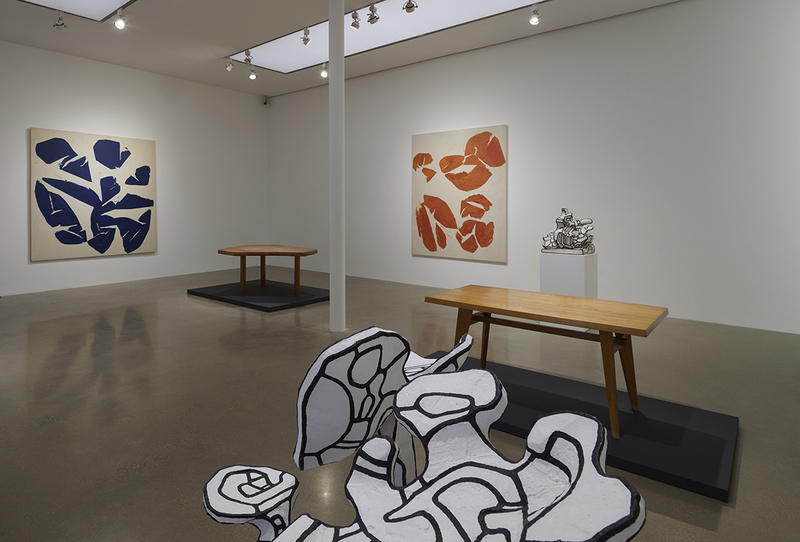 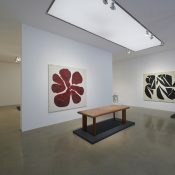 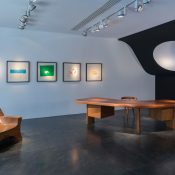 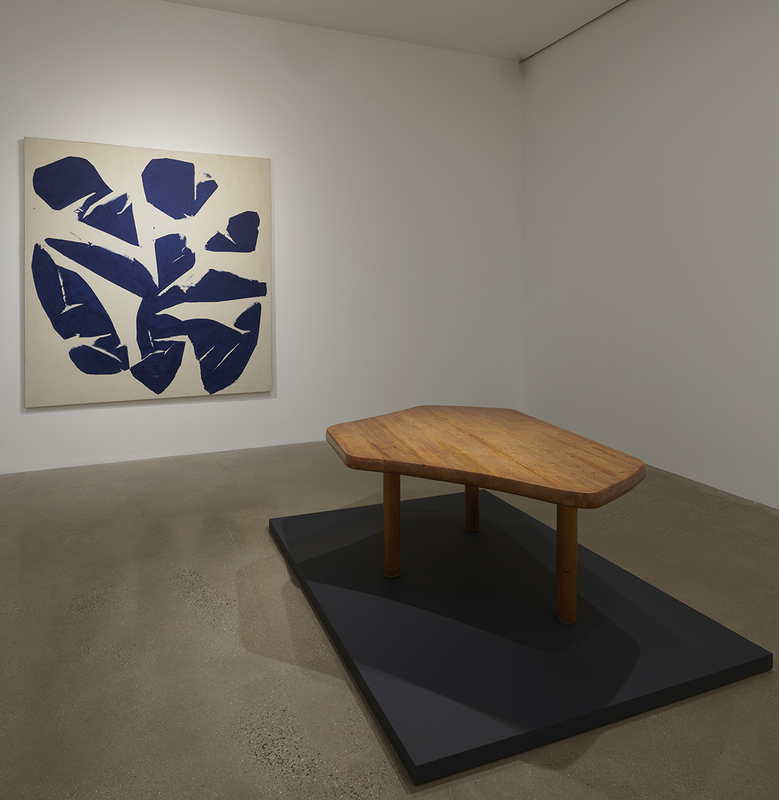 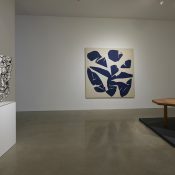 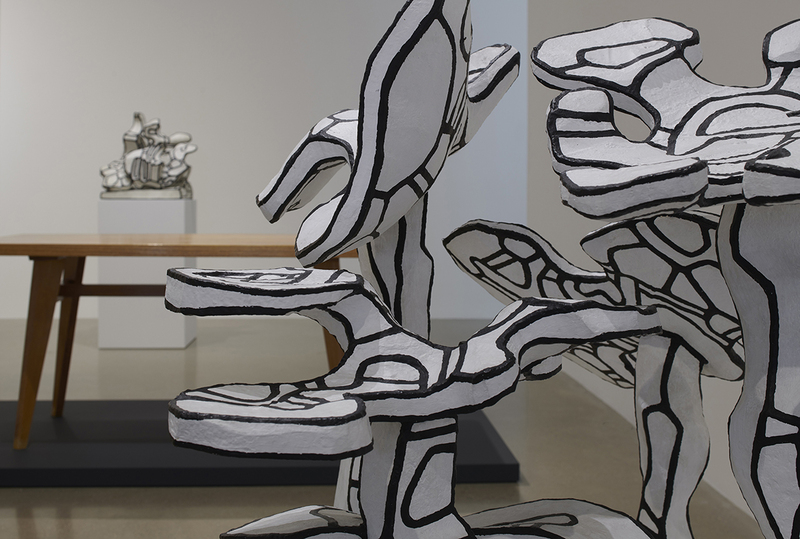 After exhibiting two rare tapestries designed around 1950, the gallery exhibits the sculpture ‘Ozon Opus I’, made in 1947 and kept in the family of his cabinetmaker and friend : Joseph Savina. 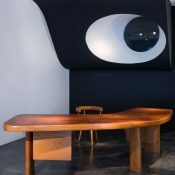 Polychrome wood, monogrammed and dated, this masterpiece is named as the Pyrenean village: Ozon, where Le Corbusier had step down in 1940. 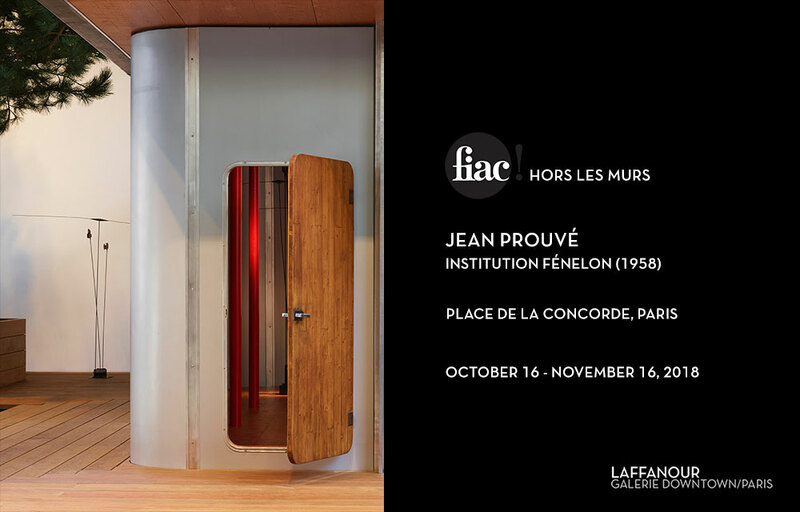 Jean Prouvé (1901-1984), broad mind, both engineer and builder, worked on the industrialization of prefabricated building elements. 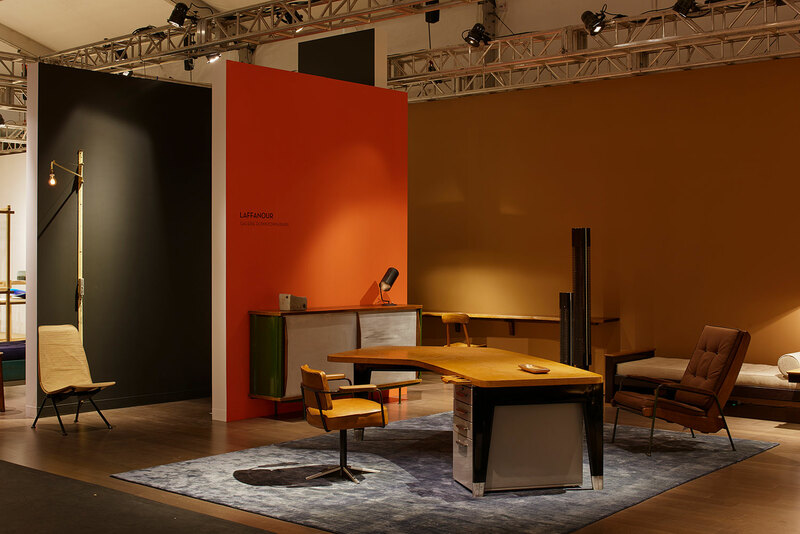 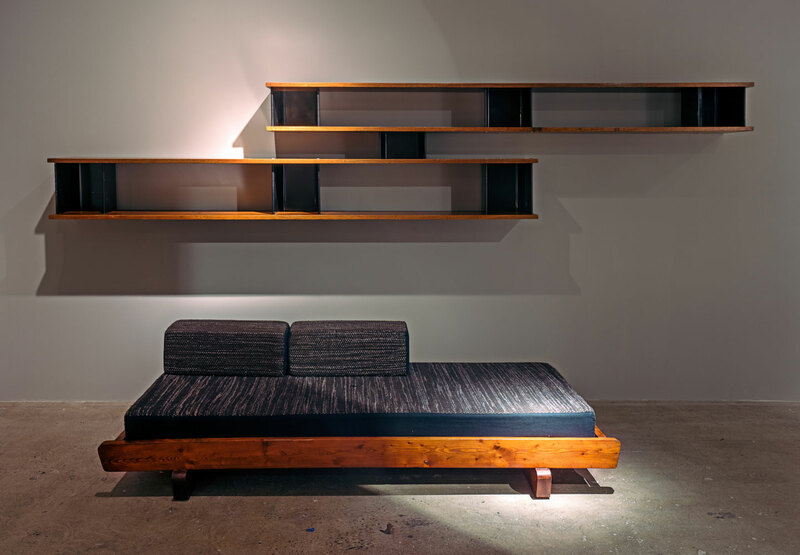 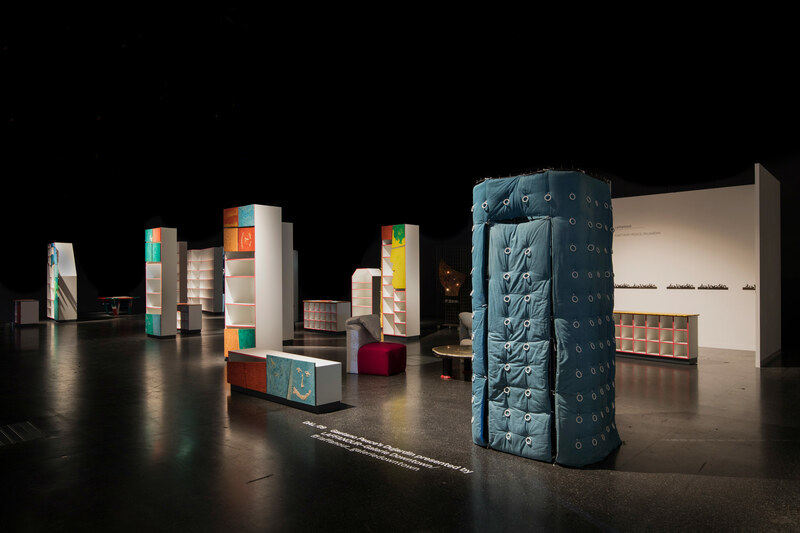 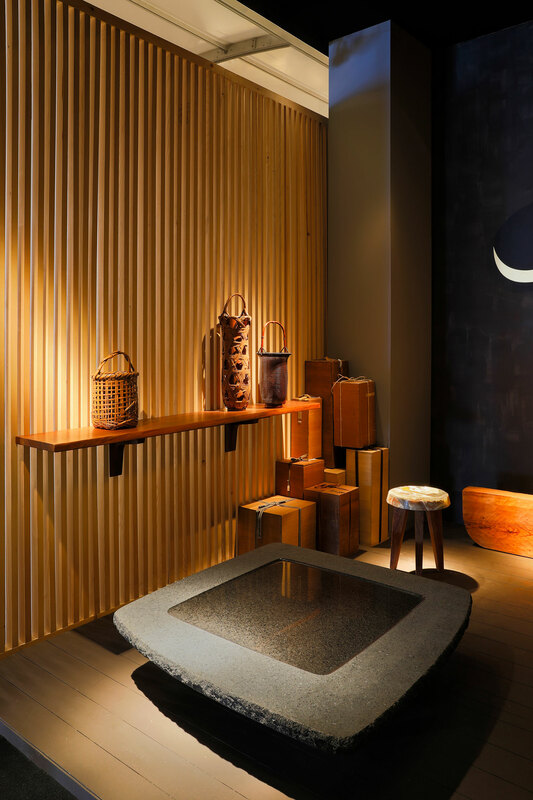 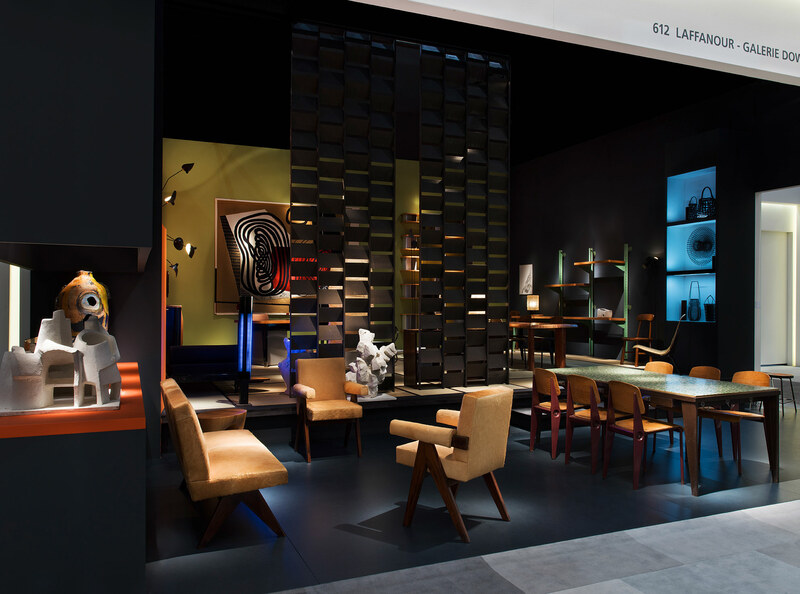 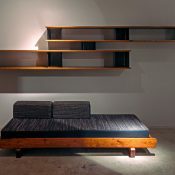 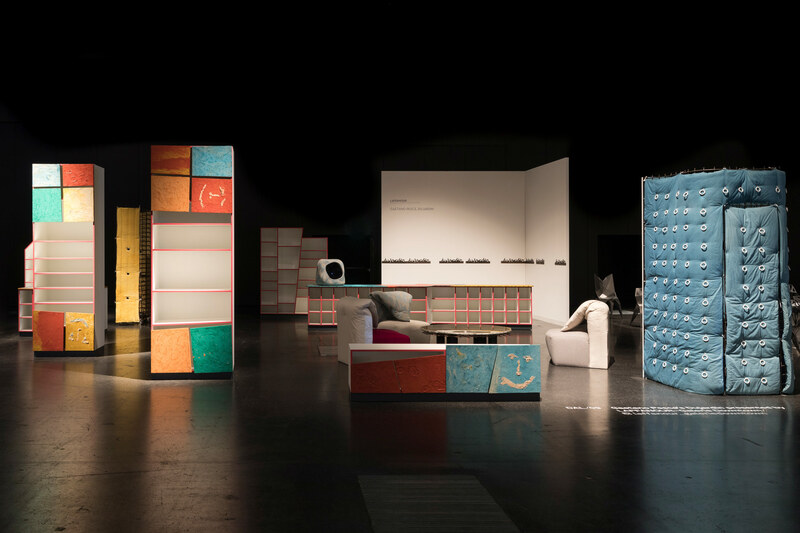 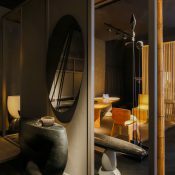 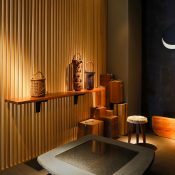 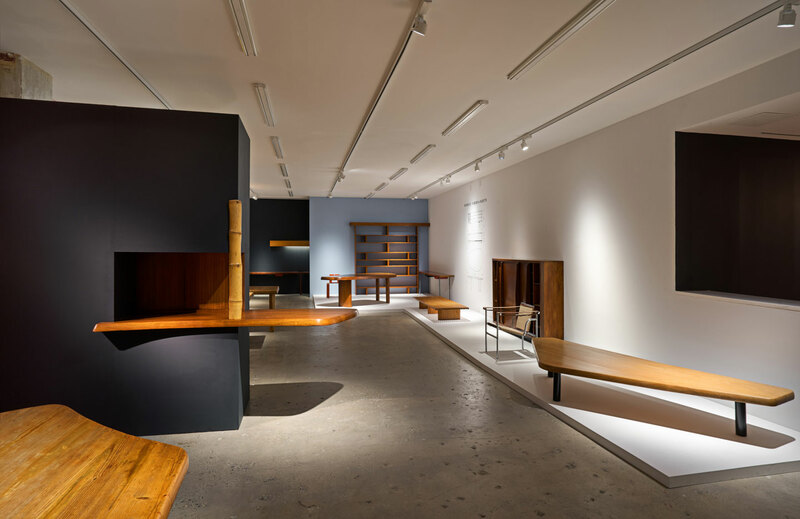 He was also very interested in creating furniture that is functional and accessible to everyone, creating standard furniture as well as special orders. 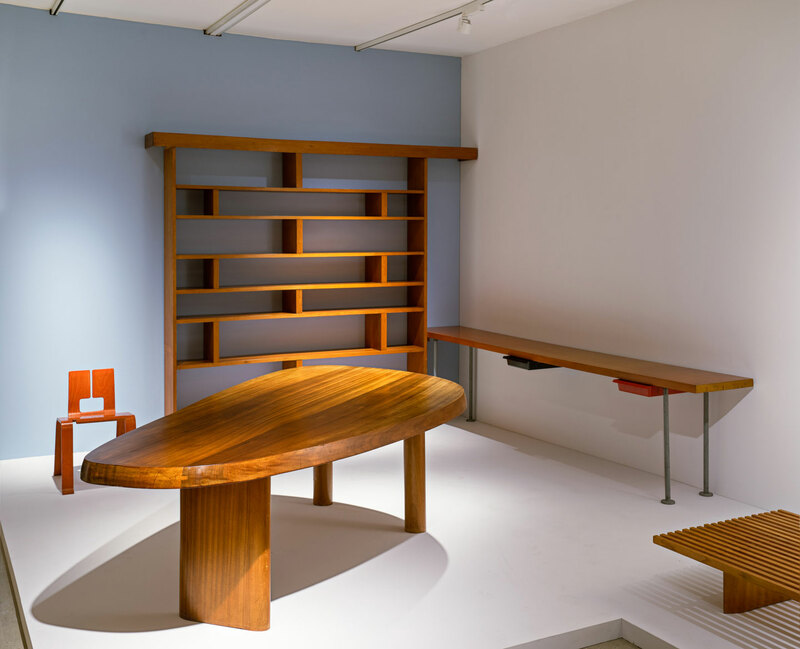 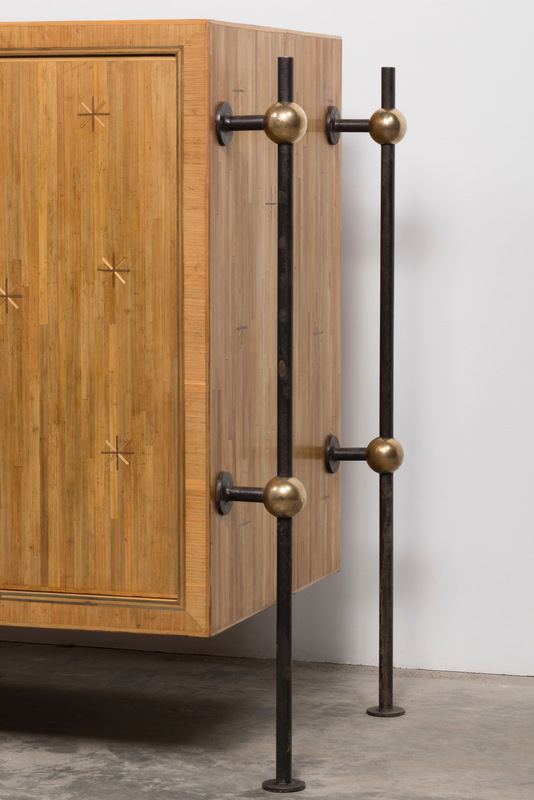 A oor bookcase designed in 1951, forming a desk for Villa Dollander, will be presented. 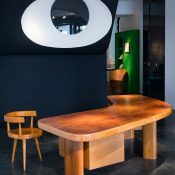 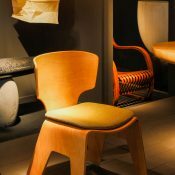 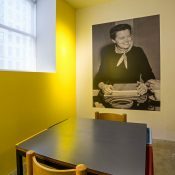 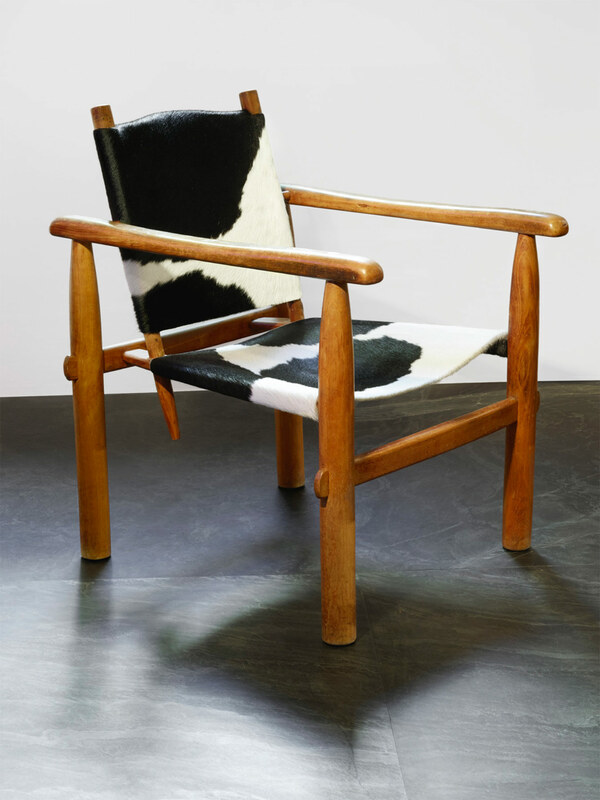 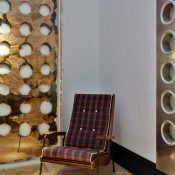 Charlotte Perriand (1903-1999), one of the main gures of 1950s design, a free and committed woman, was devoted to creating furniture combining modern lines with traditional materials and techniques. 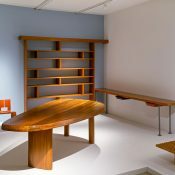 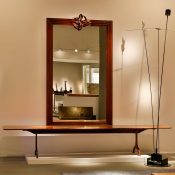 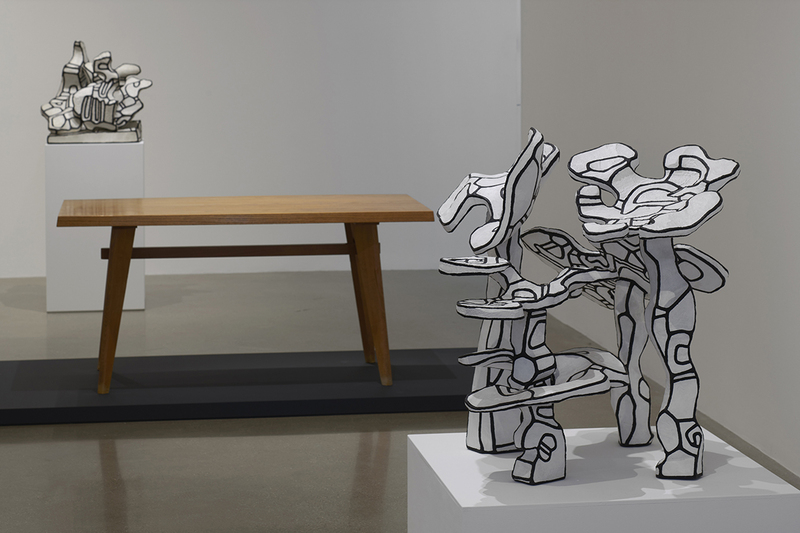 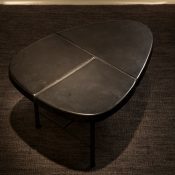 One of its agship furniture: the table of «Free- form» of which a model is exposed. 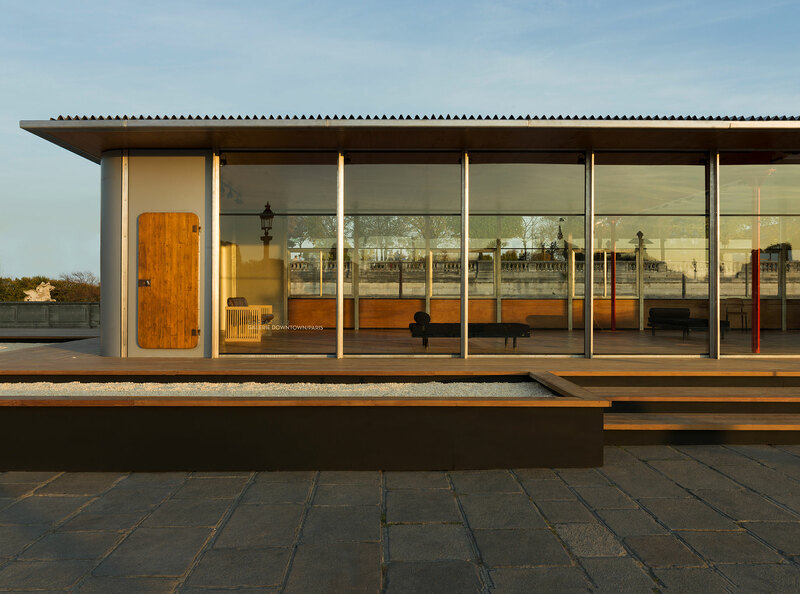 It belonged to a great architect of the Reconstruction, which acquired it in 1960 from the Steph Simon gallery. 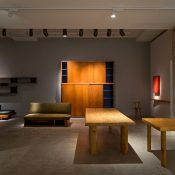 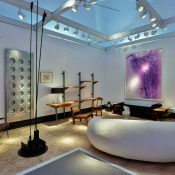 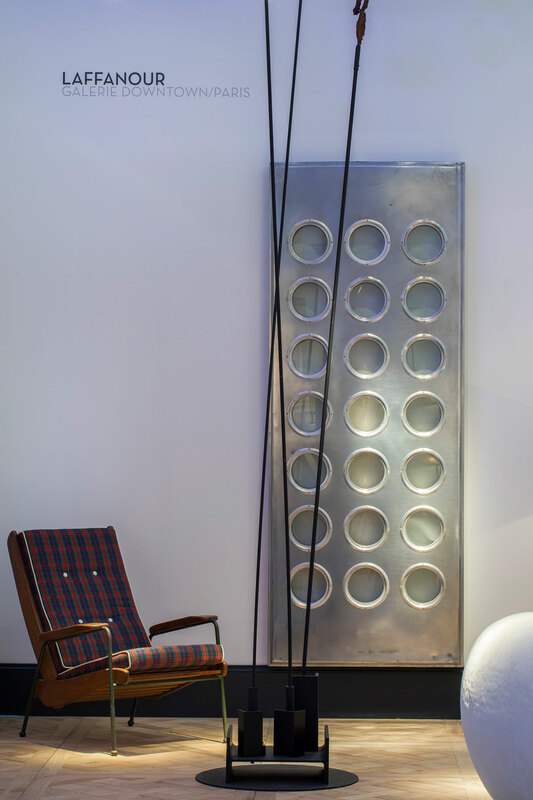 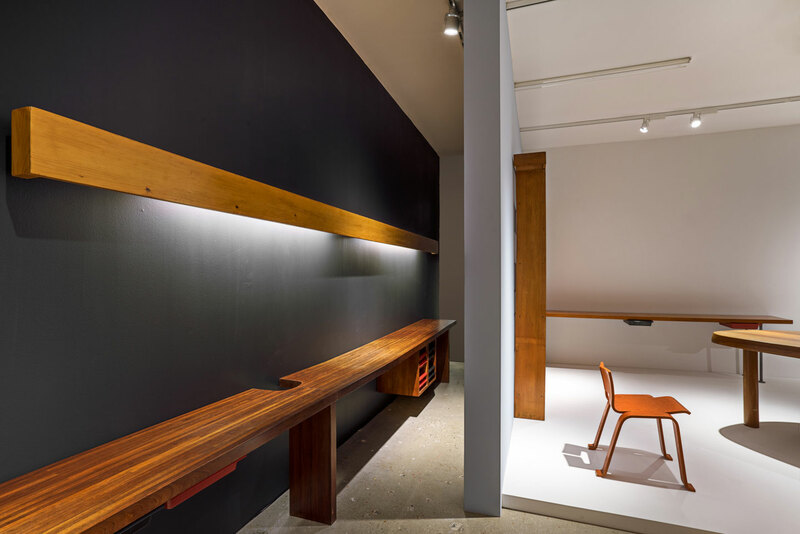 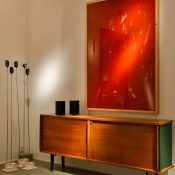 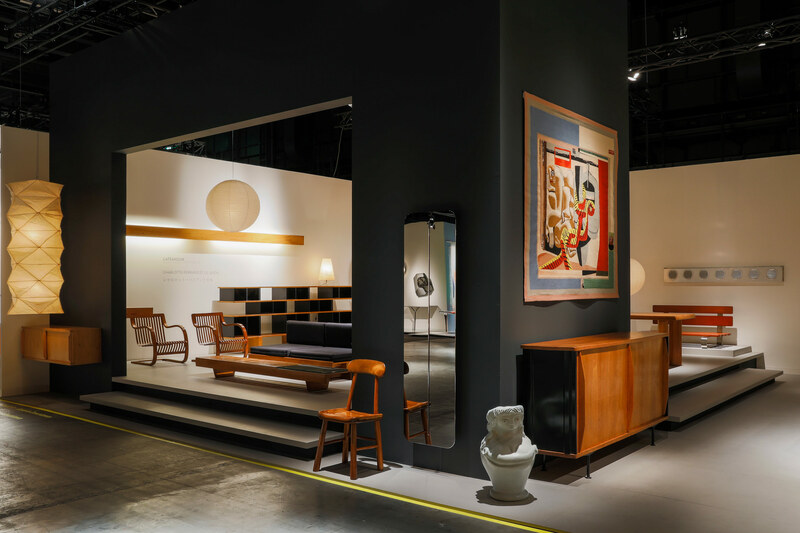 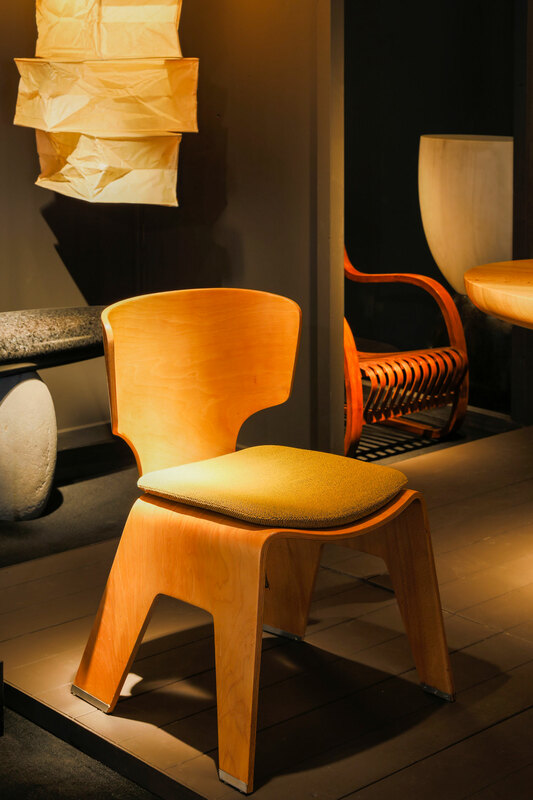 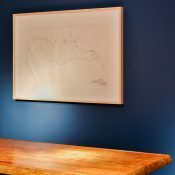 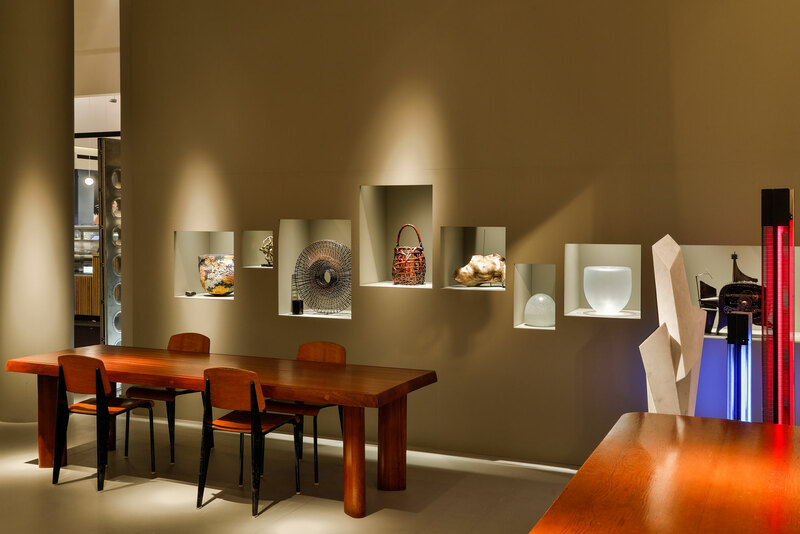 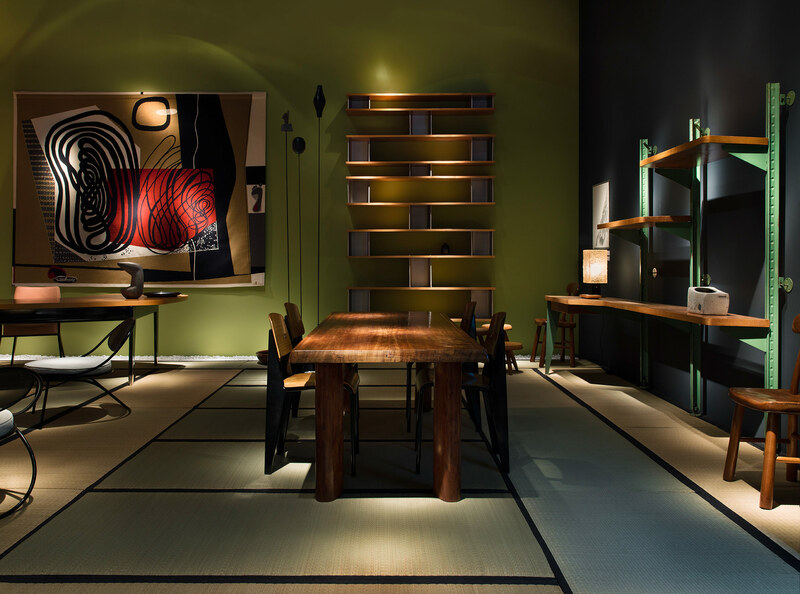 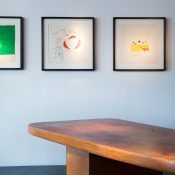 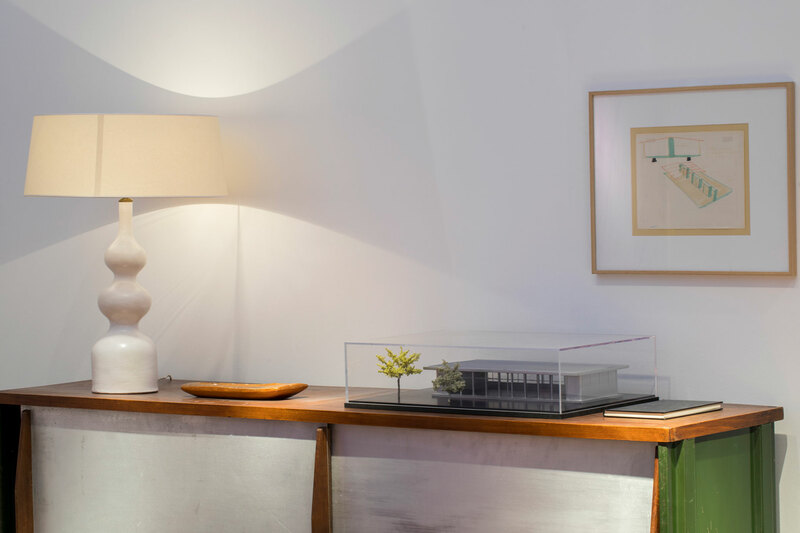 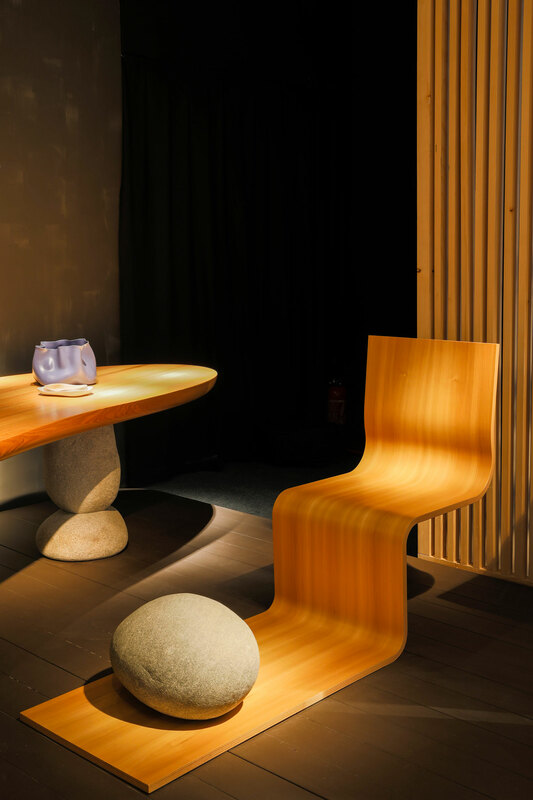 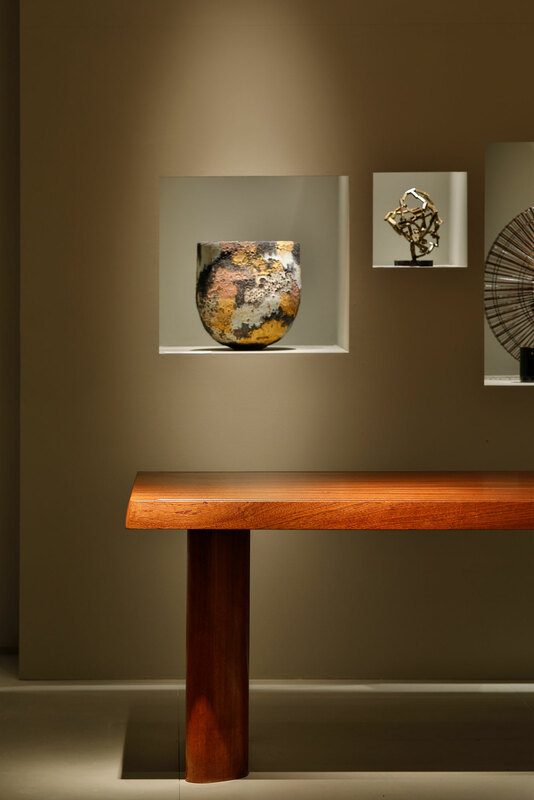 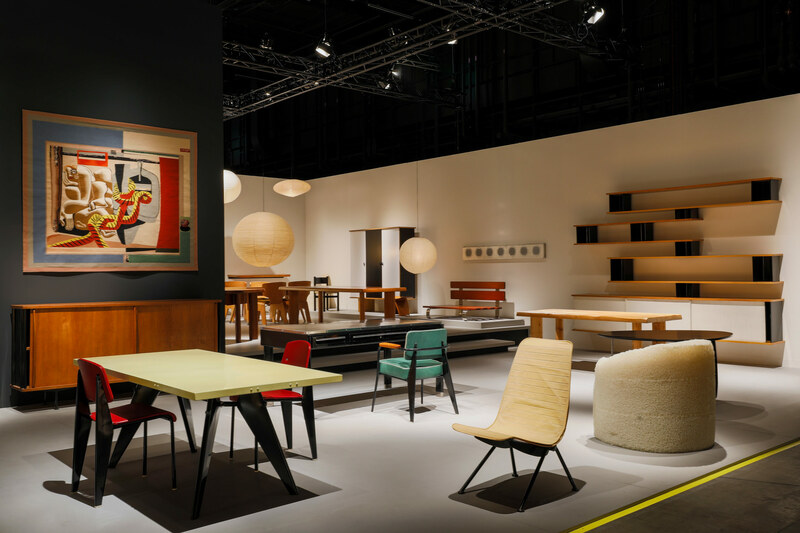 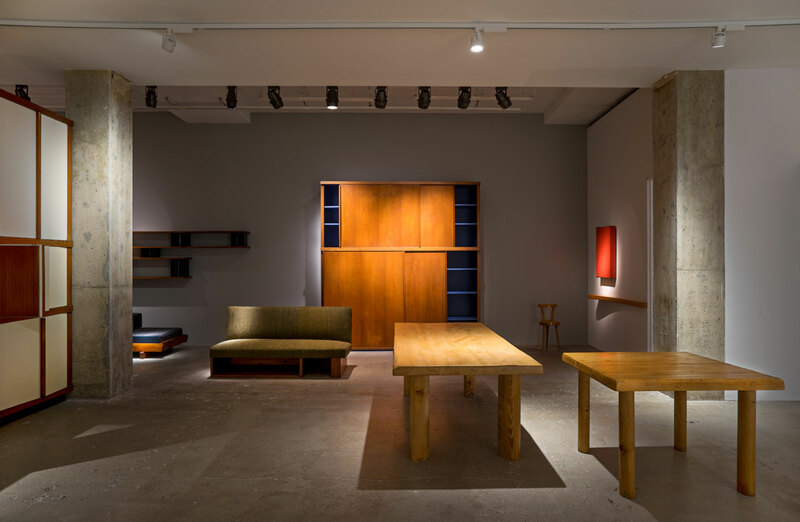 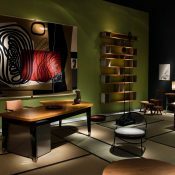 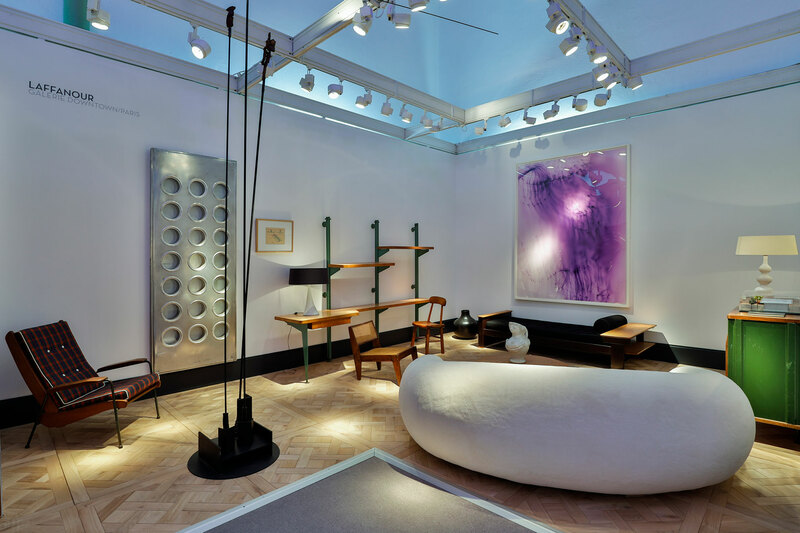 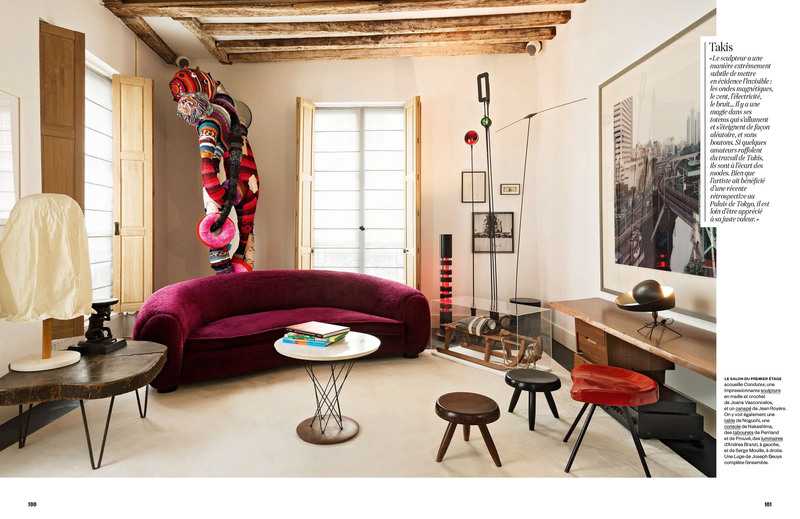 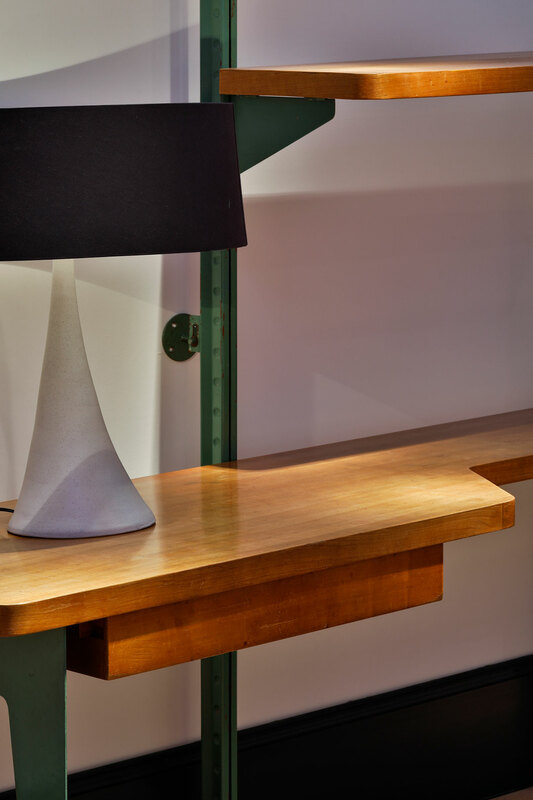 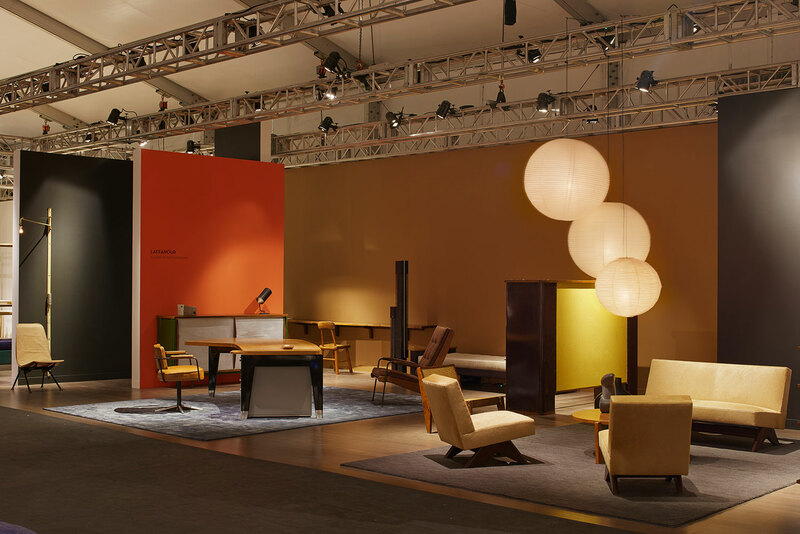 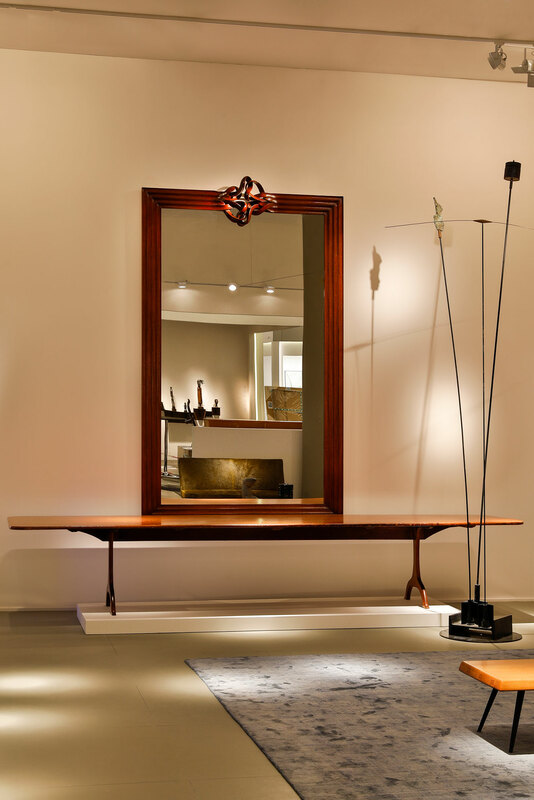 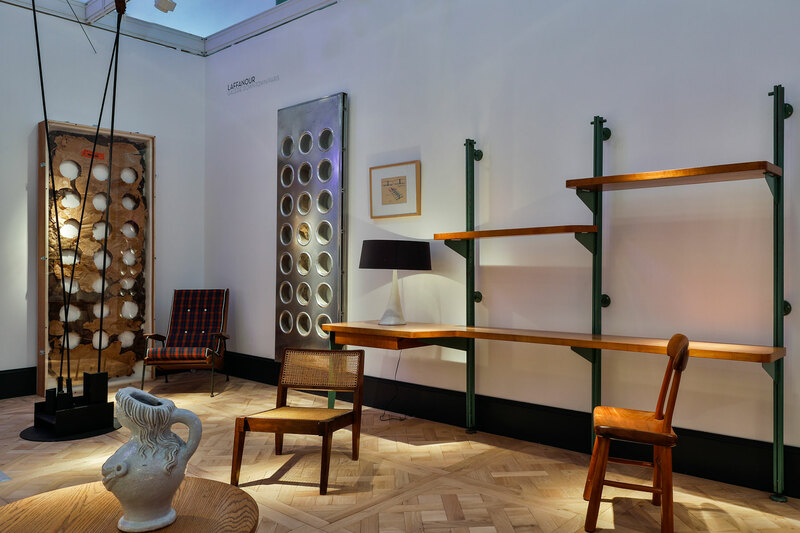 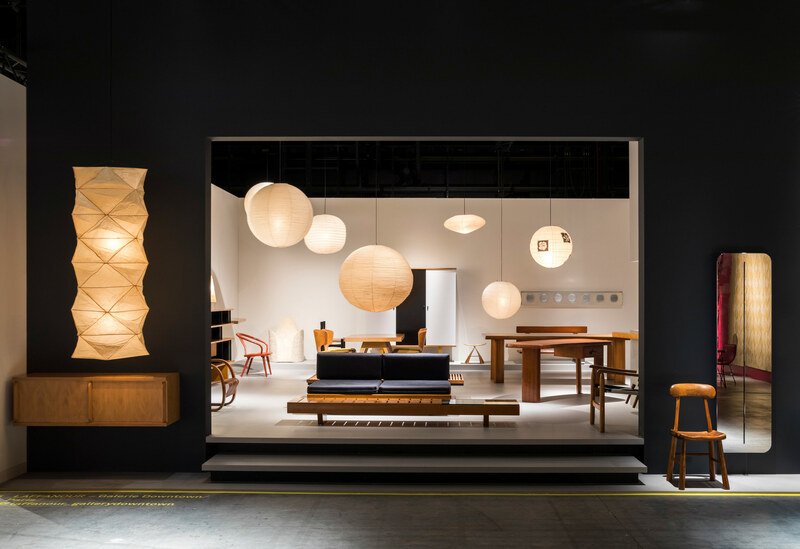 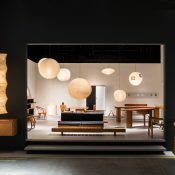 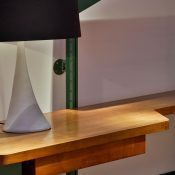 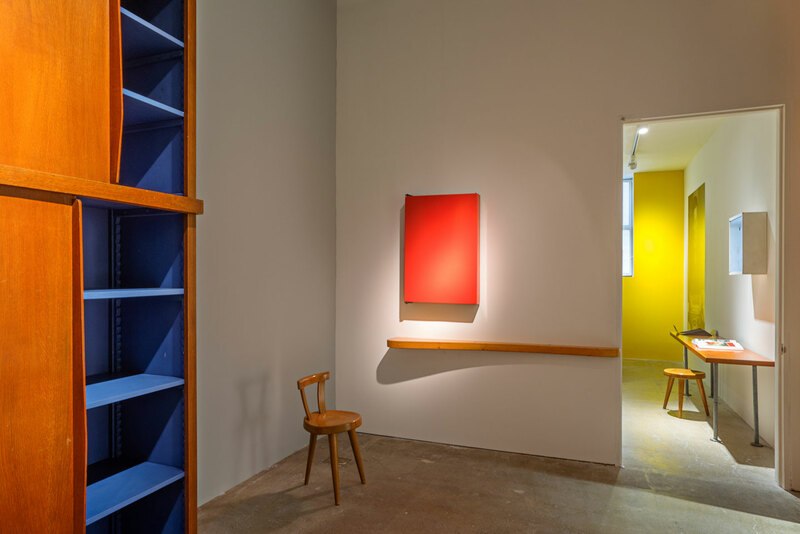 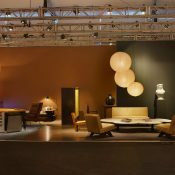 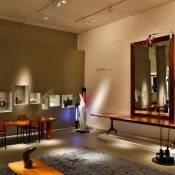 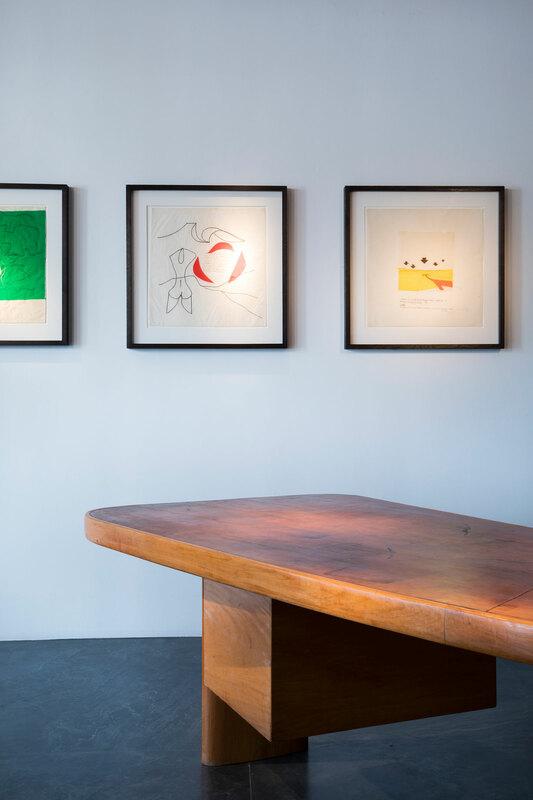 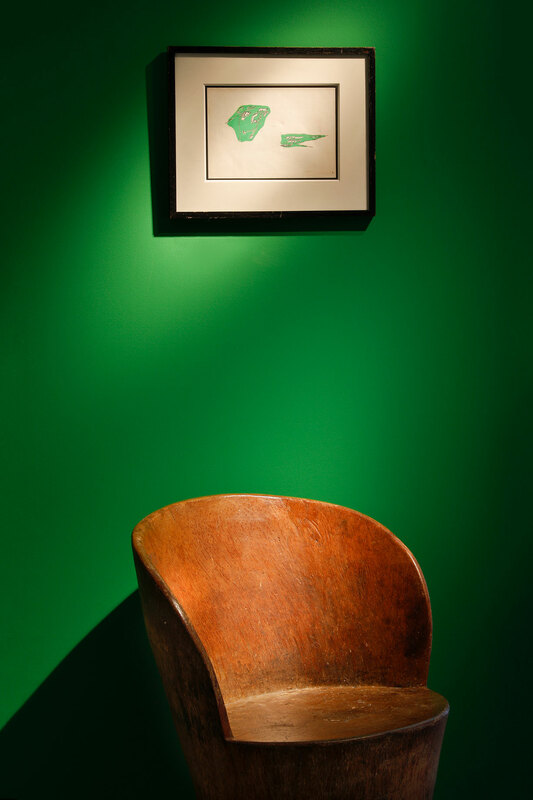 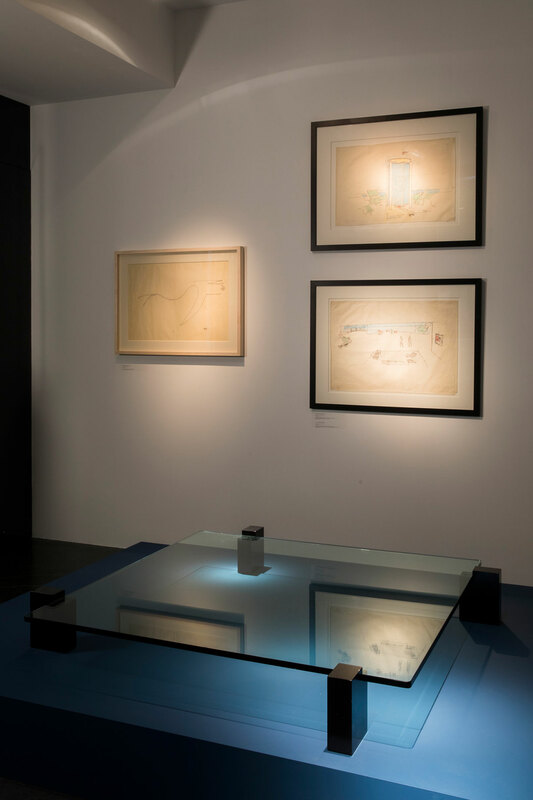 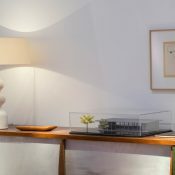 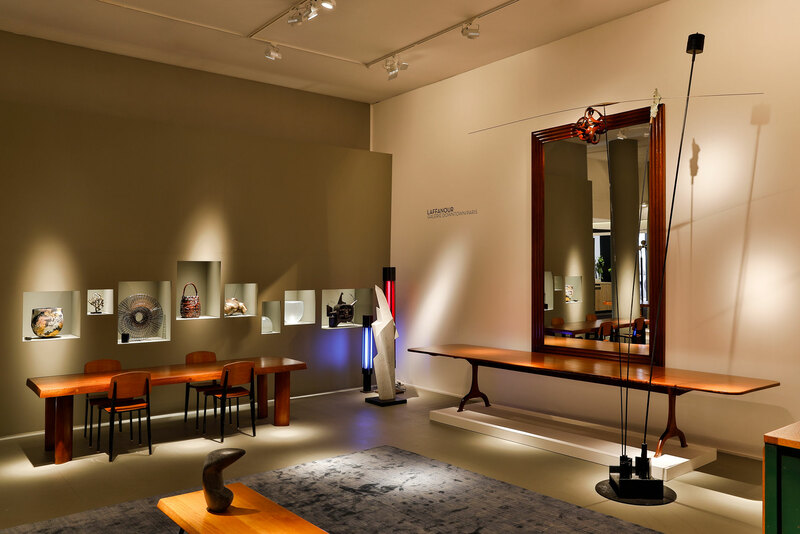 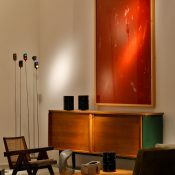 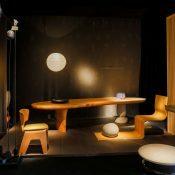 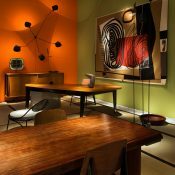 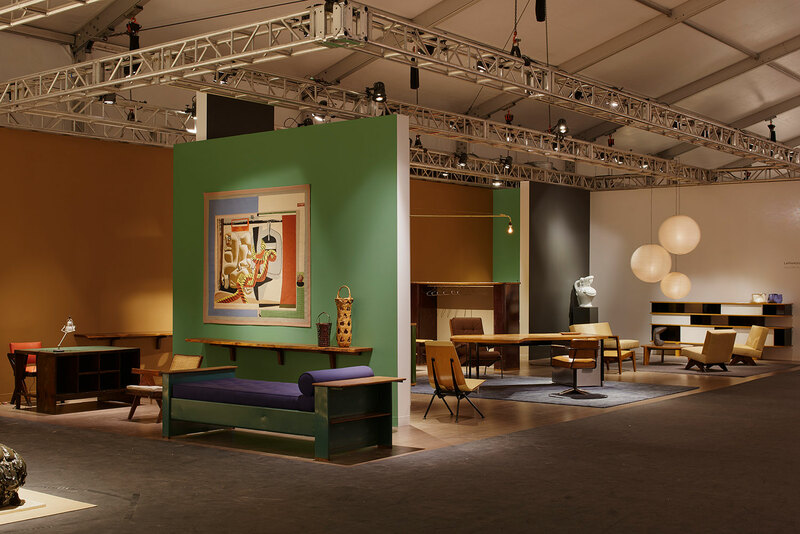 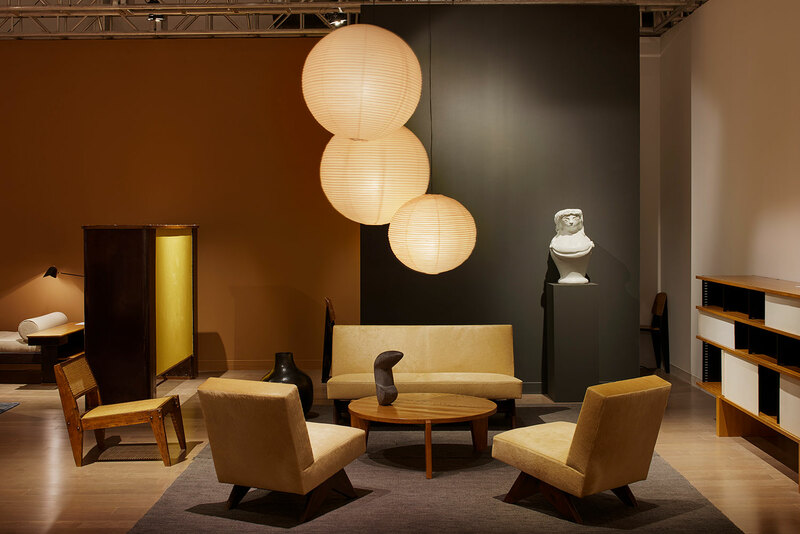 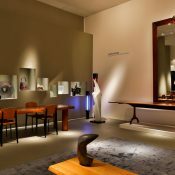 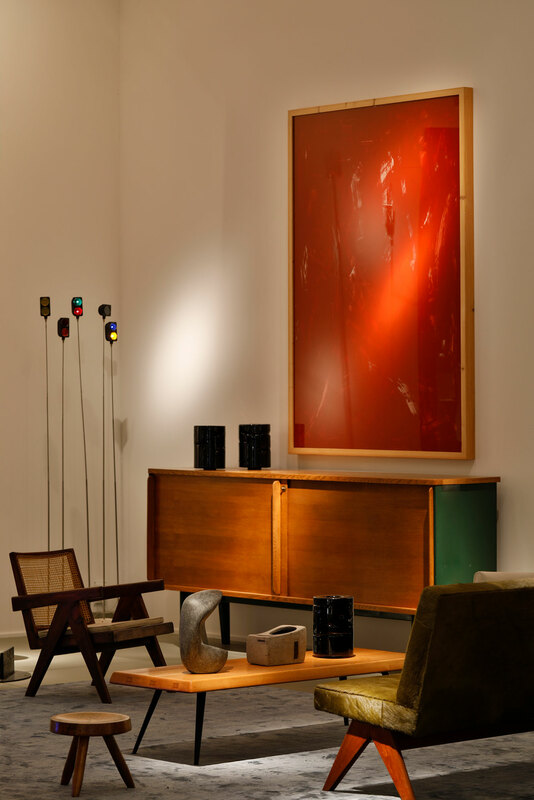 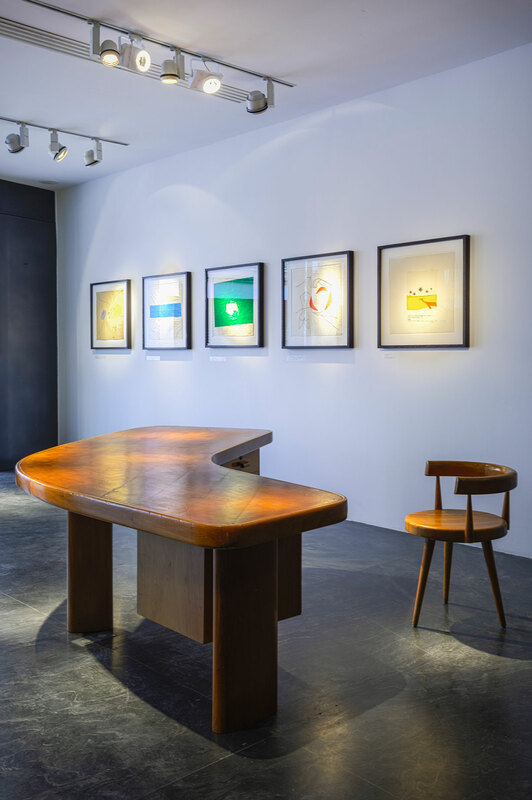 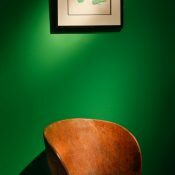 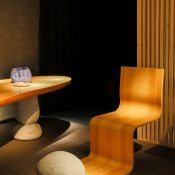 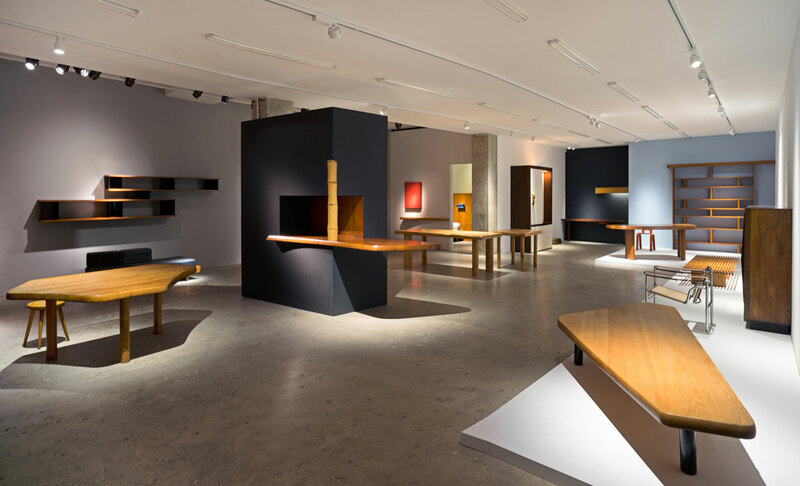 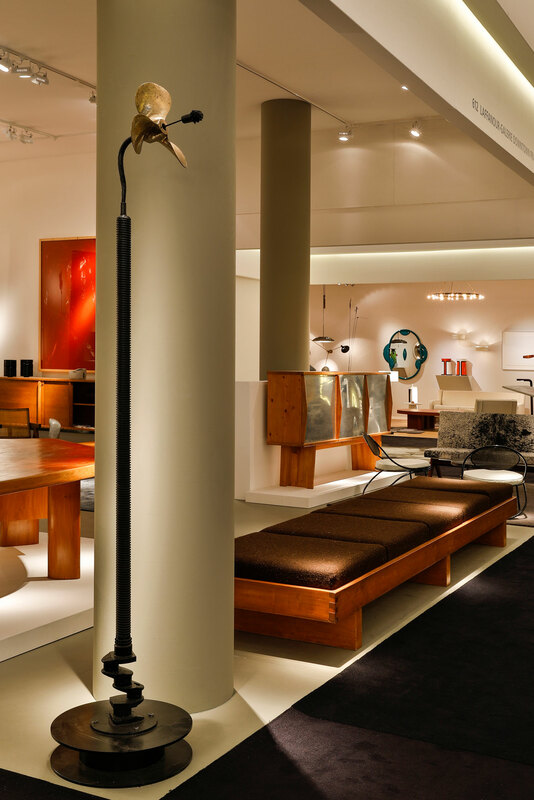 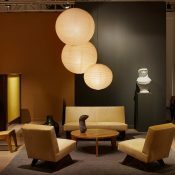 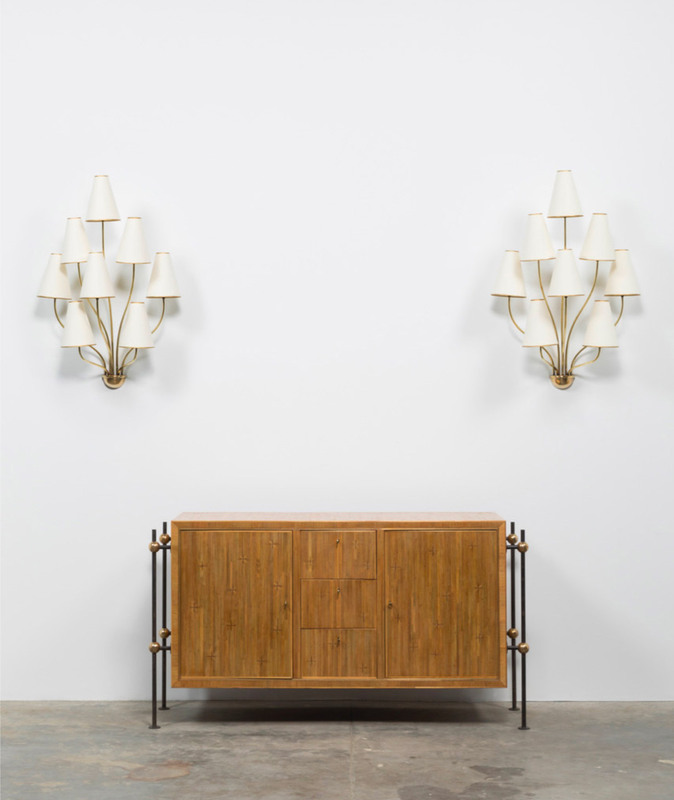 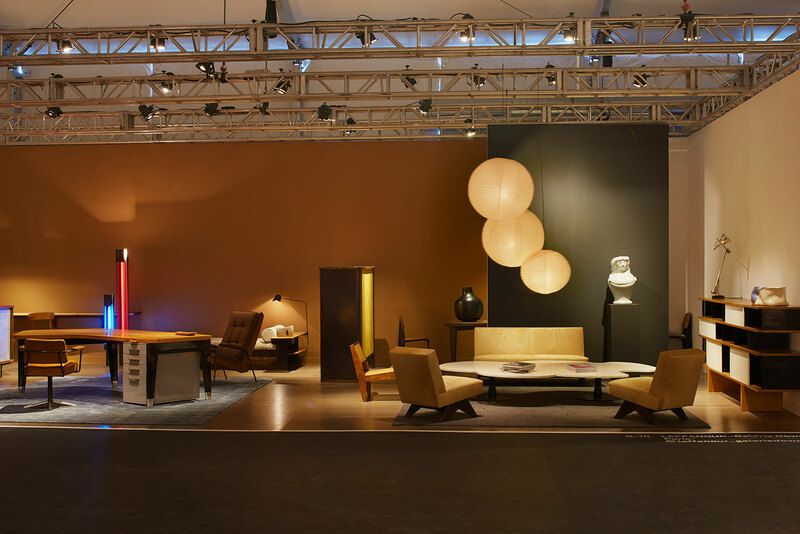 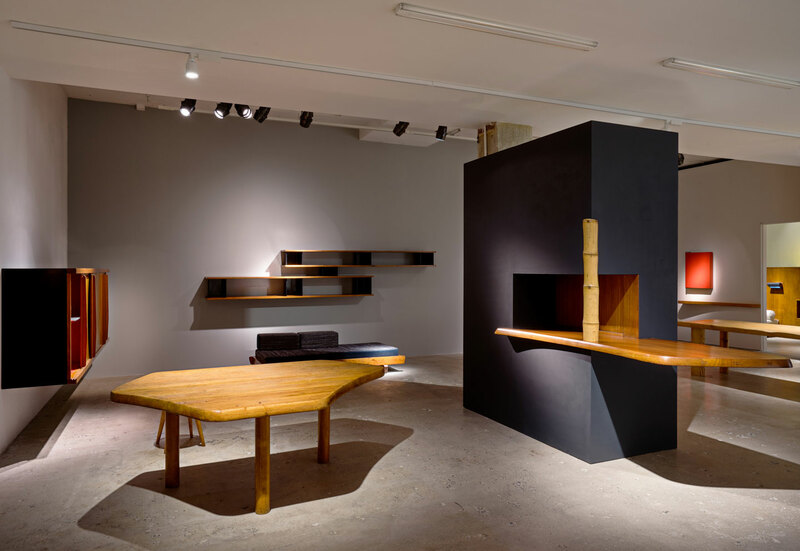 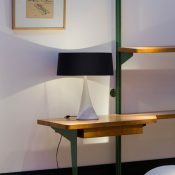 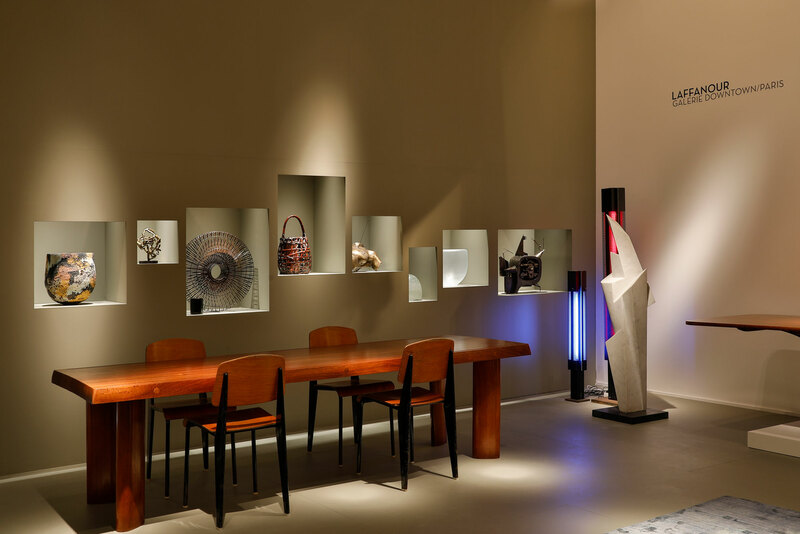 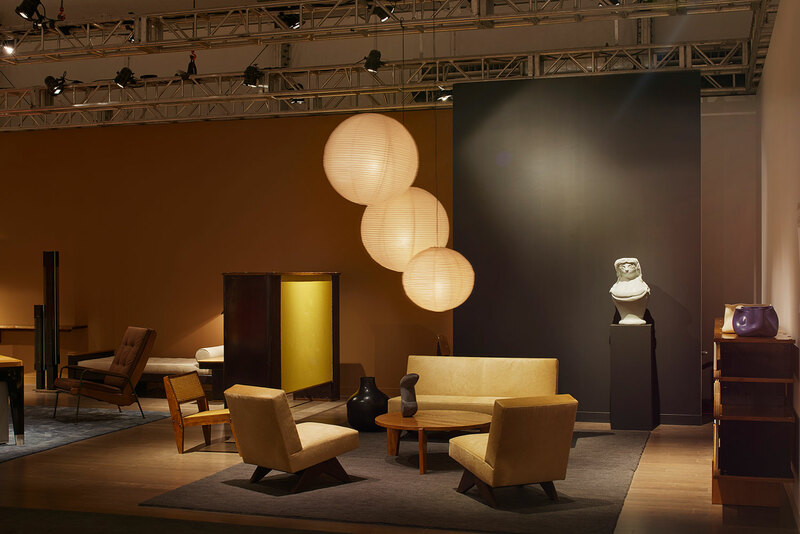 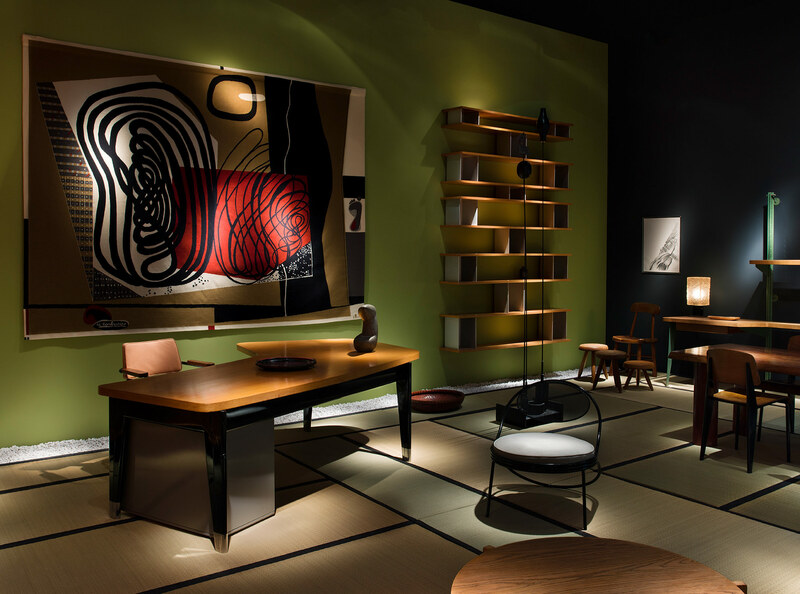 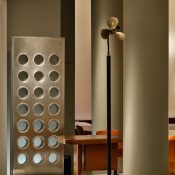 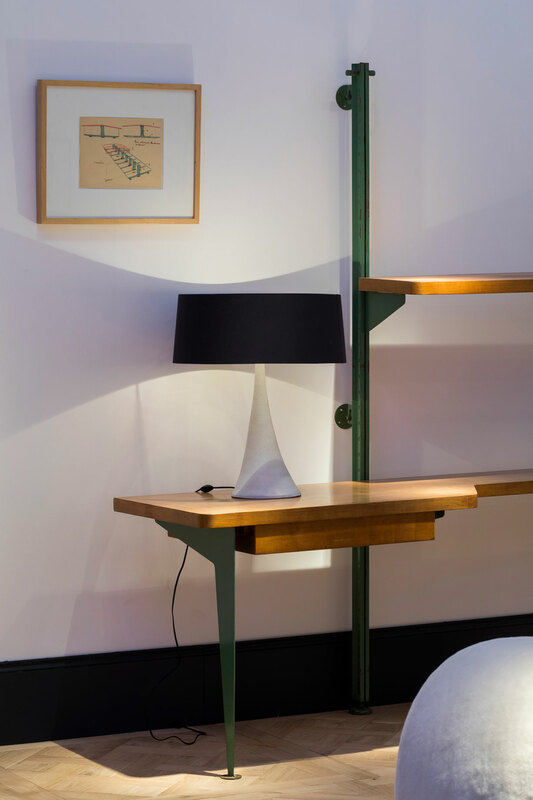 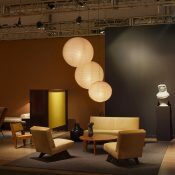 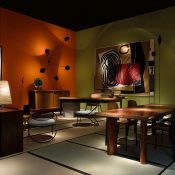 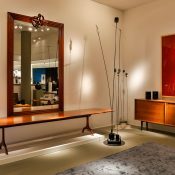 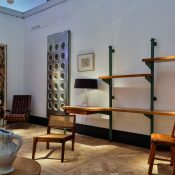 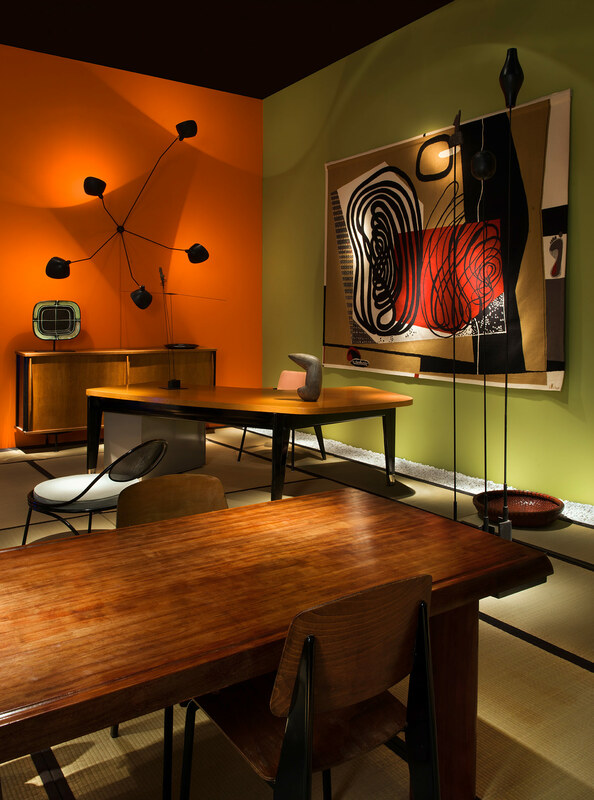 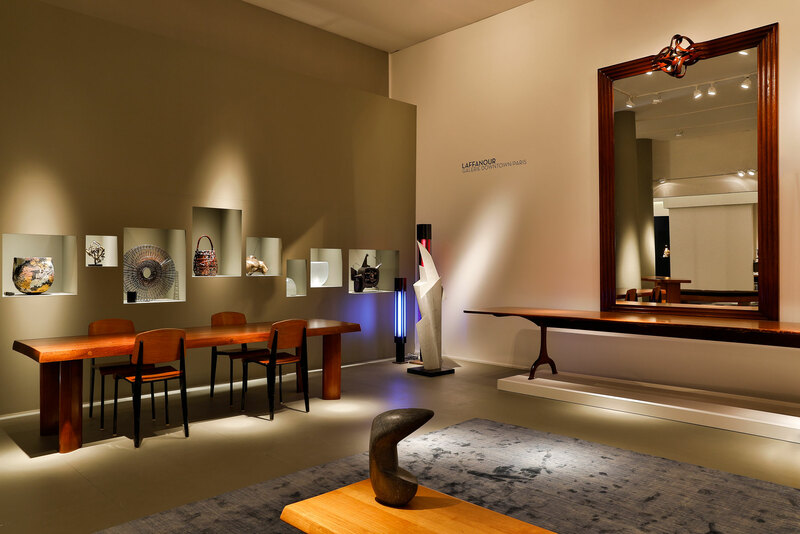 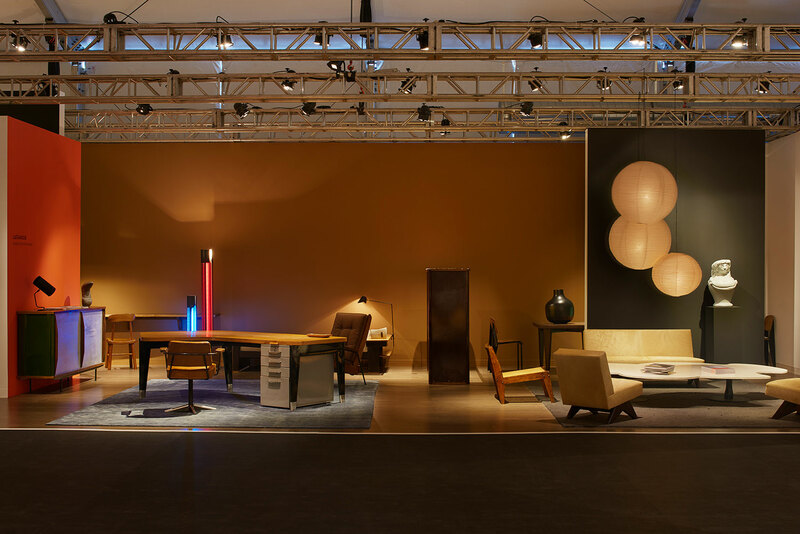 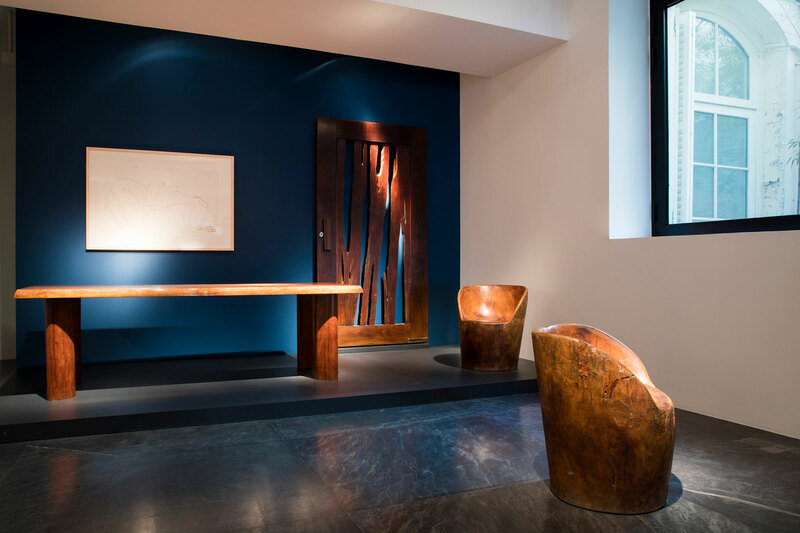 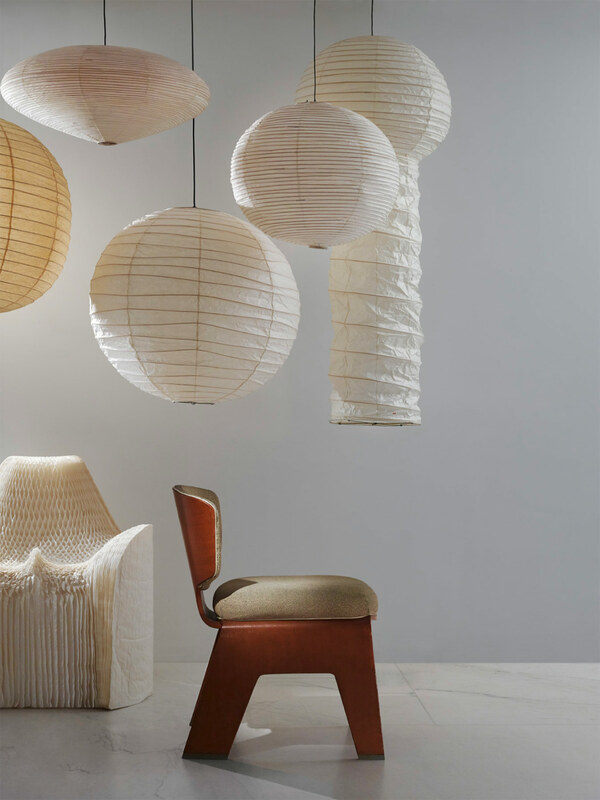 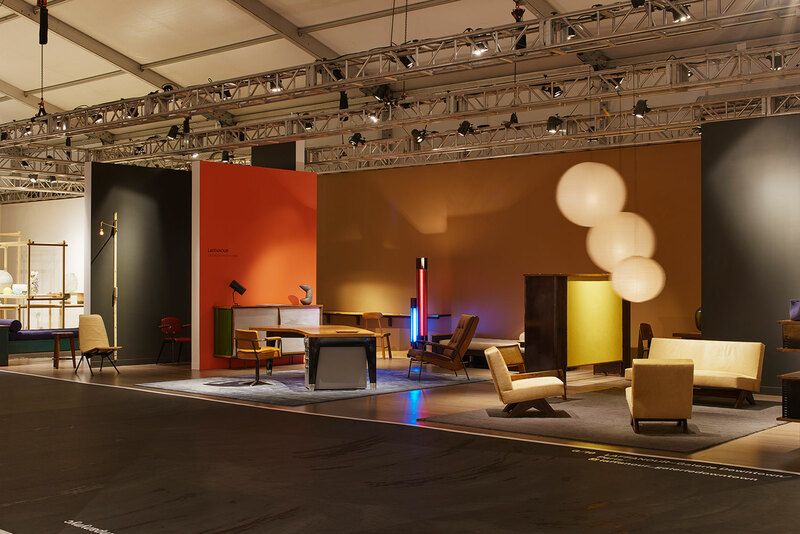 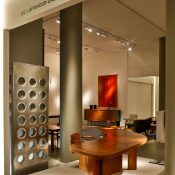 Several iconic pieces by Pierre Jeanneret (1896-1967), Le Corbusier’s right-hand man but also his cousin, and also contemporary pieces, such as a sculpture by Ettore Sottsass (1917-2007) or lighting by Serge Mouille (1922-1988) are exhibited. 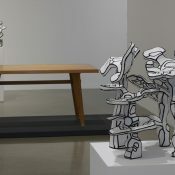 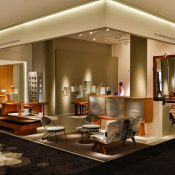 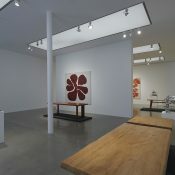 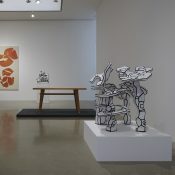 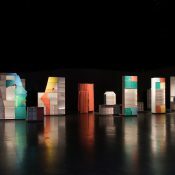 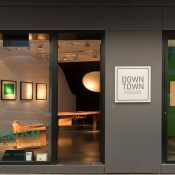 All the pieces will be presented in a very attractive setting, in the architectural tradition that has made the reputation of the displays at Downtown gallery. 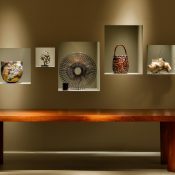 We are happy to announce our collaboration with Nicholas Hall gallery, a major dealer of Old Master Paintings in New York. 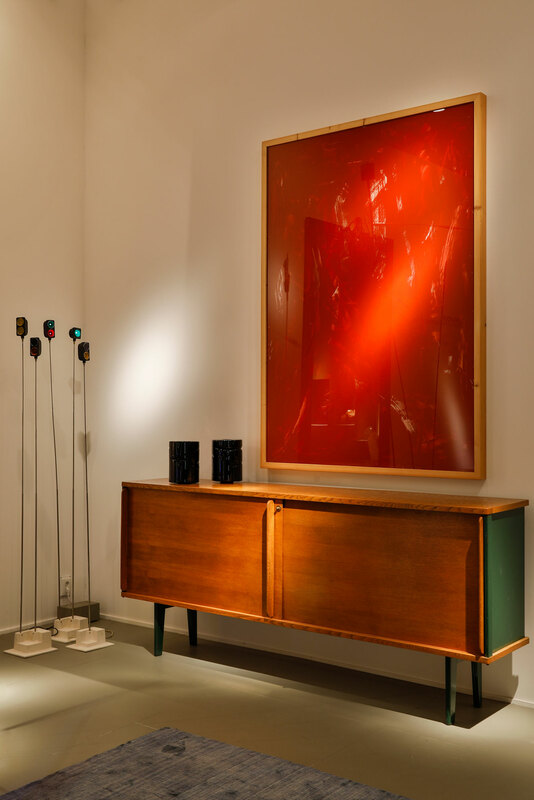 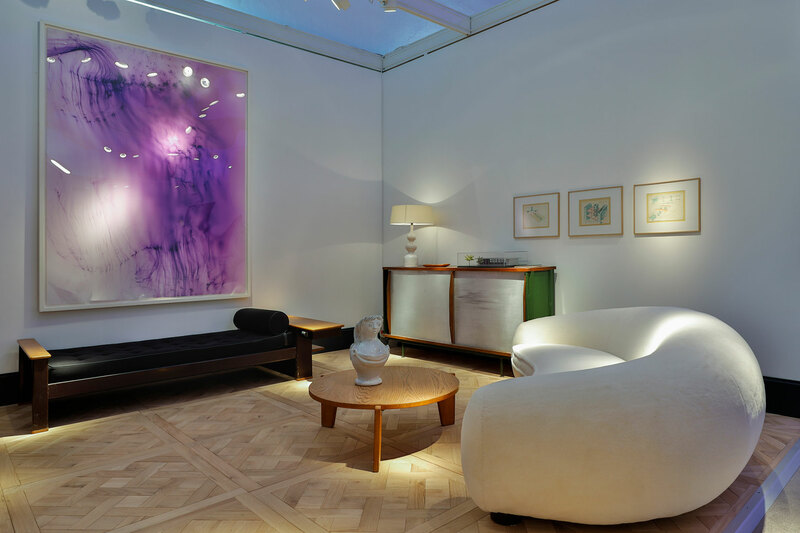 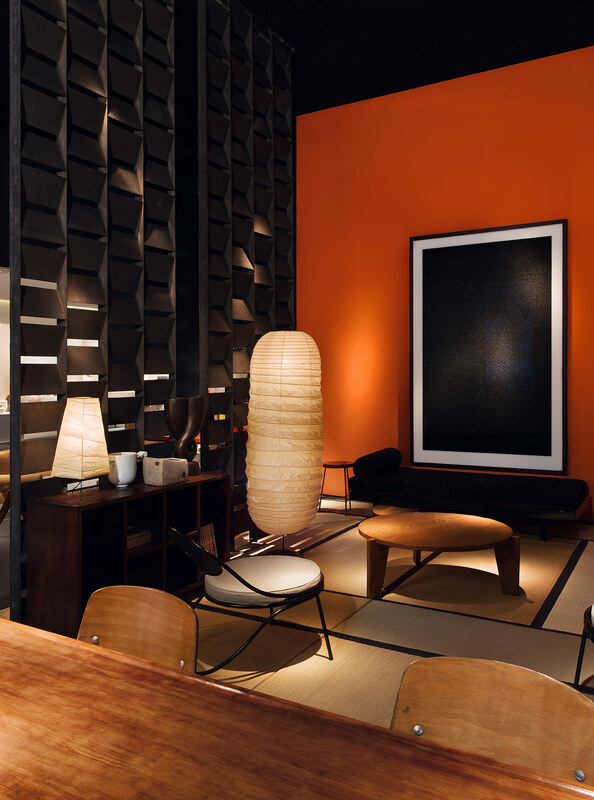 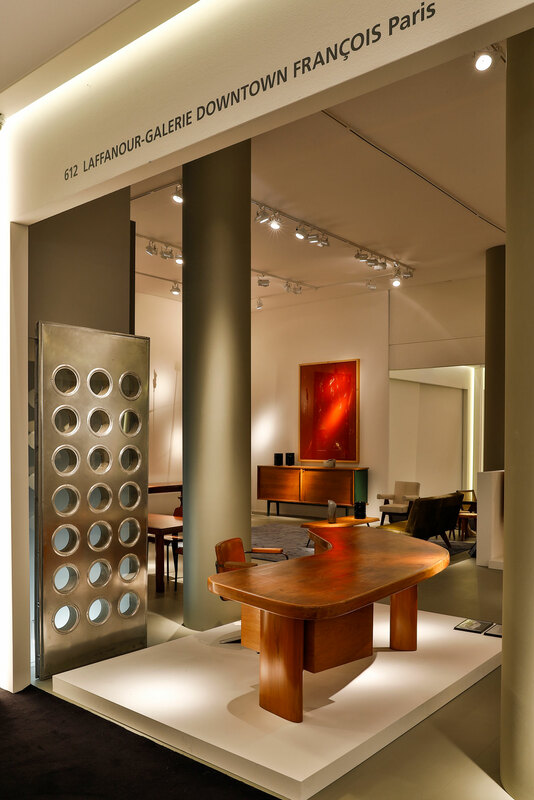 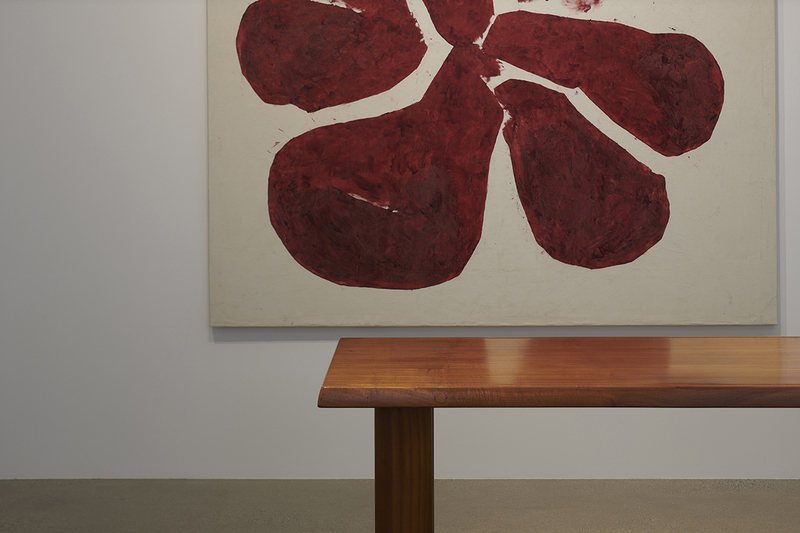 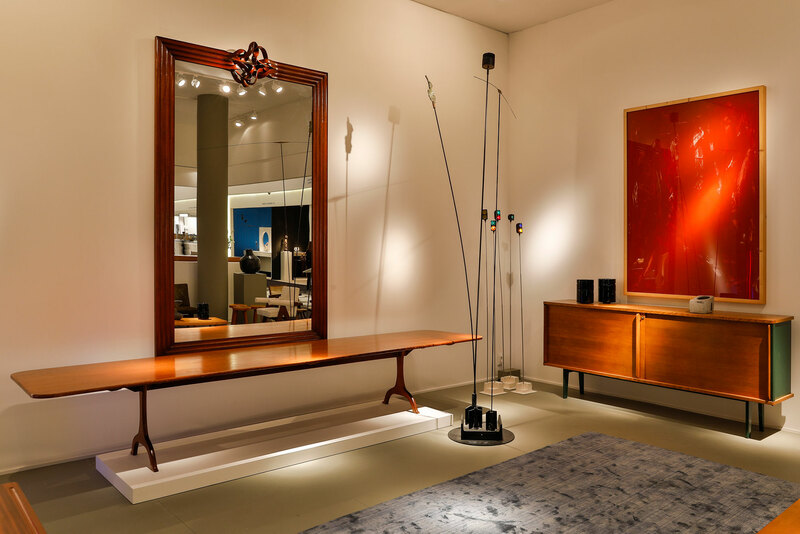 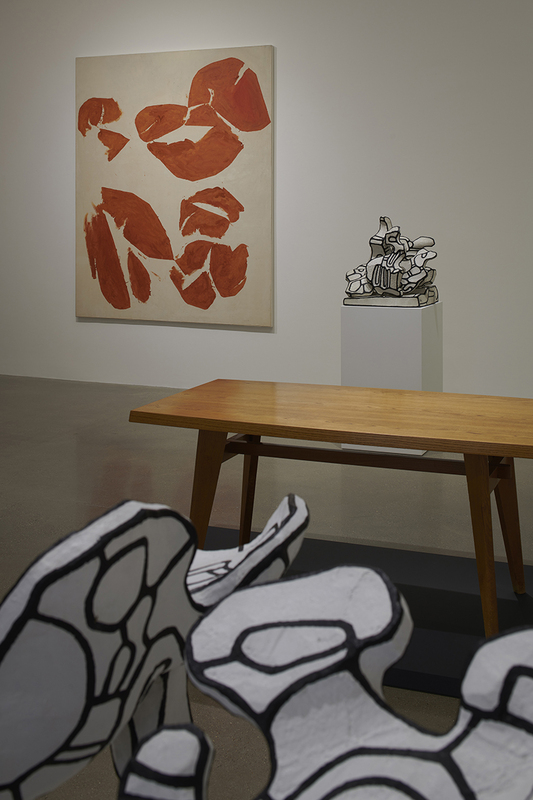 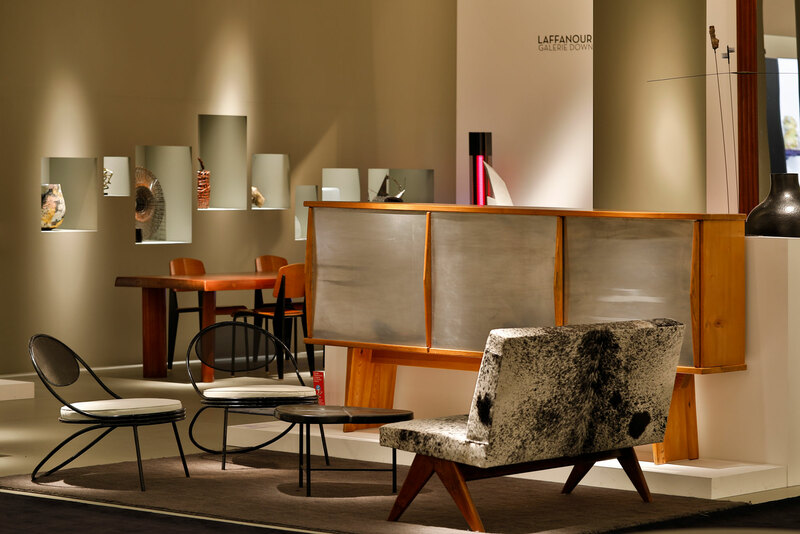 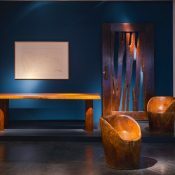 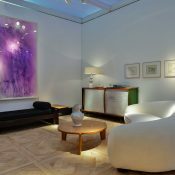 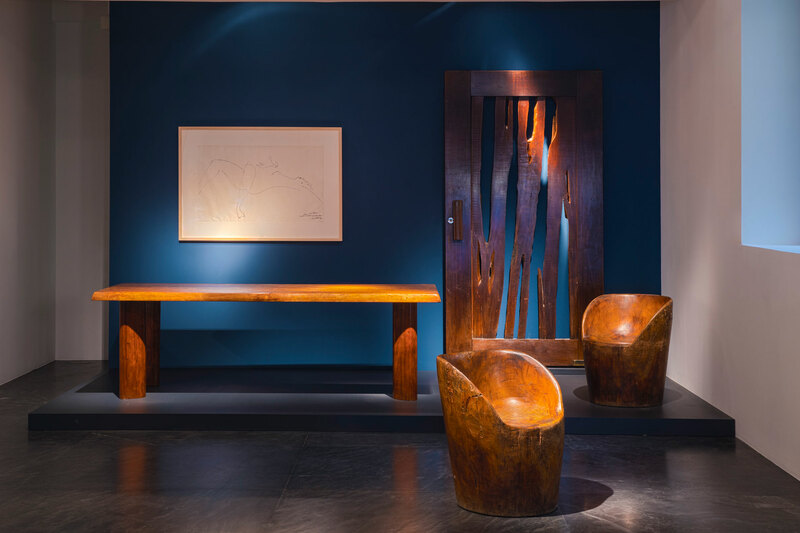 Although the combination of 20th-century furniture and Post-War painting has been popular for some years, this is the first time a dealer has juxtaposed European Master paintings and sculpture with modern furniture. 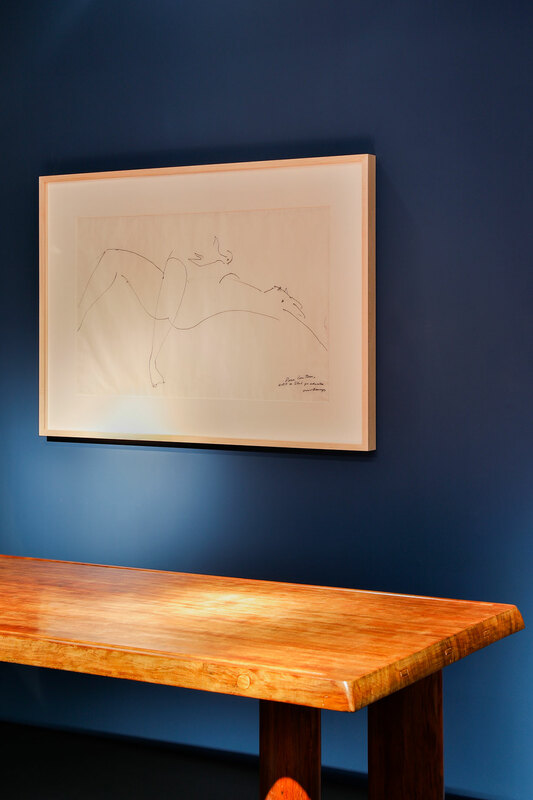 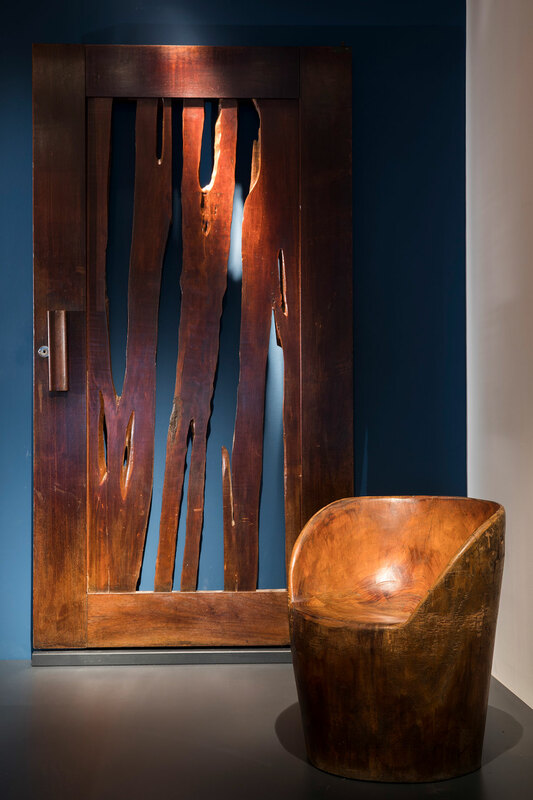 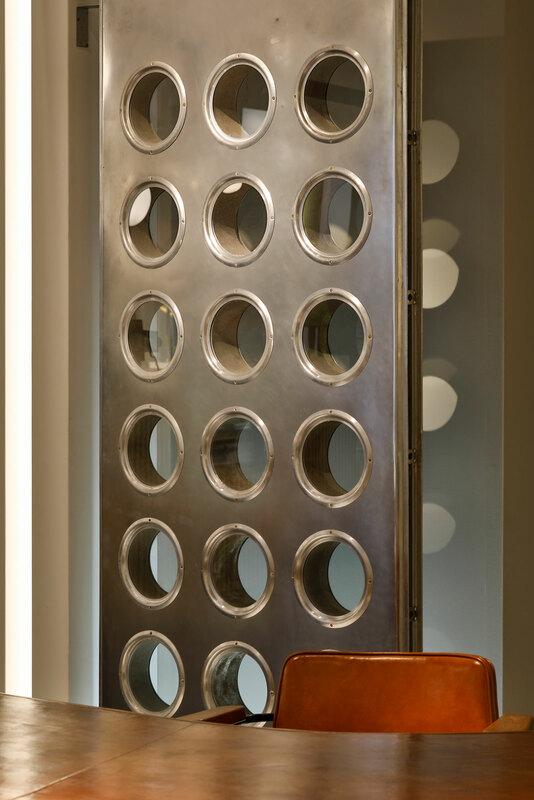 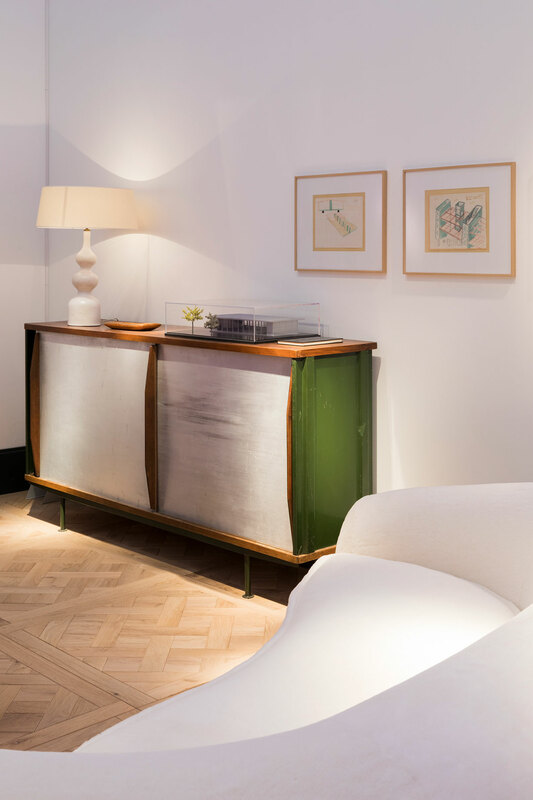 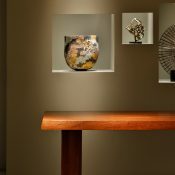 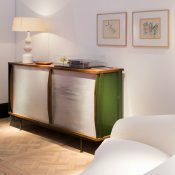 This way of displaying both art forms will show that old paintings of real quality look timelessly impressive in a modern setting and, conversely, the enduring, classic qualities of design furniture are reinforced by their dialogue with master paintings and sculpture. 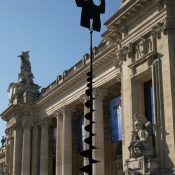 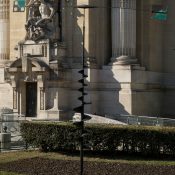 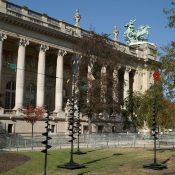 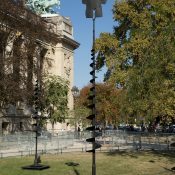 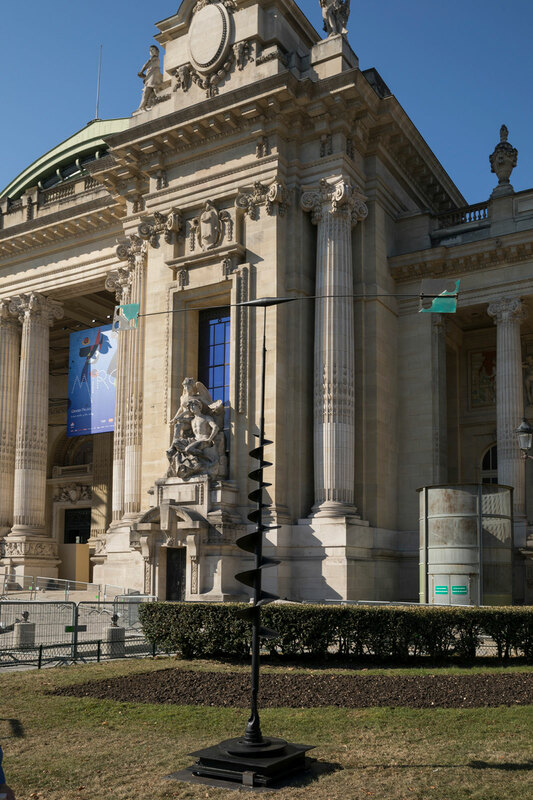 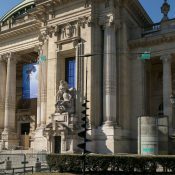 Vidéo du montage de l’exposition “Prouvé-Takis” à la Patinoire Royale, Bruxelles. 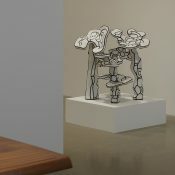 Korean artists and creators: Koreanism, like a new movement up for examination, another phenomenon to be defined. 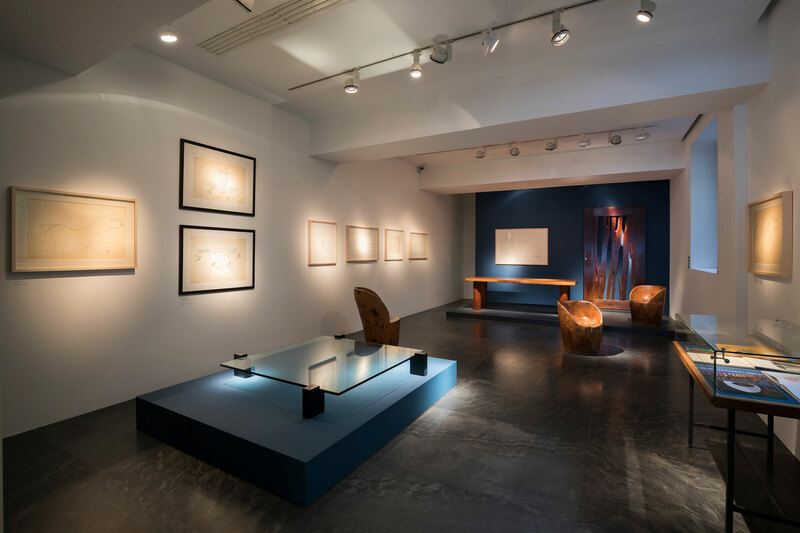 For almost 40 years, Choi Byung Hoon’s work has been illustrating this vitality and this inventiveness, together with the fact that it has also freed itself from national and ancestral traditions and aspired to a fully deserved universal dimension. 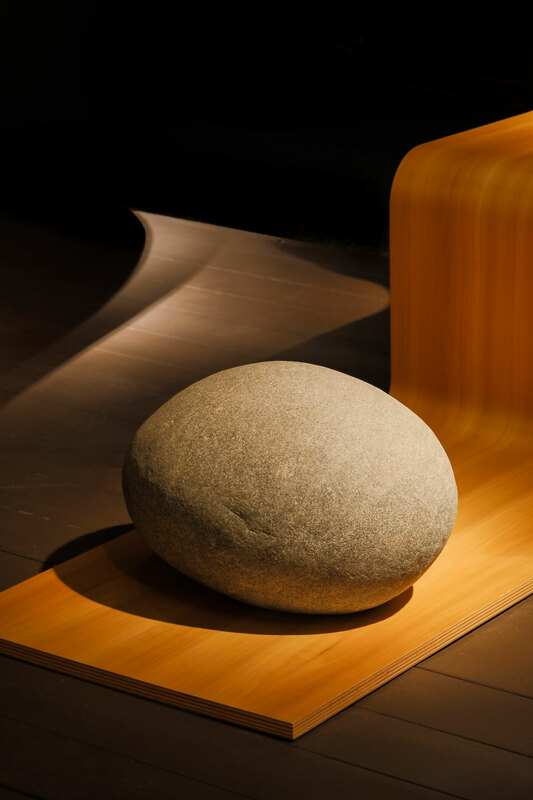 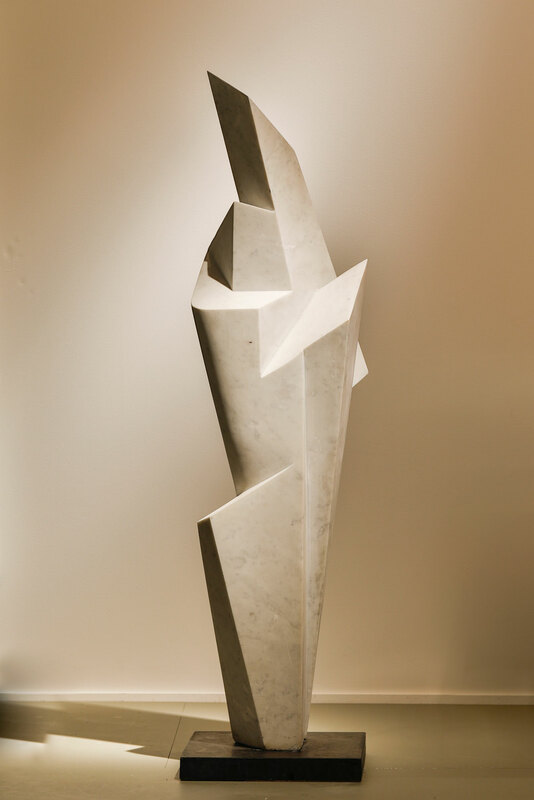 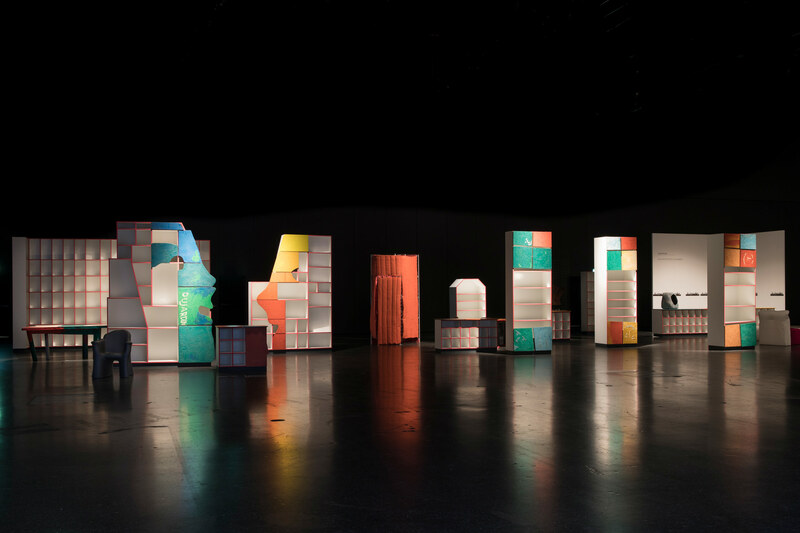 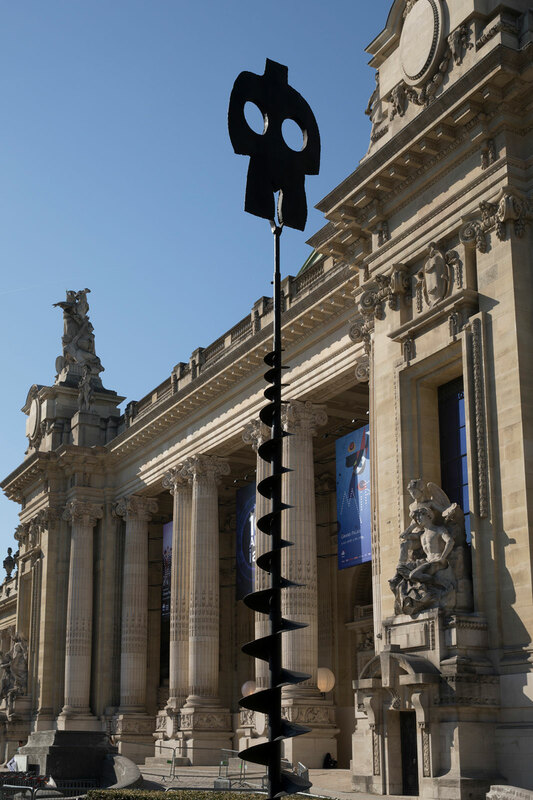 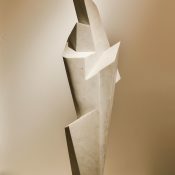 Interplays of balance and novel associations of forms of matter, involving objects and forms as much as possible sculptures, defying weightlessness, where wood and stone are emancipated from the laws of gravity in order to focus solely on the laws of grace, freer and more specific. 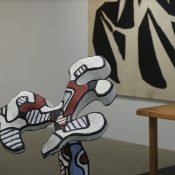 We might quote a few artist’s names with which to compare them, but doing justice to a creative artist also means sometimes taking him or her for what he or she is, the artist and the artist alone, and appreciating such artists for their works, without transcribing connections and genealogies. 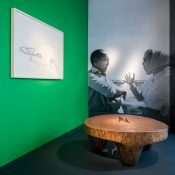 And only clinging to the obviousness of the work, its essence which weaves the precise bond to our universal history of modernity, the history which creates a linkage between the most removed of times and geographies: and here Asia, which is so vast, has been offering a liberating key since the mid-19th century, the key to a hierarchy-less art praxis in which painting—the noble art in the West—is no more essential than ceramics, lacqueur, mother-of-pearl, work on paper, calligraphy, and furniture. 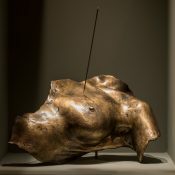 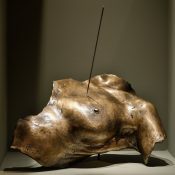 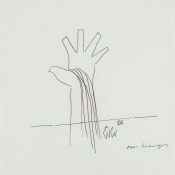 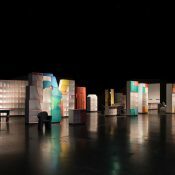 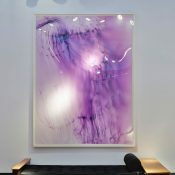 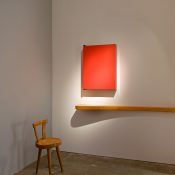 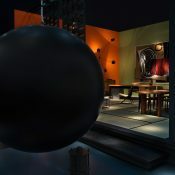 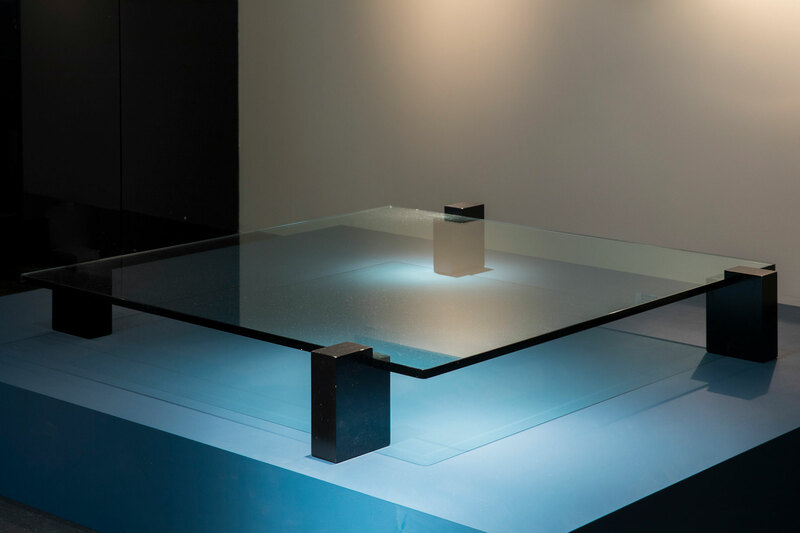 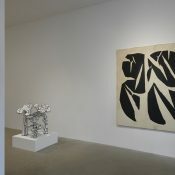 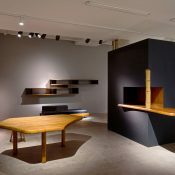 When, in Choi Byung Hoon’s case, we refer to that extremely vast oeuvre somewhere between art and design, it is indeed in this aesthetic and philosophical loam that its assumes its sense, with neither hierarchy nor marginality, but in the full page of a boundary-free creation, with neither sides taken nor priorities. 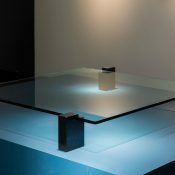 And this, too, is why it seems to us to be so naturally obvious today, with our contemporary eyes. 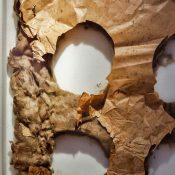 Because centuries, not to say millennia, have gone before upon this path, and they are telling us and re-telling us this particular obviousness.Over the decades, Choi Byung Hoon’s oeuvre has been revealing a formal repertory of a rare poetry, where the Spiritual in Art enchants a real and sincere rejuvenation, such as the greatest artists have been wishing for ever since Kandinsky. 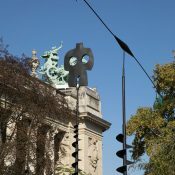 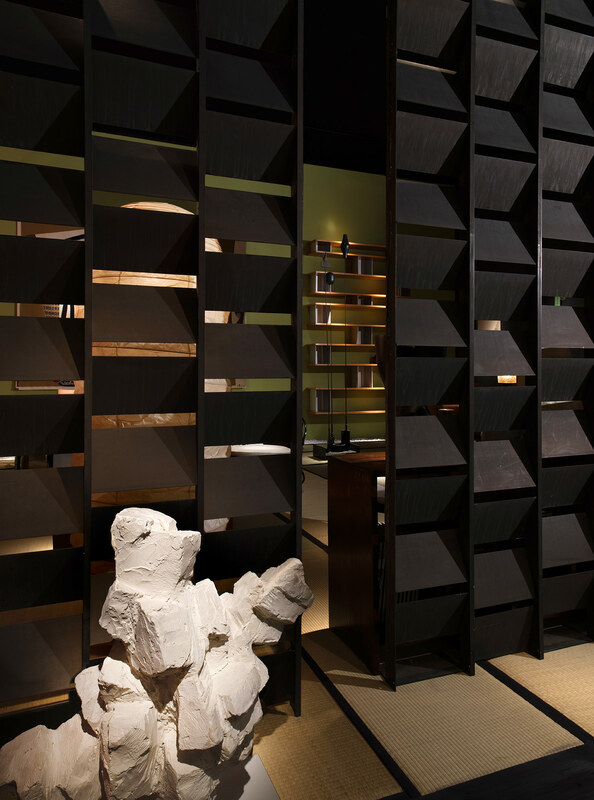 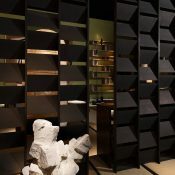 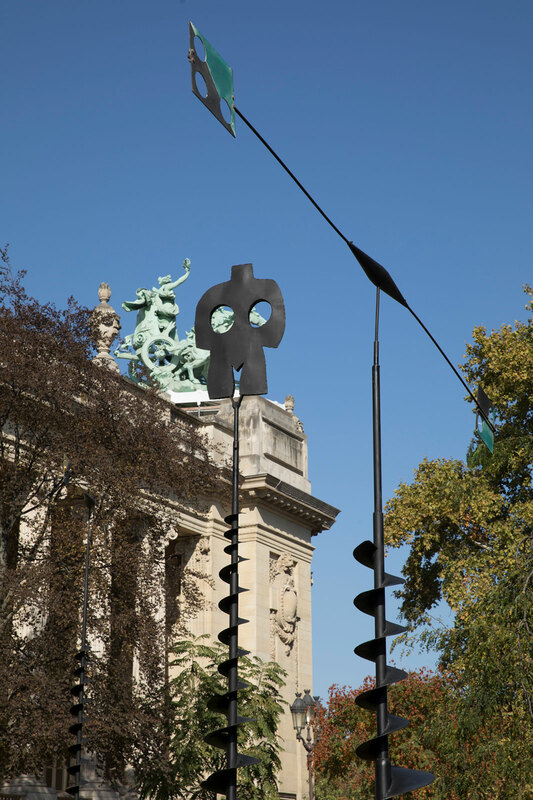 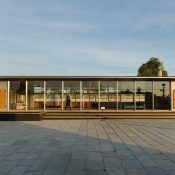 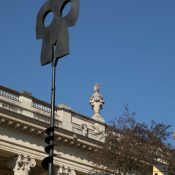 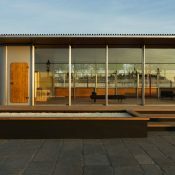 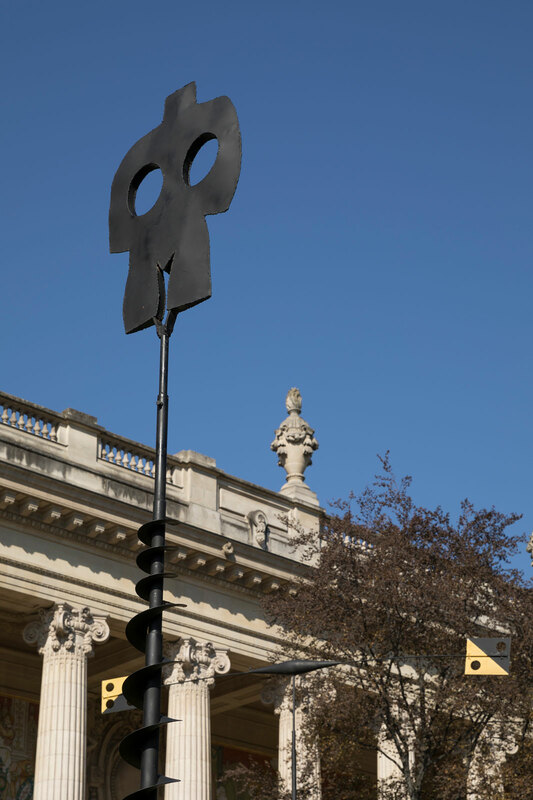 In an art which lets us meditate upon the intertwining of forms, the alliance of opposed and complementary forms of matter, where stone becomes an aerial punctuation, metal a comma with an unexpected graphic flexibility, and wood and ebony an organic architecture. 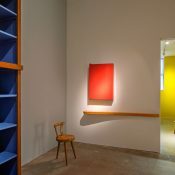 Looking at these works, from afar and close up, in the enclosed space of a house or set in the ups and downs of a landscape, is to accept to let oneself be amazed, a lowly and refined position, by these never precarious balances, long thought about and imagined, where nothing is left to chance, neither the choice of the striped or smooth effects of a piece of marble, nor the surface of granite, be it velveteen or harsh to the touch, nor the sensual roundness of ebony. 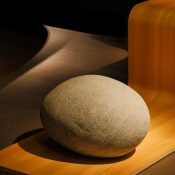 Each work has an original strength, something sacred and earthly. 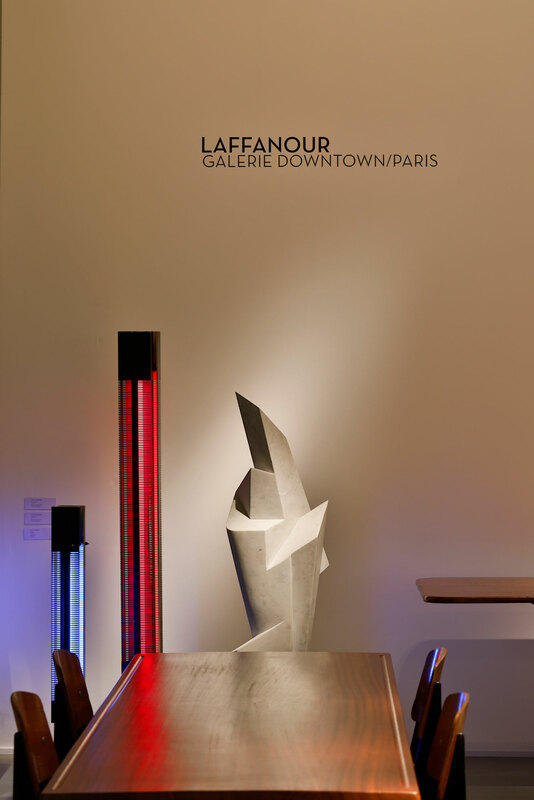 Vents au début du monde/Winds at the Beginning of the World, to borrow the title of a series of furniture sculptures which, since their first presentation, seduced the world of art lovers. 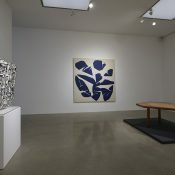 A visual strength which imbues them in the minds of those who have seen them, persistent images.Since the initial preparatory tasks for the recent exhibition Korea Now! 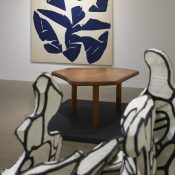 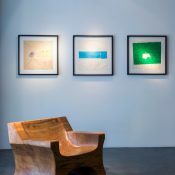 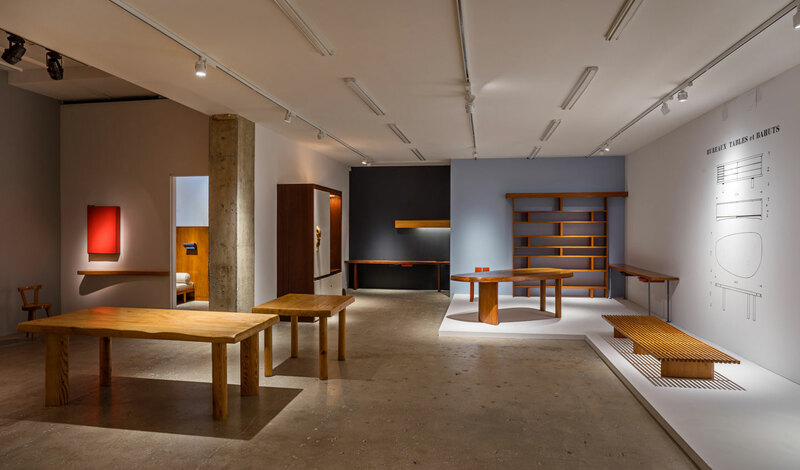 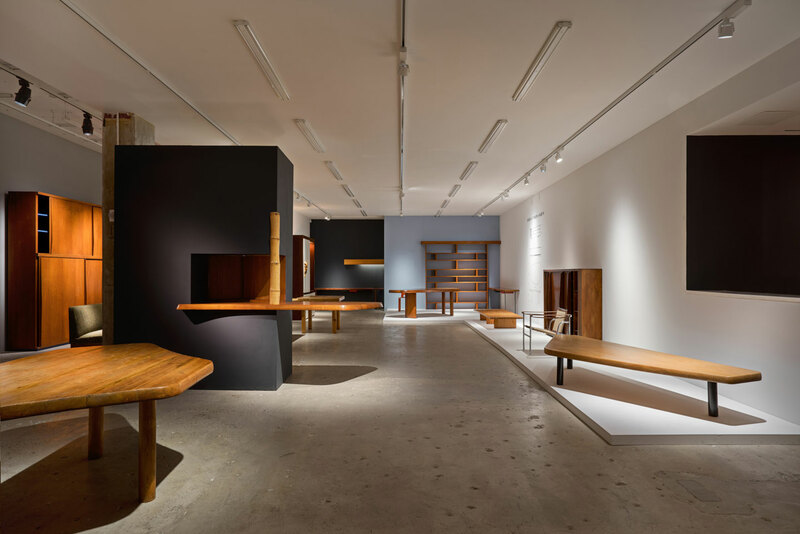 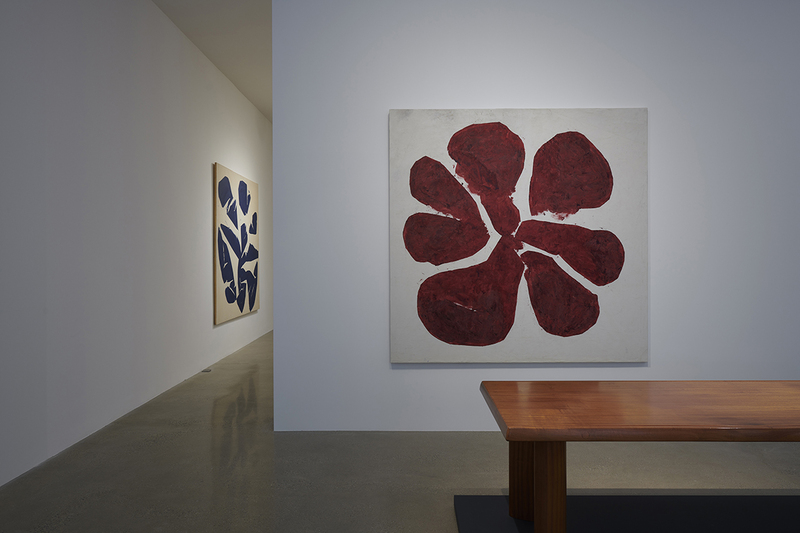 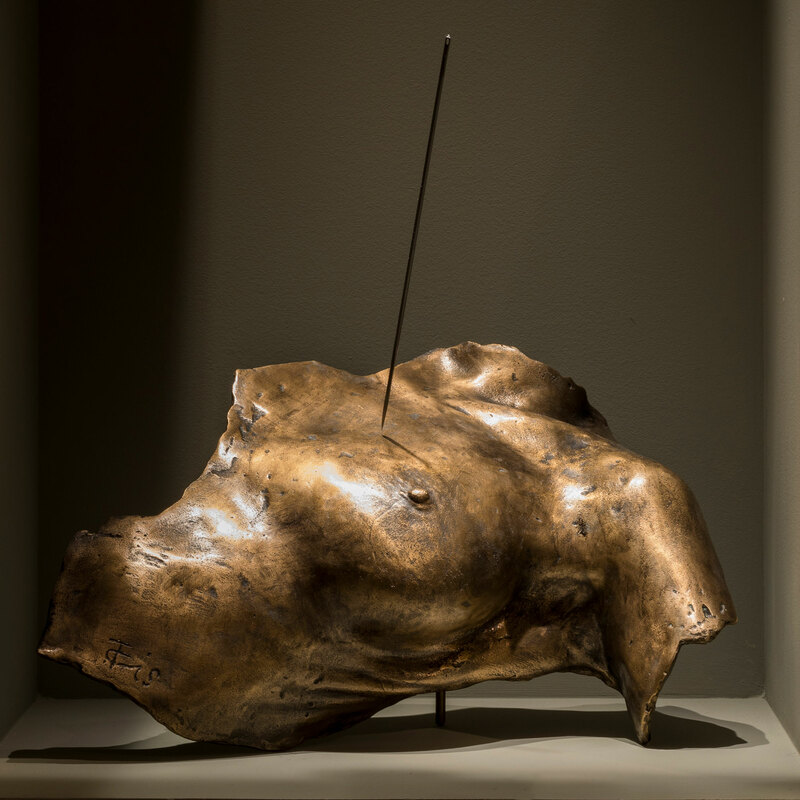 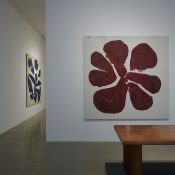 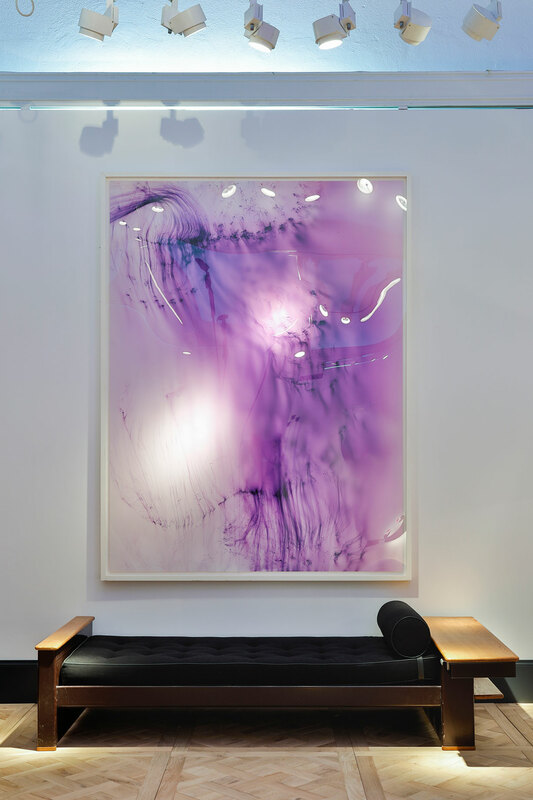 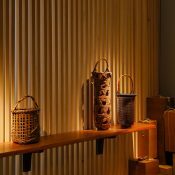 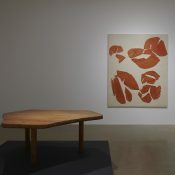 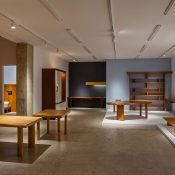 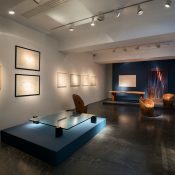 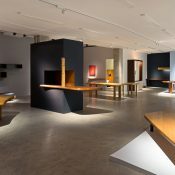 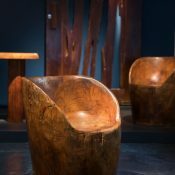 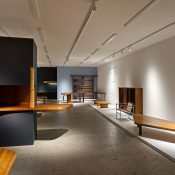 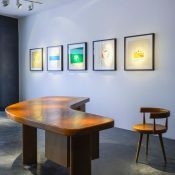 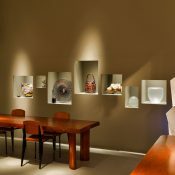 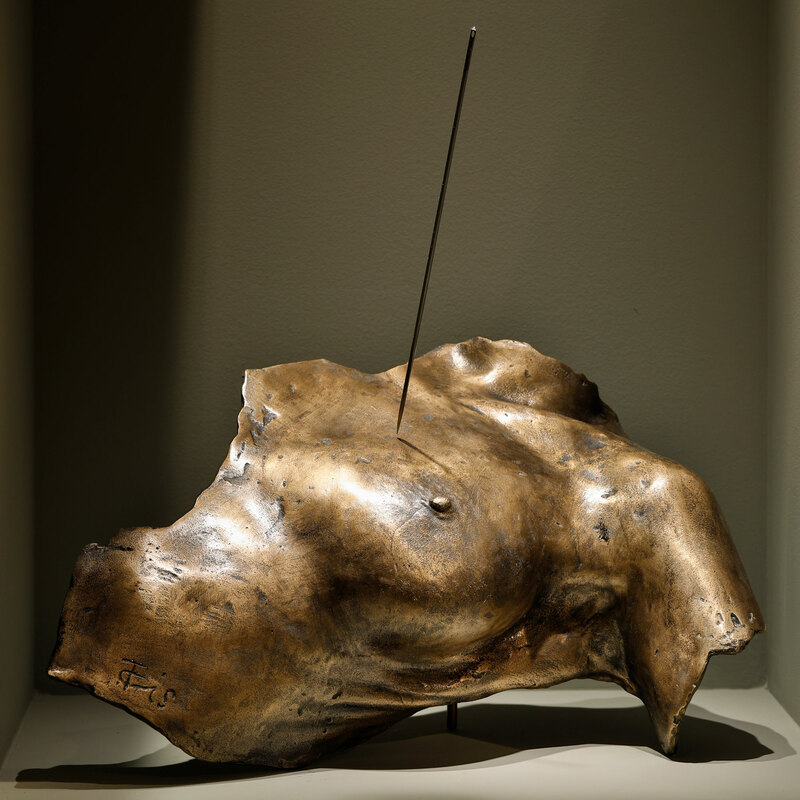 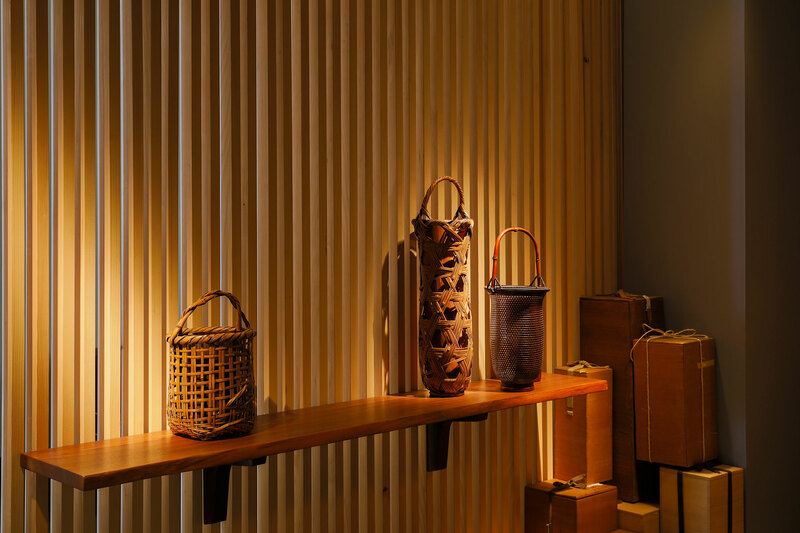 at the Museum of Decorative Arts, it seemed to us crucial to give pride of place to the work of Choi Byung Hoon, and two of his works welcomed visitors when they entered the museum’s nave. 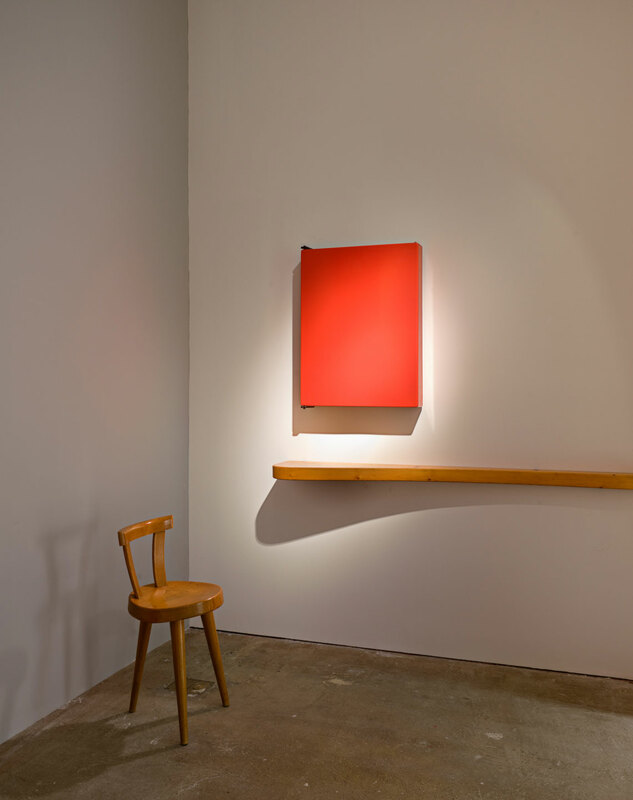 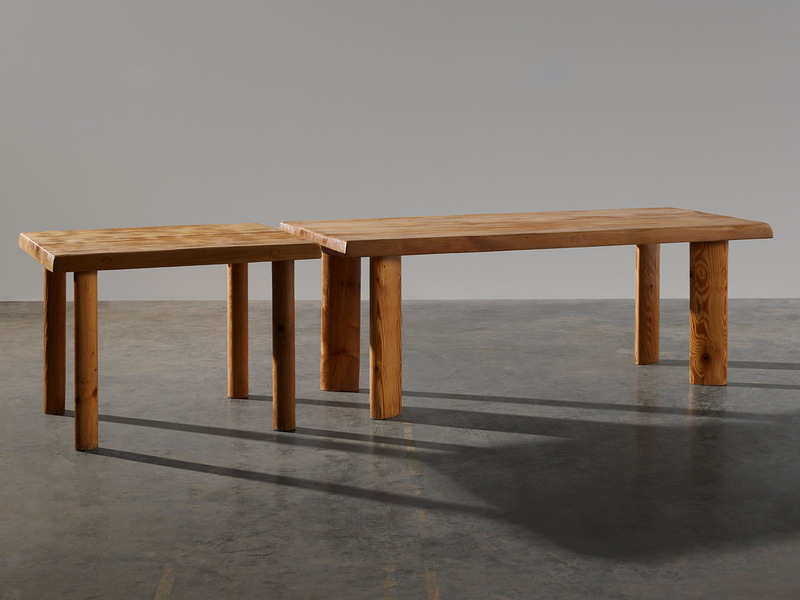 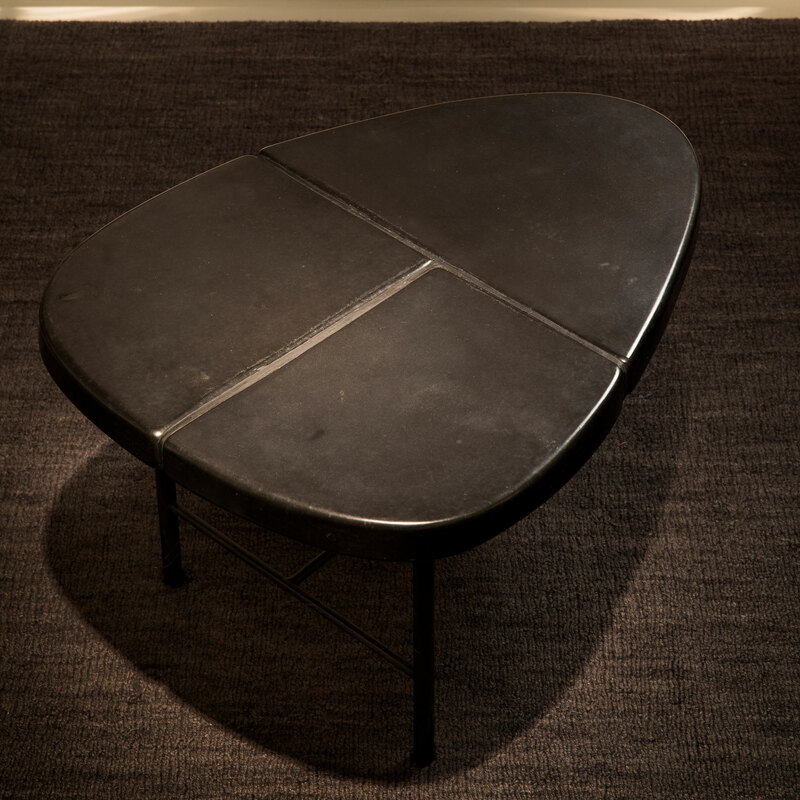 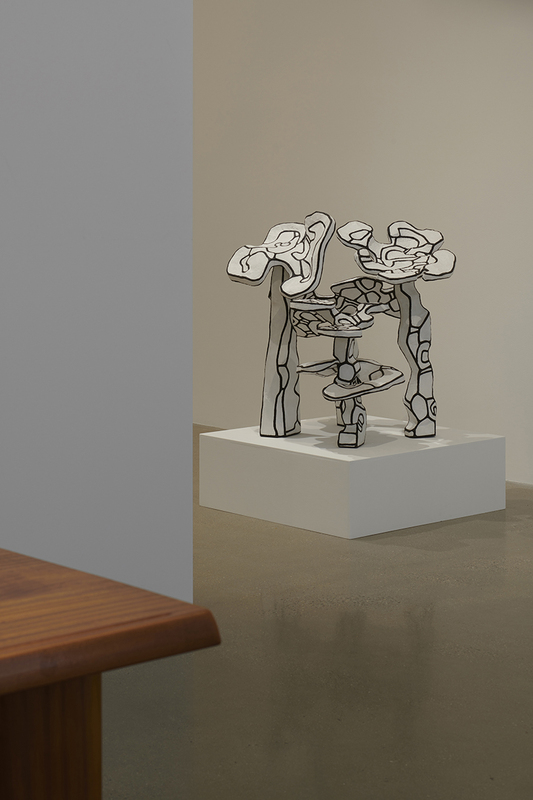 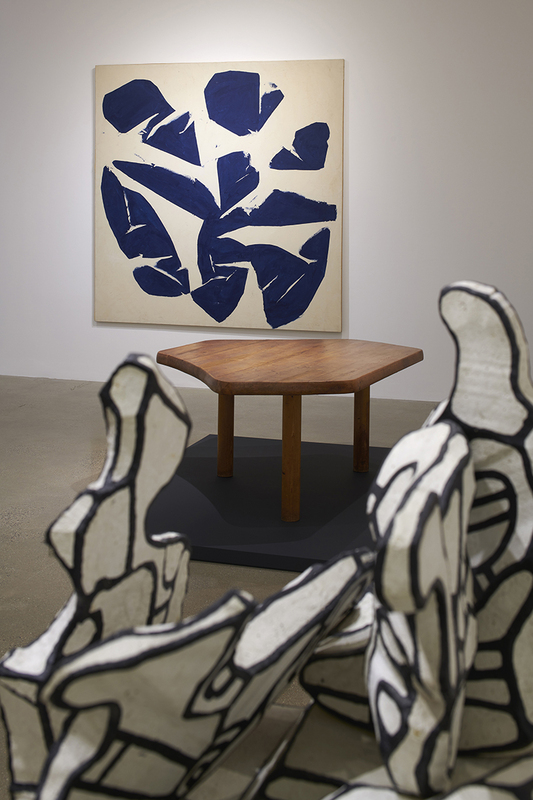 A table and a chair, made in 2008, in the series Afterimage. 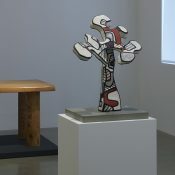 During the very first days of the show, Choi Byung Hoon and François Laffanour told me about their desire to offer one of his pieces to the museum, and it will join the collections within a few weeks. 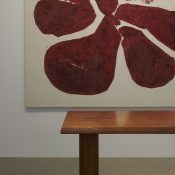 The admission of a new work in the collections of a museum—especially when the museum was founded more than 150 years ago to encourage creation and nurture artists’ imaginations—is always an adventure per se, a special moment, because it attests to a day and age, an art movement, and the specific nature of a creative career; and because it can display, teach and enlighten; it can also create reflection and enthusiasm about a vocation. 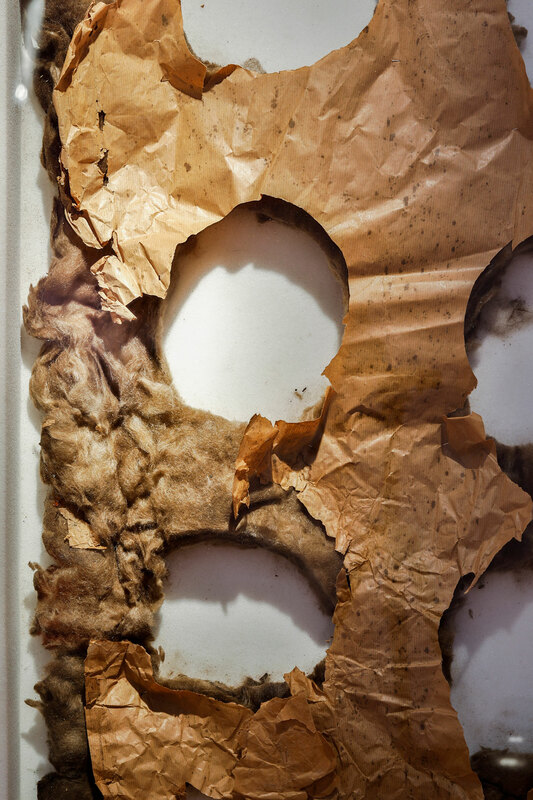 With Choi Byung Hoon, it also rediscovers its ancient and vital brief—becoming the stuff of our dreams. 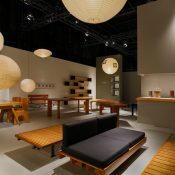 He then thought about the installation of the dwelling, and in no time came up with the idea of a commercial company which would sell all the elements of home equipment. 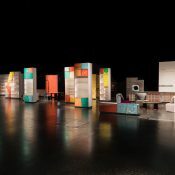 They would be mass produced, to standard measurements, to meet the many different needs of a rational set of furbishings: windows, doors, standard racks serving as cupboards and forming part of the partition walls… The Citrohan No 2 House, the model of which was exhibited at the 1922 Autumn Salon, was the first complete prototype of the “machine à habiter”. 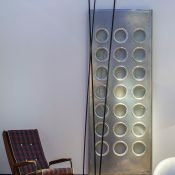 Le Corbusier declared: “There is nothing shameful about having a house which is as practical as a typewriter”. 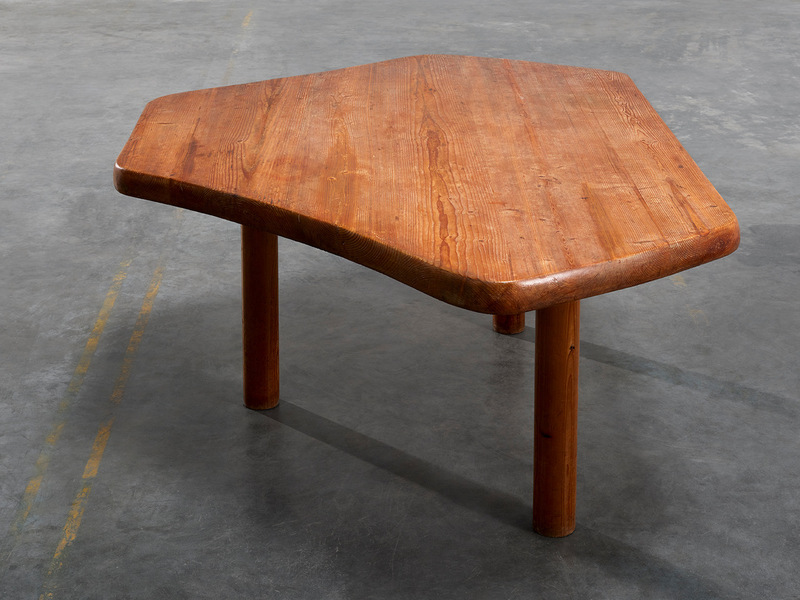 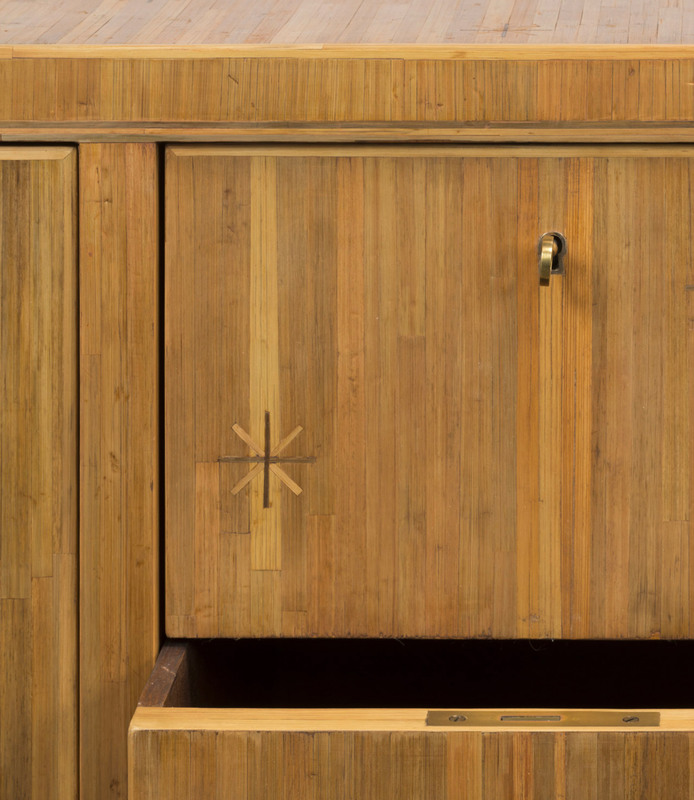 “Furniture is a servant”, he announced, seven months before he met Charlotte Perriand. 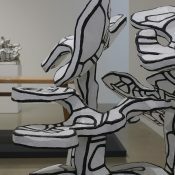 He had sketched out “the different ways of sitting which seats had to be adapted to”. 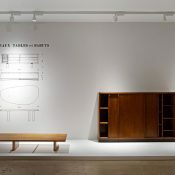 He drew his ideas from the range of Maple & Co. furniture and Thonet seats, which he regarded as standard objects; and he also drew inspiration from technical furniture for sick and injured people in his “sitting machines” programme. 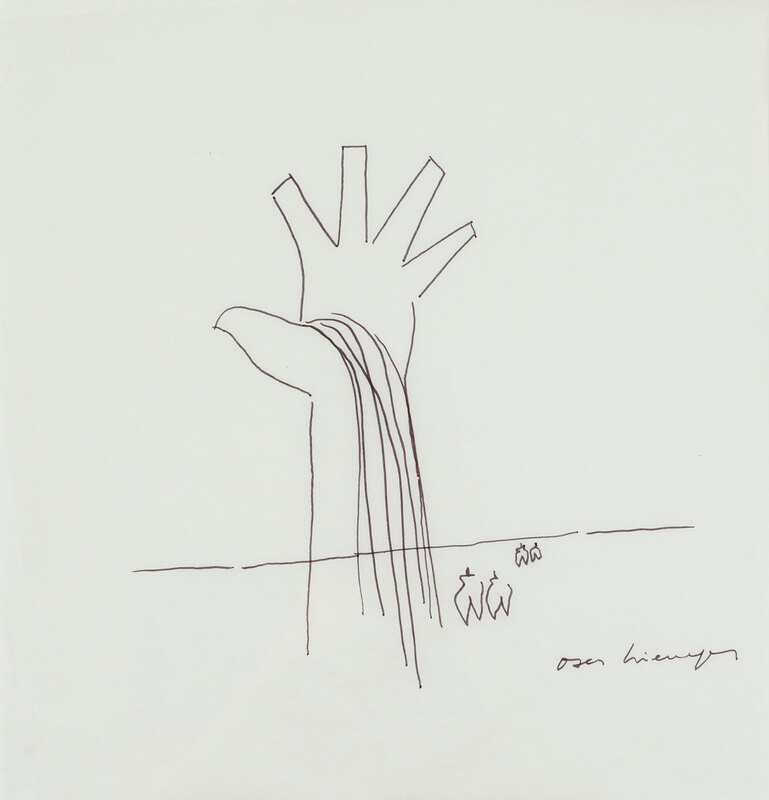 He drew up the basic diagrams. 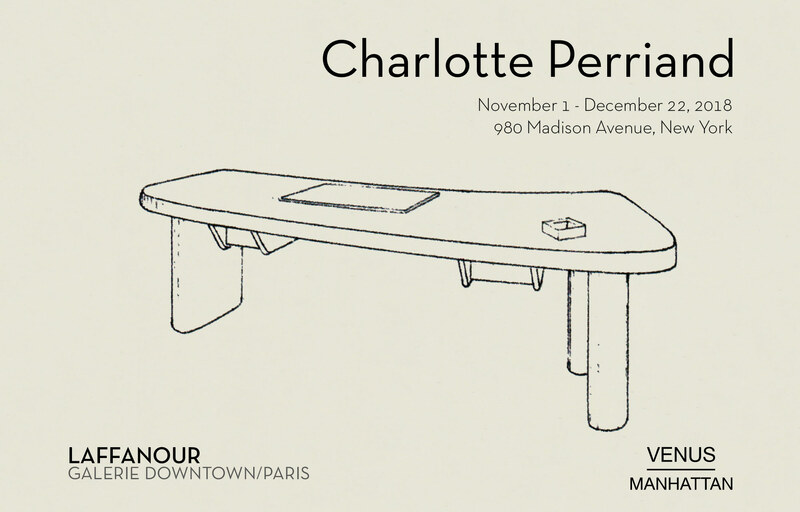 When she joined Le Corbusier’s agency in 1927, Charlotte Perriand took up the theoretical programme “of racks, chairs and tables” developed since 1924 with Pierre Jeanneret. 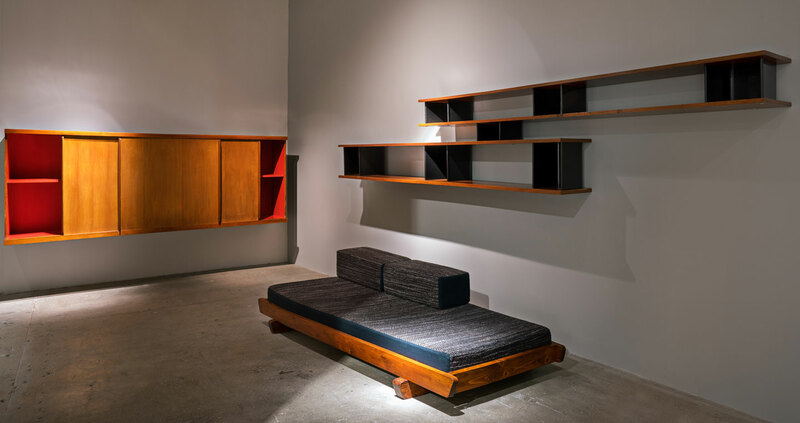 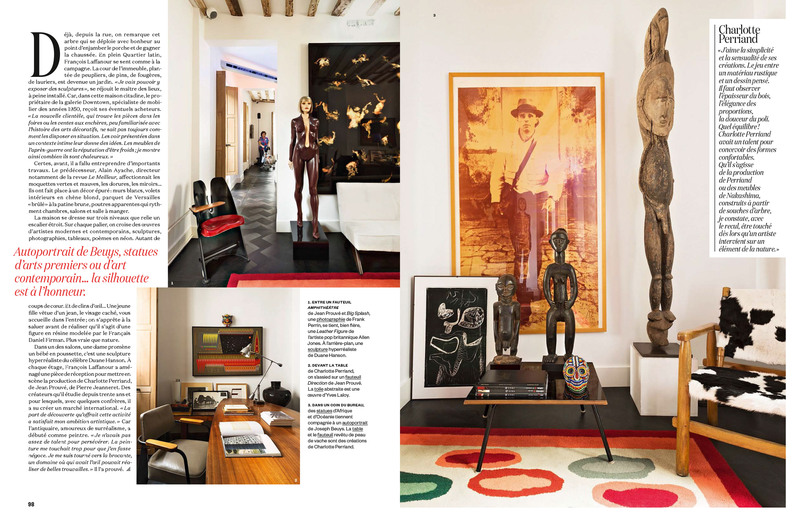 “Le Corbusier expected me to give life to furniture”. 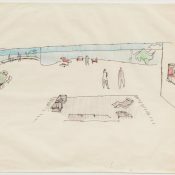 Le Corbusier provided the avenue of research, then she took charge of producing the plans and making the equipment. 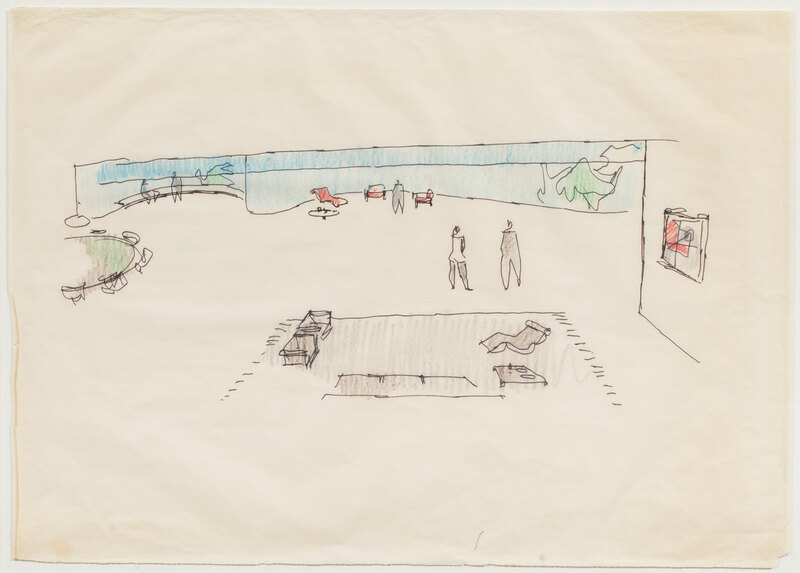 The history of the lounge chair conveyed the master’s approach. 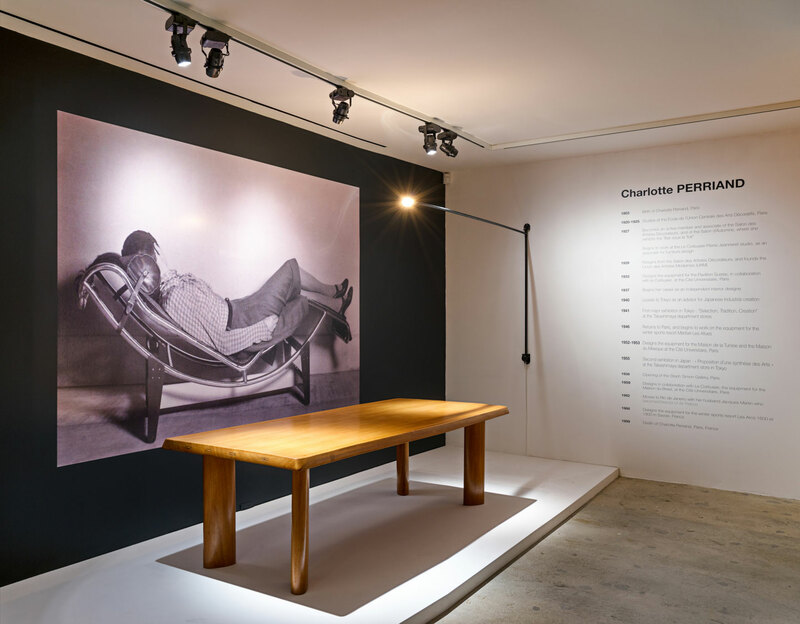 First of all, he set about studying William Morris’s chaise longue/easy chair, then Dr. Pascaud’s “Surrepos” chaise longue, all tentative research; Charlotte Perriand then finalized the studies and drawings, so the work involved a collaborative method. 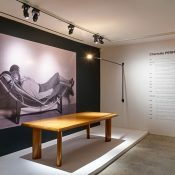 Le Corbusier devised and drew up the programme with Pierre Jeanneret; he was the investigator, while Charlotte Perriand was indisputably the kingpin. 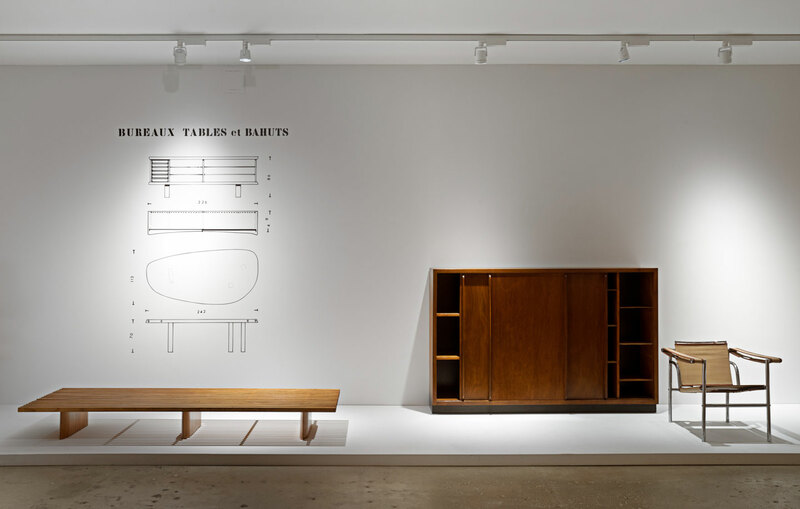 The programme “of chairs and tables” was finalized in the autumn of 1928, while the racks, the last element of Le Corbusier’s trilogy, were still on the drawing board. 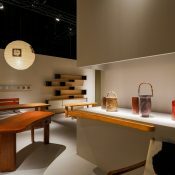 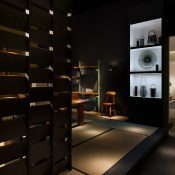 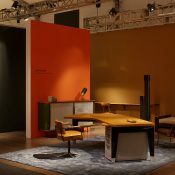 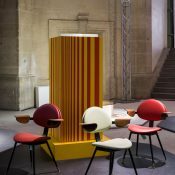 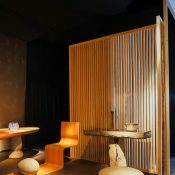 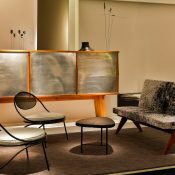 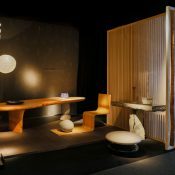 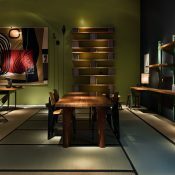 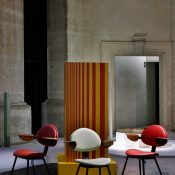 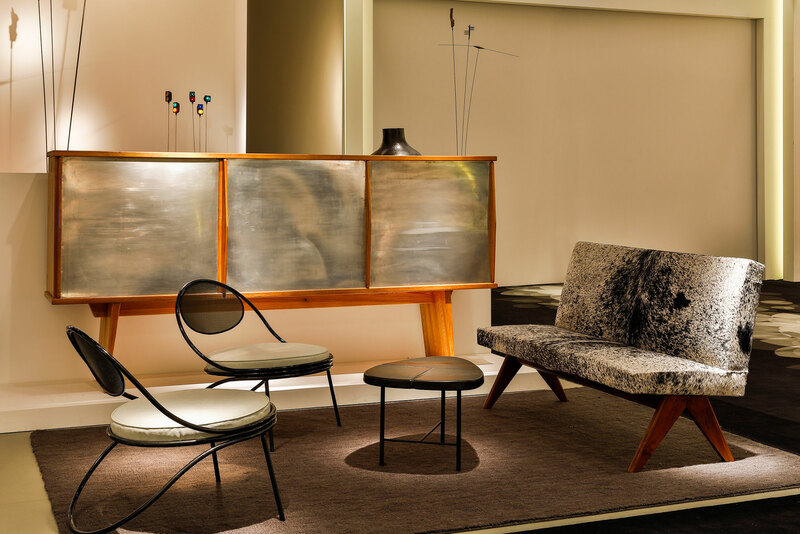 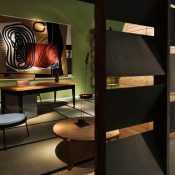 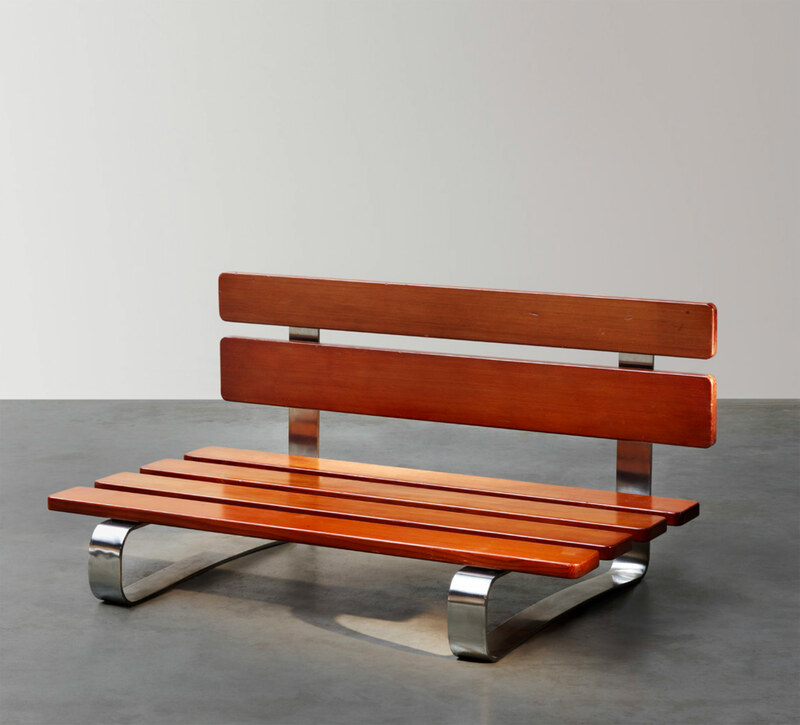 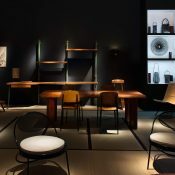 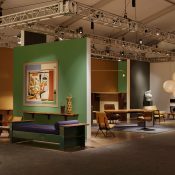 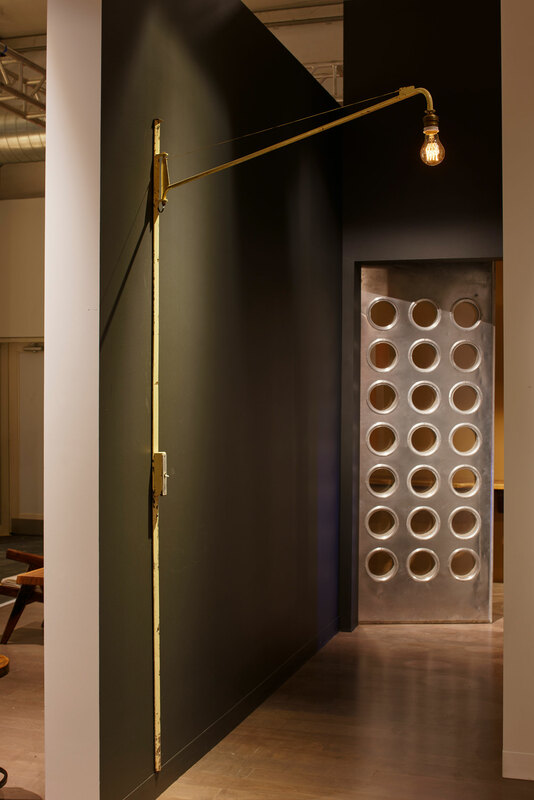 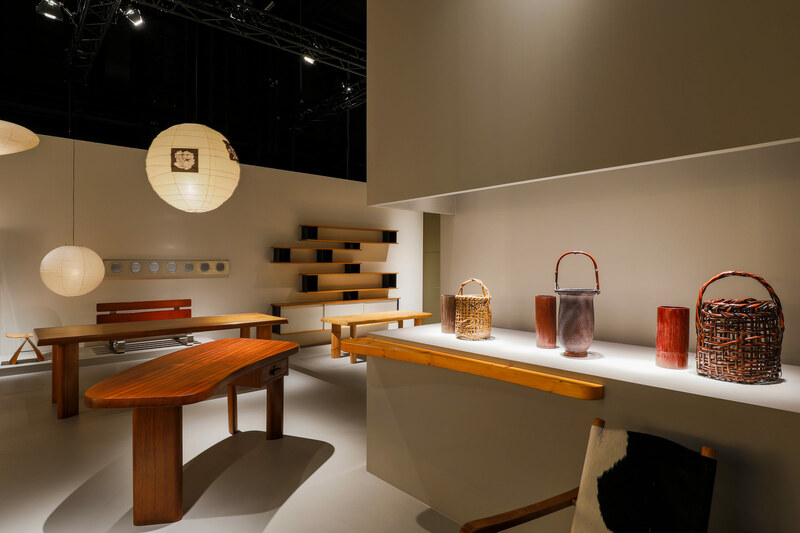 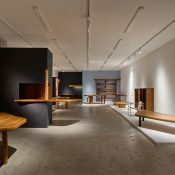 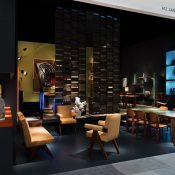 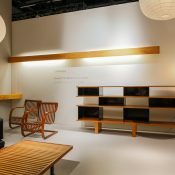 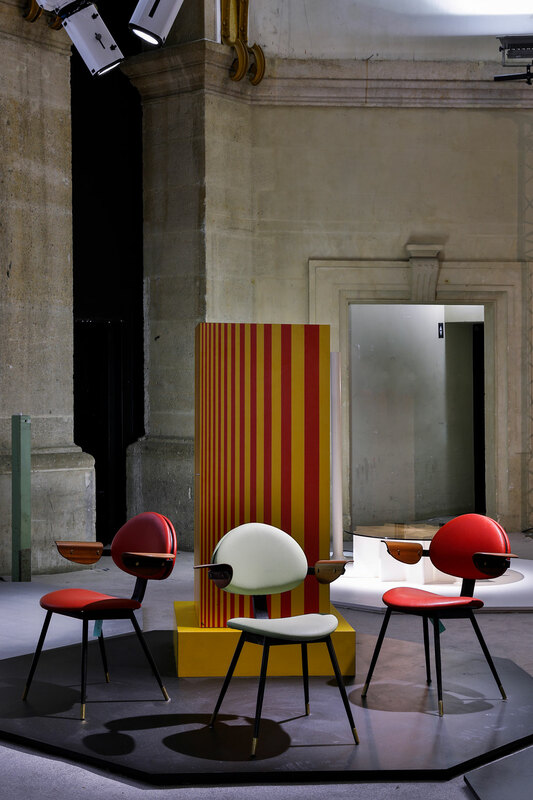 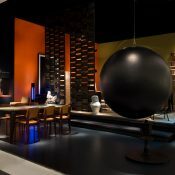 Charlotte Perriand designed them in metal, borrowing the concept of the wooden racks created in 1925 by Le Corbusier and Pierre Jeanneret, for the Esprit Nouveau Pavilion. 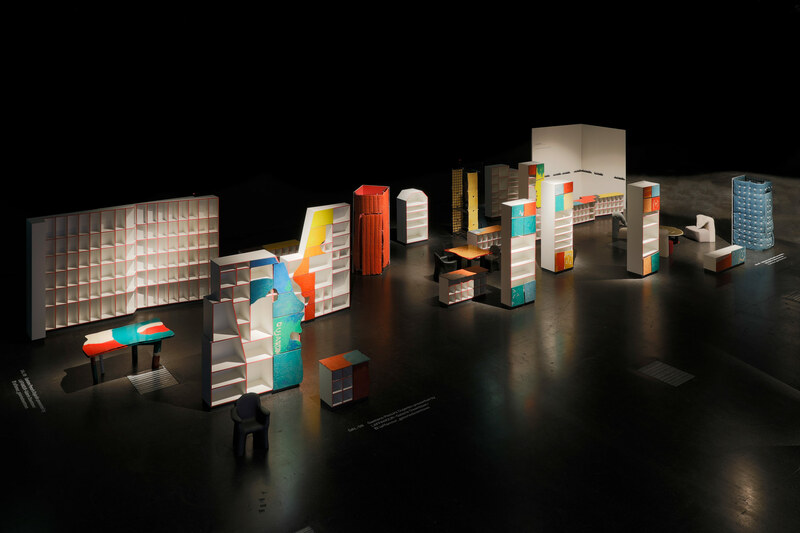 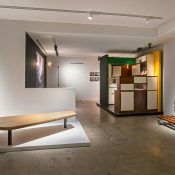 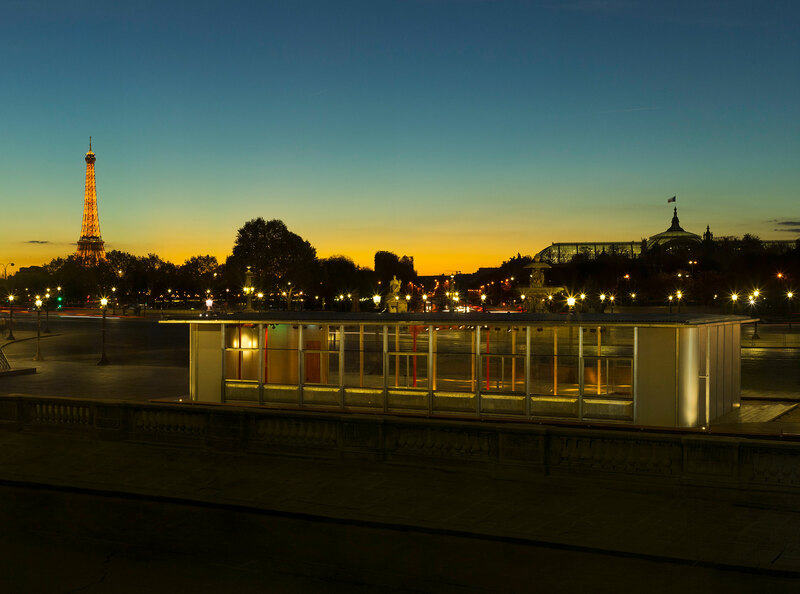 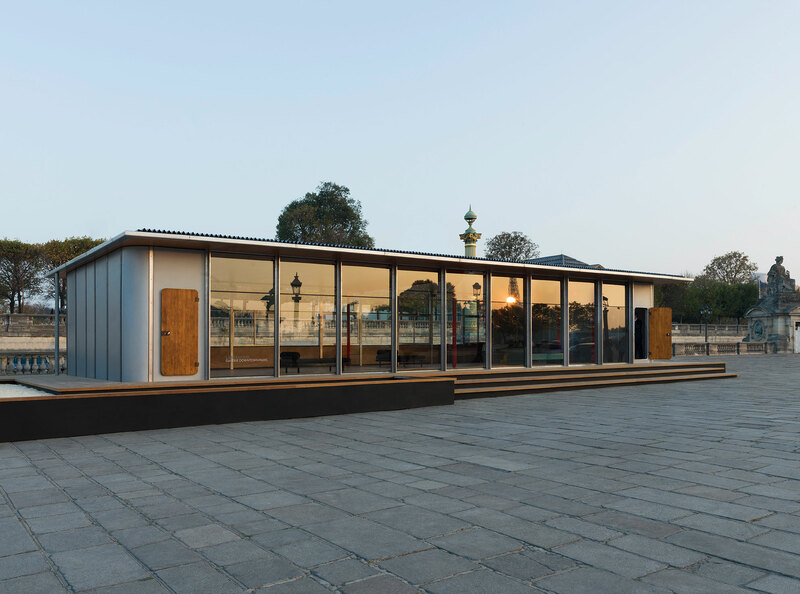 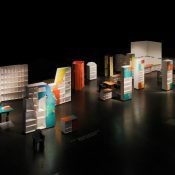 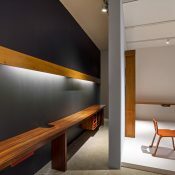 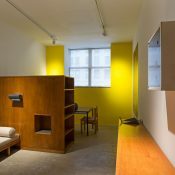 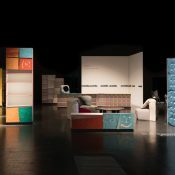 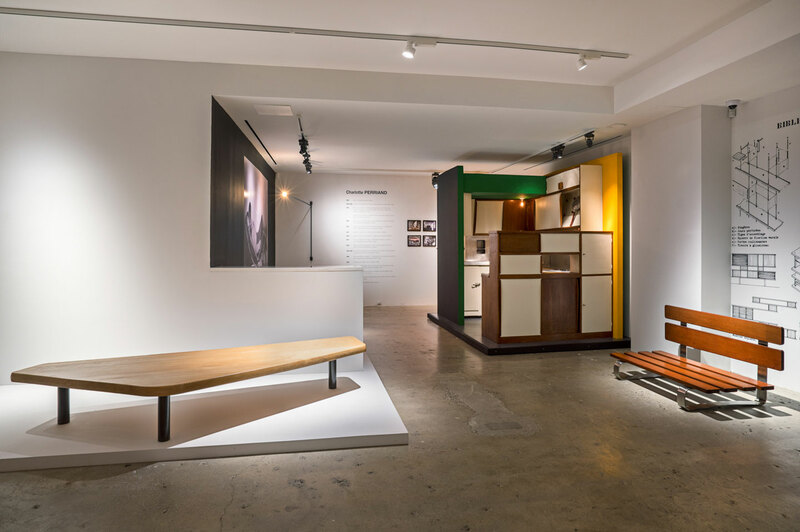 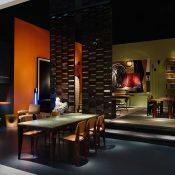 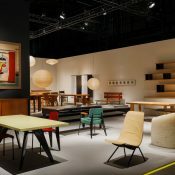 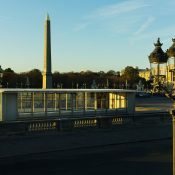 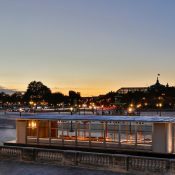 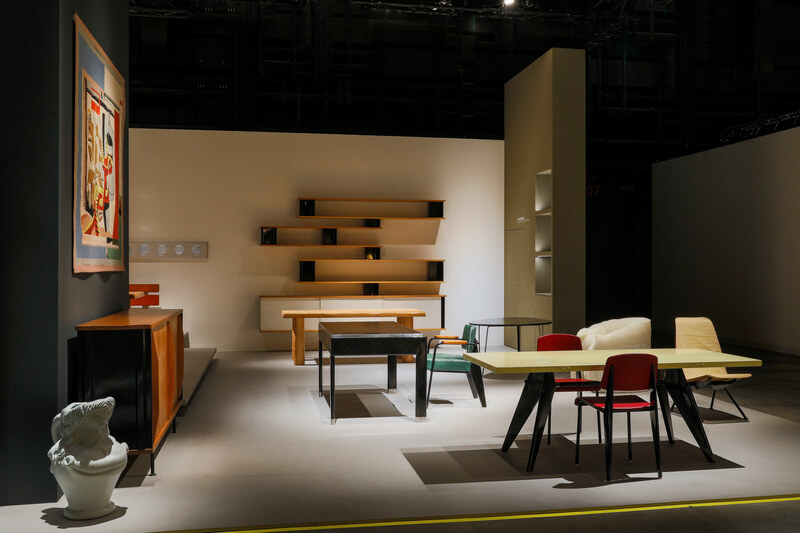 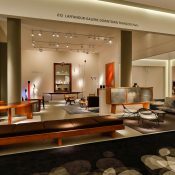 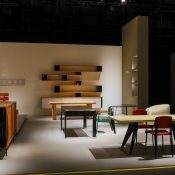 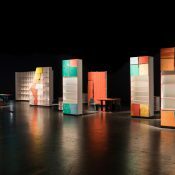 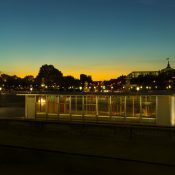 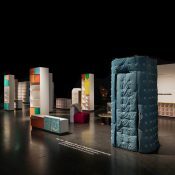 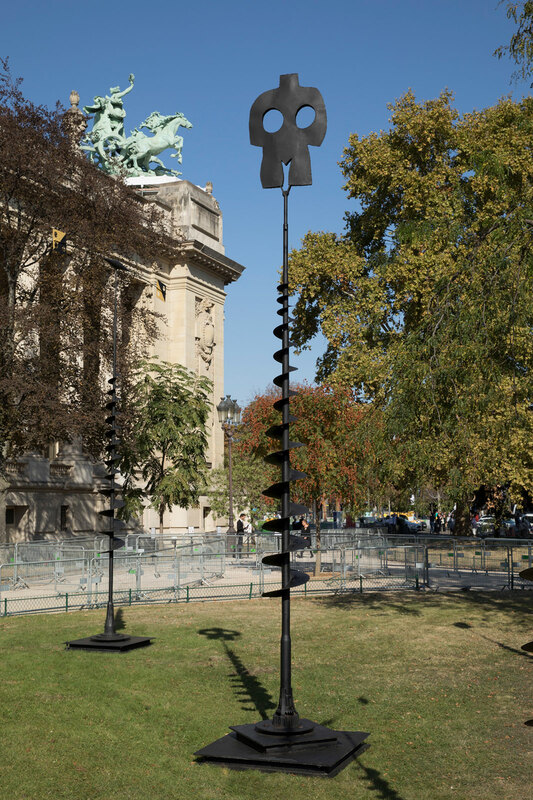 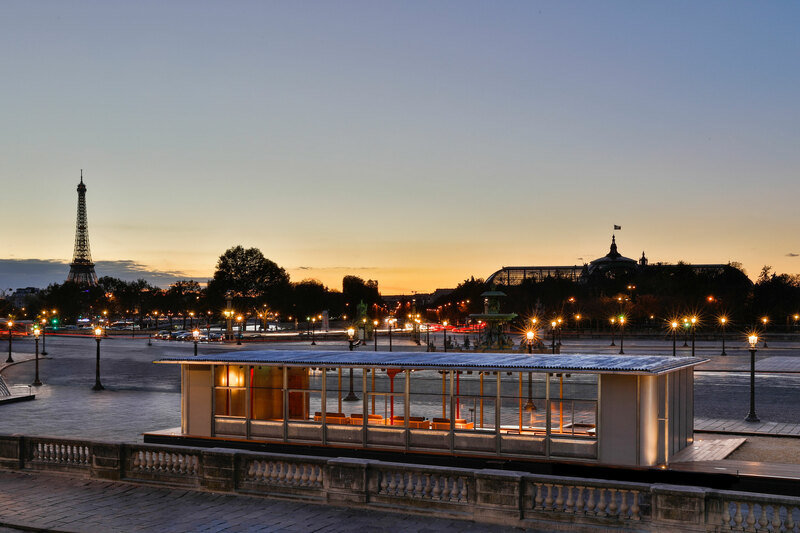 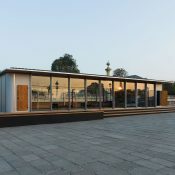 For publicity purposes, the Thonet company financed the first exhibition of the programme L’équipement intérieur d’une habitation in an area of 100 sq. 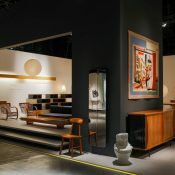 m./1,100 sq.ft, at the Salon d’Automne in December 1929. She provided the racks and found herself associated with all the publications mentioning the furniture… It was a period of struggle and involvement. 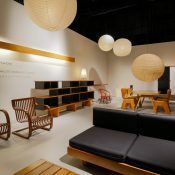 The mass-produced edition would finally be taken on by Thonet. 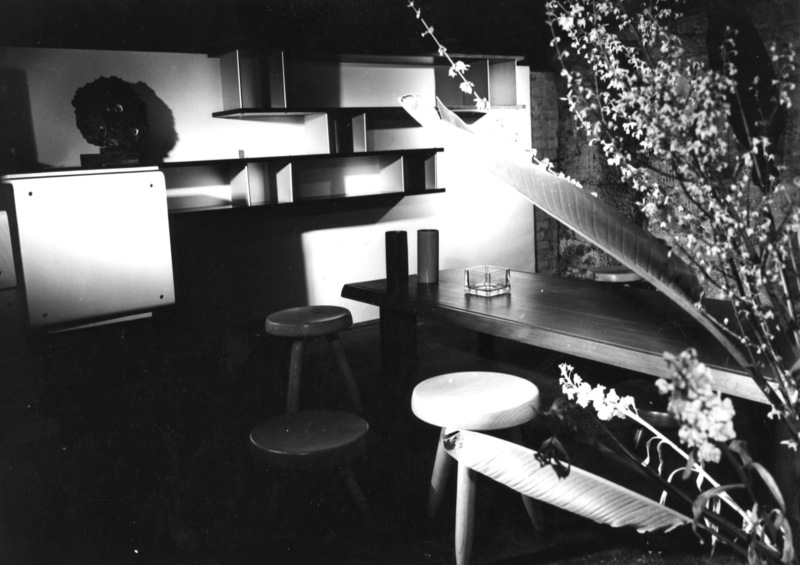 The furniture was also designed for private homes, as part of the architecture programme. 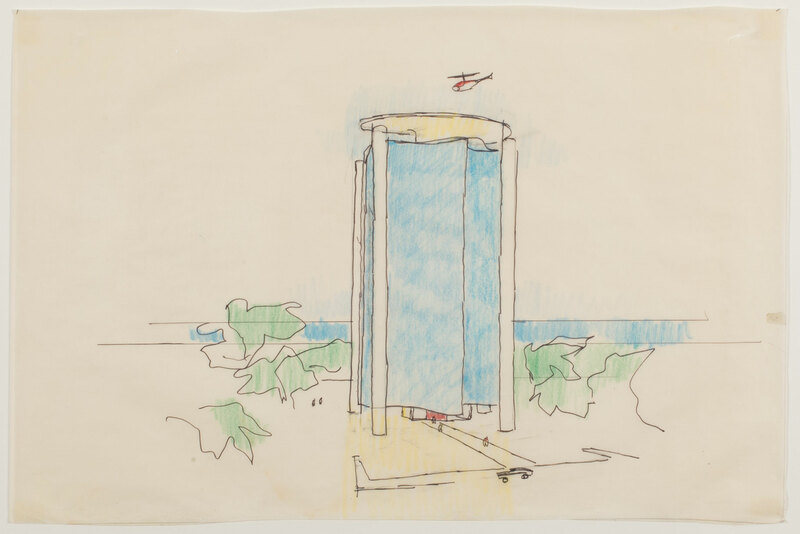 Immediately after the war, Le Corbusier finally achieved his vision of the vertical city (1945-1952) with the Unité d’Habitation in Marseilles. 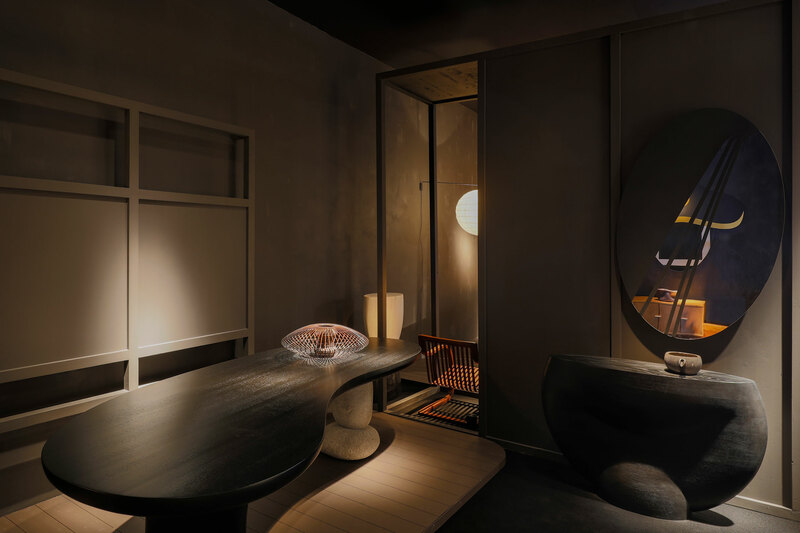 The apartments with their double east-west orientation, arranged on two levels, had a double-height living room, while the furnishings were carefully designed to rationalize the space. 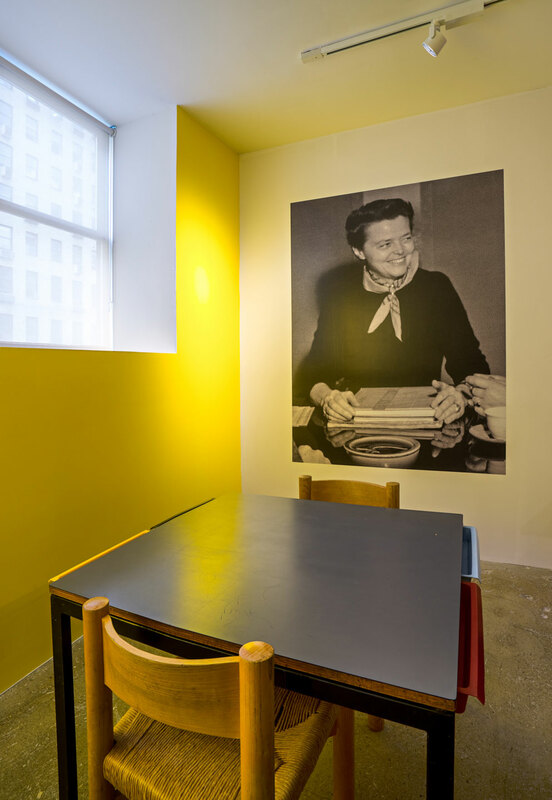 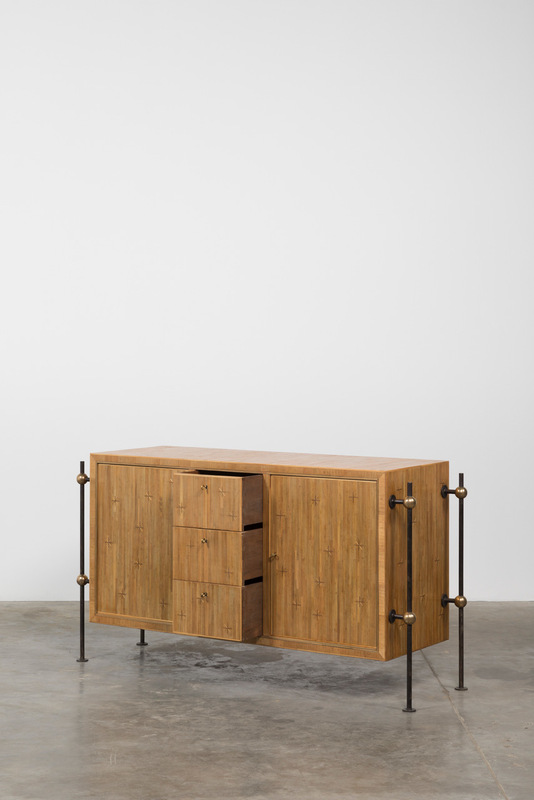 Charlotte Perriand was once more called upon for the cell-type furniture (1947) and the kitchen, (1947-49). 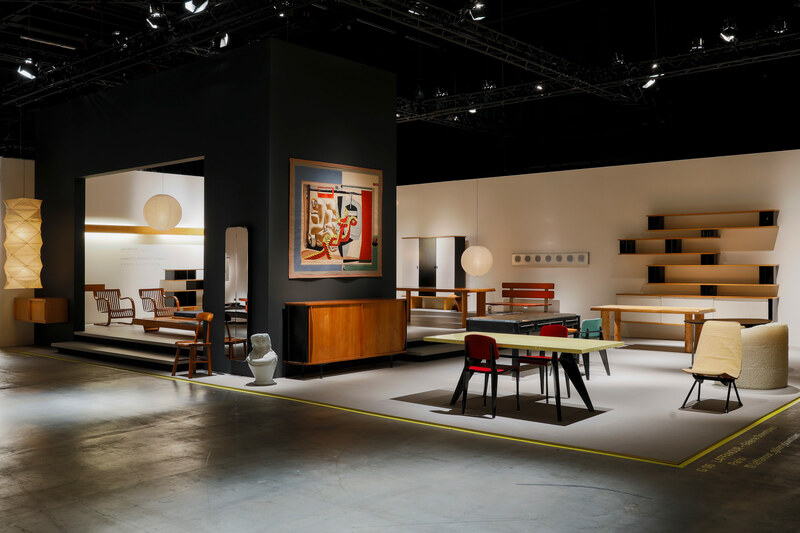 She presented the whole thing at the Salon des arts ménagers (household arts) in the “Habitation” section in 1950. 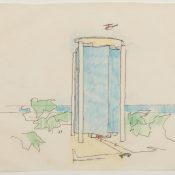 The roof terrace proposed collective furnishing, children’s gardens, and swimming pools. 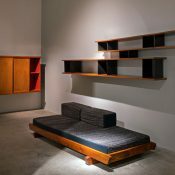 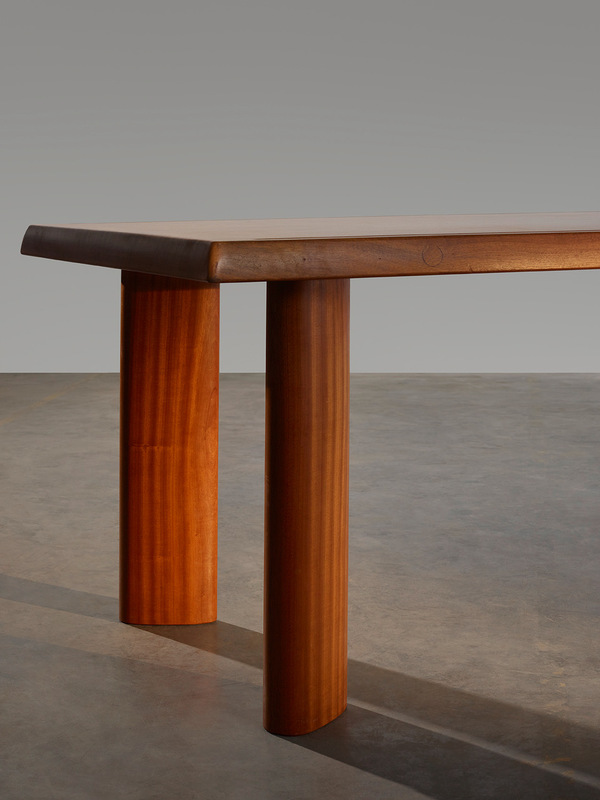 The notion of “standards” was probably the greatest innovation made by Le Corbusier, Pierre Jeanneret, and Charlotte Perriand, perfectly adapted to requirements. 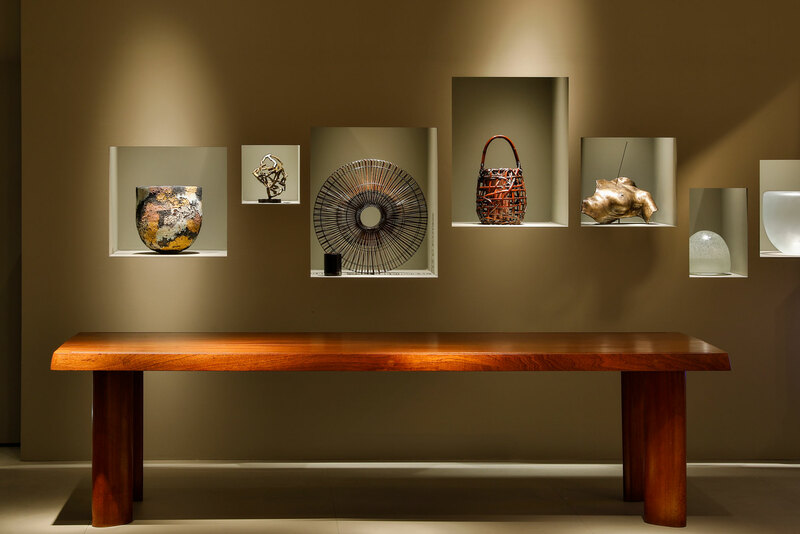 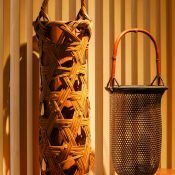 Paradoxically, their origin lay in the classical tradition and the anonymous production of popular arts and crafts. 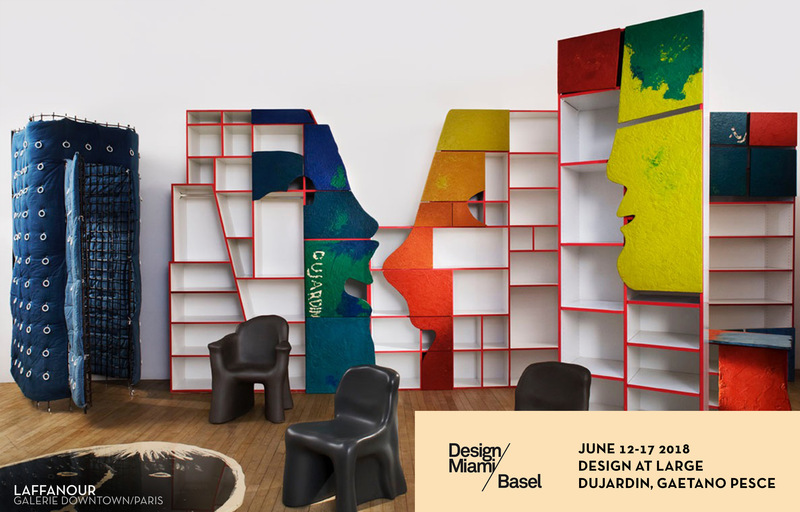 From June 16th to June 21st 2015. 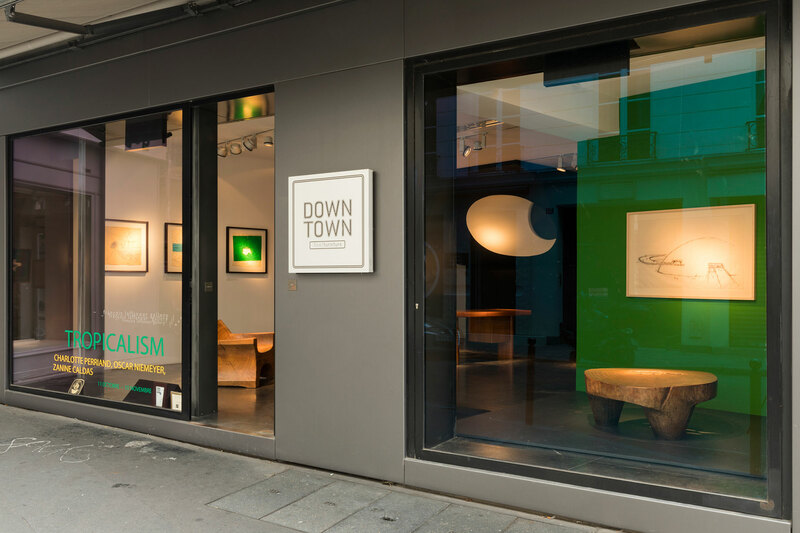 Photos © Marie Clérin – Galerie Downtown François Laffanour.